2019 Spring Menu Debuts March 27th! In hopes that the weather will be warming up soon, our culinary team is hard at work developing our NEW Spring Menu, which will debut at all Miss Shirley’s Cafe locations on March 27th! This season, sip on fresh flavors like our new Cucumber Basil Mojito with Cucumber Lime Vodka, Fresh Watermelon, Basil & Mint; or a Mango Coconut Crush with Mango Vodka, Triple Sec, Coconut Milk, fresh Lime & Orange Juice. And, if you need a little extra energy, our new Wake Up Call coffee cocktail will definitely do the trick, with Triple Shot Espresso Vodka, Cold Brew, Coconut Milk & Chocolate Syrup. 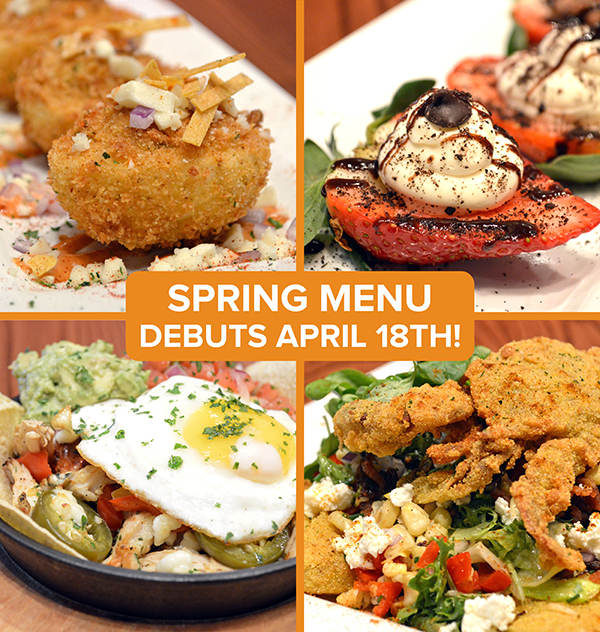 "View Entire Post" to check out the rest of our Spring Menu Sneak Peaks! You voted on social media, and we listened! 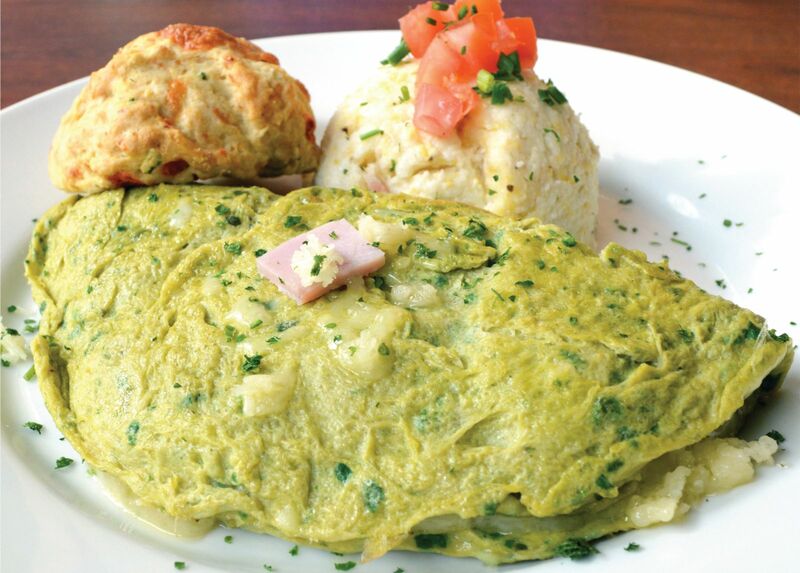 To celebrate St. Patrick's Day, Miss Shirley's Cafe is all about the GREEN this March. 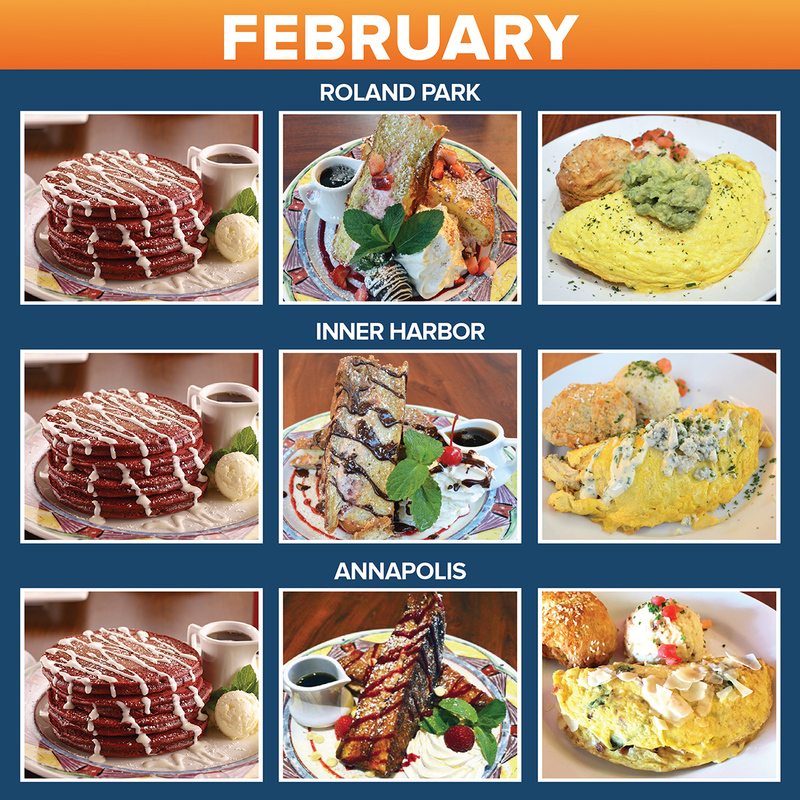 All locations will be featuring our Green Eggs & Ham Omelet, as well as other fun options like Mint Chocolate Cheesecake Stuffed French Toast with Green Whipped Cream in Roland Park, and green Mint Chocolate Pancakes at the Inner Harbor. 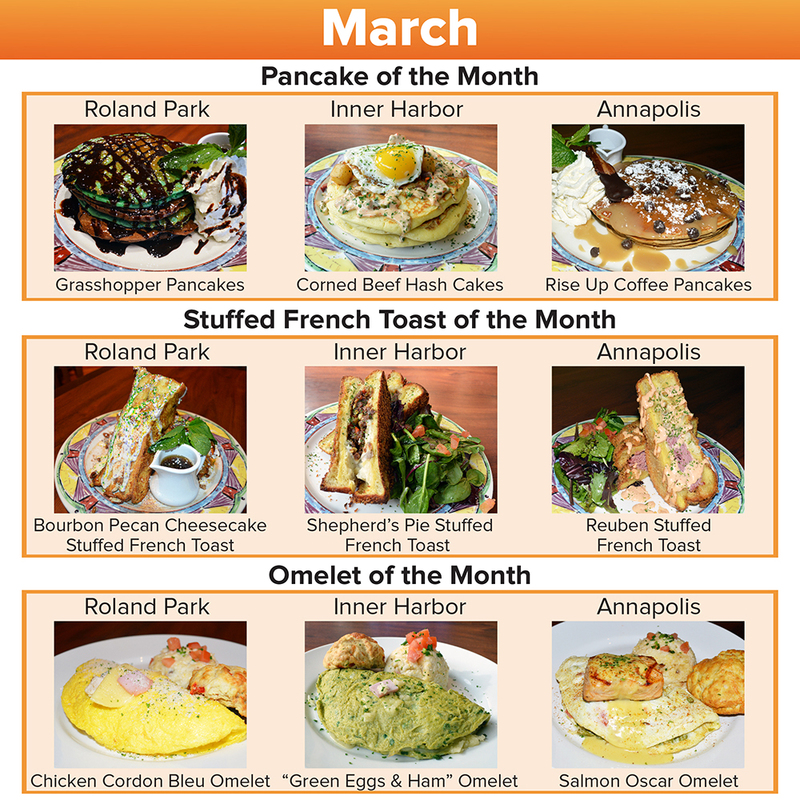 "View Entire Post" to check out the rest of our March Pancake, French Toast & Omelet Specials! Who's ready for a sweet start to the month of love? Back by popular demand, all Miss Shirley's Cafe locations are featuring Shirley's Signature Red Velvet Pancakes with Cream Cheese Icing! 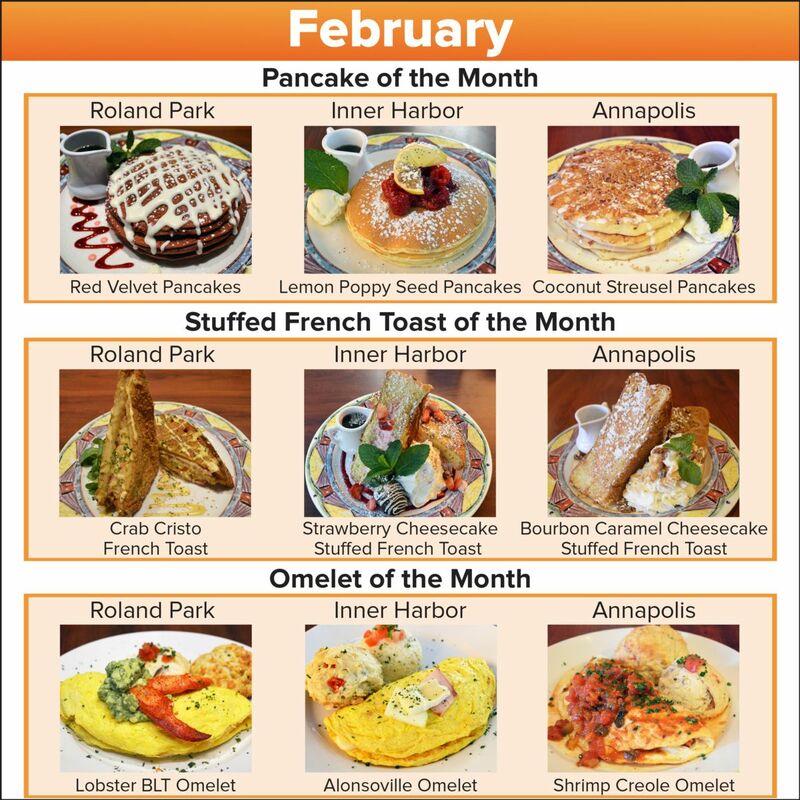 "View Entire Post" to check out the rest of our February Pancake, French Toast & Omelet specials. Happy New Year! We're celebrating the start of a New Year with all-new Pancake, French Toast & Omelet Specials. "View Entire Post" to check out all of our January Specials! The New Year offers us a special opportunity to reflect on all we have accomplished in 2018, and express our sincere thanks to all those who have supported us in the last year. Looking back, we wanted to highlight some of our most memorable Miss Shirley's moments of 2018, because they would not have been possible without your continous love and support. "View Entire Post" to check out our 2018 Timeline! Who doesn't love raising a glass during the holidays? Get into the "Spirits" of the season with the recipe for our delicious Holiday Blackberry Bourbon Smash, which includes Shirley's House-Made Blackberry Cranberry Jam! "View Entire Post" to get the recipe. We're celebrating the Holidays with festive favorites! 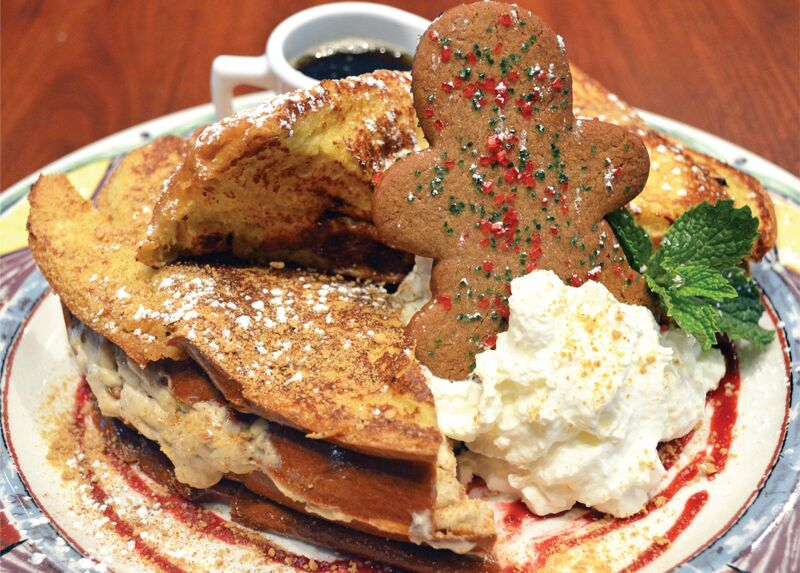 This December, all Miss Shirley's locations are featuring our much-loved Gingerbread Cheesecake Stuffed French Toast, as well as a variety of new holiday-themed Pancake & Omelet Specials! "View Entire Post" to check out all of our December Specials! Giving Thanks - Our team shares what we are thankful for! Each November, families & friends gather to celebrate one of our favorite foodie holidays – Thanksgiving! So, in the spirit of the season, we asked an array of Miss Shirley’s management team members to share a few words about what they are thankful for, going into this upcoming season of giving. "View Entire Post" to see what our team is thankful for this season! It’s the most wonderful time of the year…which is why we’ve compiled a list of our Top 10 Kid-Friendly Holiday Experiences in Maryland, so your family can make the most out of this upcoming season of cheer! 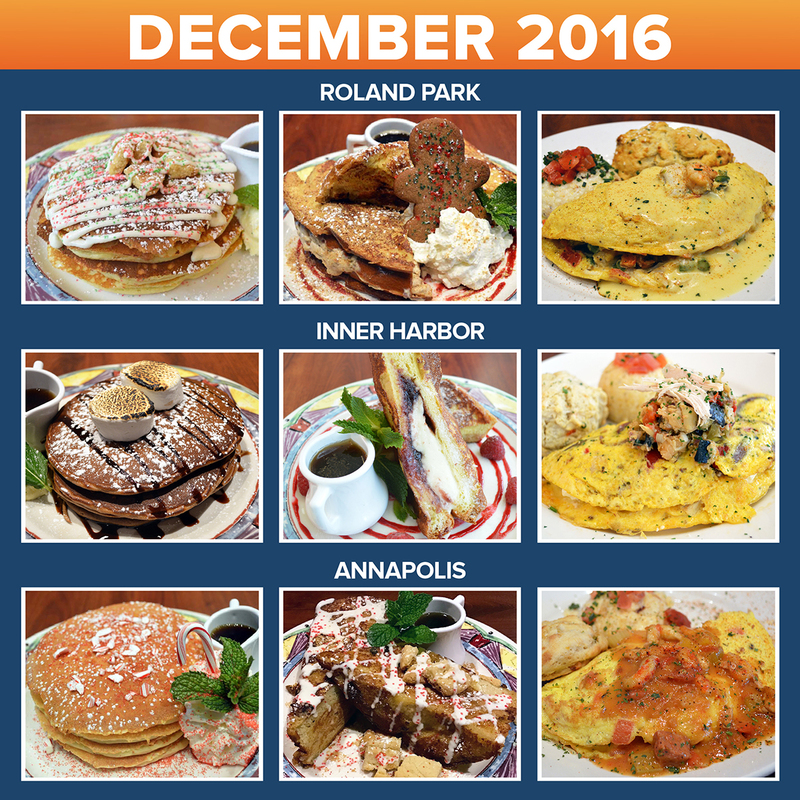 Fuel up for adventure by feasting on an array of award winning signature dishes & festive holiday favorites at Miss Shirley's Cafe, then embark on one of these ten family friendly holiday experiences, in the Baltimore & Annapolis area. "View Entire Post" to check out our list of Family Holiday Experiences! 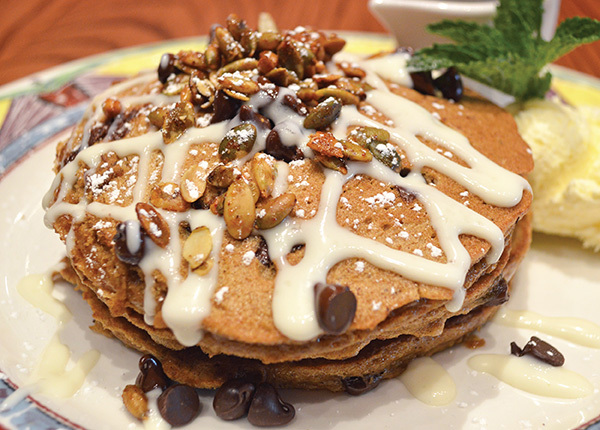 This month, all Miss Shirley's locations are featuring NEW Pumpkin Spice Chocolate Chip Pancakes, as well as our much-loved Thanksgiving Omelet, to celebrate the upcoming holday season! "View Entire Post" to check out the rest of our November Specials! With the Fall chill in the air, it's no surprise that October honors one of our favorite cool weather comfort foods - Chili! To celebrate National Chili Month, we're giving YOU an exclusive look into Miss Shirley's kitchen. 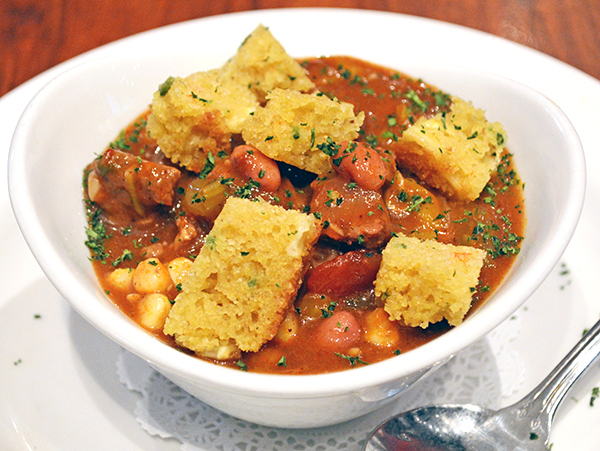 "View Entire Post" to get the recipe for our go-to Cowboy Beef Chili, topped with House-Made Cornbread. This month, we're bringing back a Fall Favorite - Pumpkin Cheesecake Stuffed French Toast is now available at ALL Miss Shirley's Cafe locations this month. "View Entire Post" to check out the rest of our October Specials! New 2018 Fall Menu Debuts September 26th! 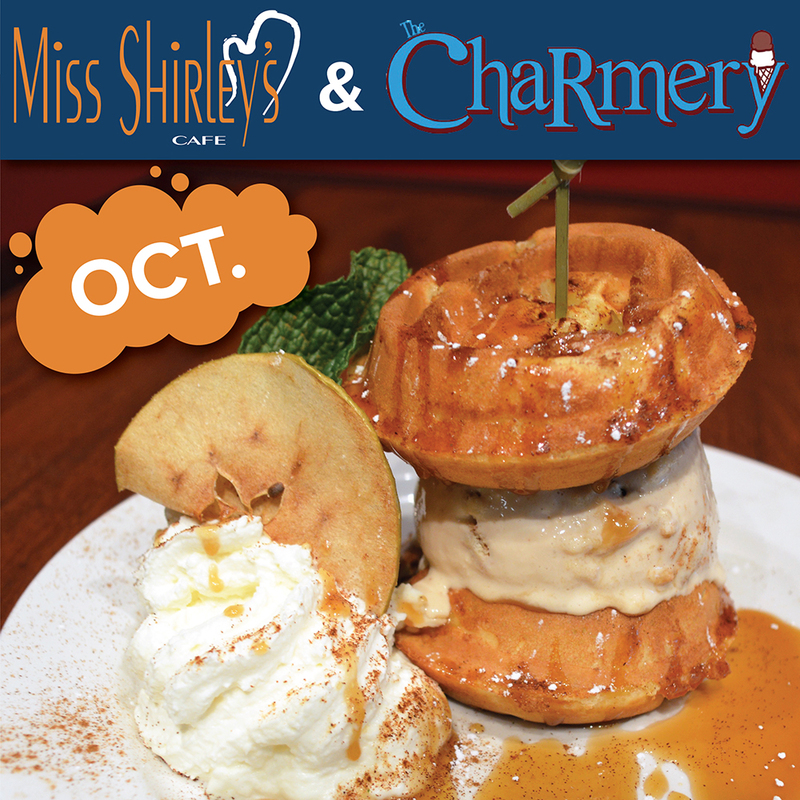 With the promise of cooler weather on the horizon, it’s just about time to cozy up to Miss Shirley’s Fall menu! So, this September, our culinary team is revamping a few Shirley’s signatures & swapping out our Summer staples for all-new seasonal selections. "View Entire Post to get a sneak peak of our upcoming seasonal selections! Happy September! 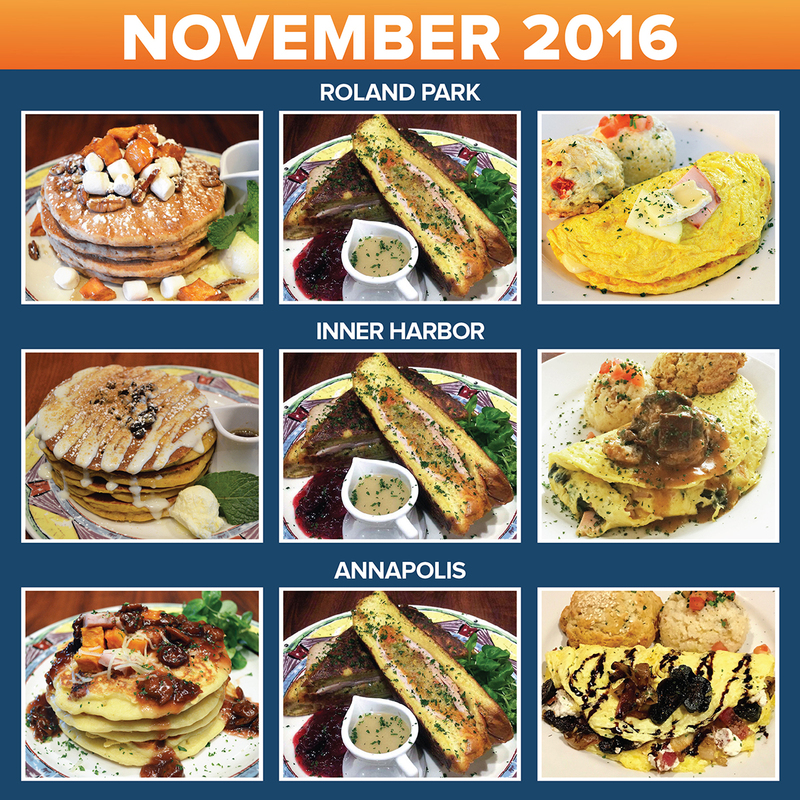 Cooler weather is right around the corner and we're celebrating with all-new cozy Fall inspired Pancake, French Toast & Omelet selections. Check out what we are featuring at each location below! With an abundance of kid-friendly museums, attractions, restaurants, historic treasures, shopping & more, Baltimore’s Inner Harbor is an ideal spot for a week-long family vacation, or just a fun Summer day trip with the kids! But with all of the rich culture, cuisine & attractions to choose from, it can be tricky to pick the perfect spots for your family fun day. That’s why we’ve come up with a list of our top Kid-Friendly experiences, all in the heart of Baltimore’s Inner Harbor. "View Entire Post" to check out our top tips! They say that breakfast is the most important meal of the day; but, if there’s one thing we know at Miss Shirley’s Cafe, it’s that breakfast doesn’t have to look like a classic plate of Pancakes, Eggs, Bacon & Hash Browns. With so many rich cultures and traditions around the world, we thought it would be fun to shed some light on the basic breakfast foods worldwide! Have you ever wondered what they eat for breakfast in Thailand? Or what a morning snack looks like in Brazil? Well, look no further! "View Entire Post" to see our list of 10 breakfasts from around the globe! In July, Miss Shirley's Cafe was honored to be chosen to participate in Governor Larry Hogan's Annual Maryland Buy Local Cookout! 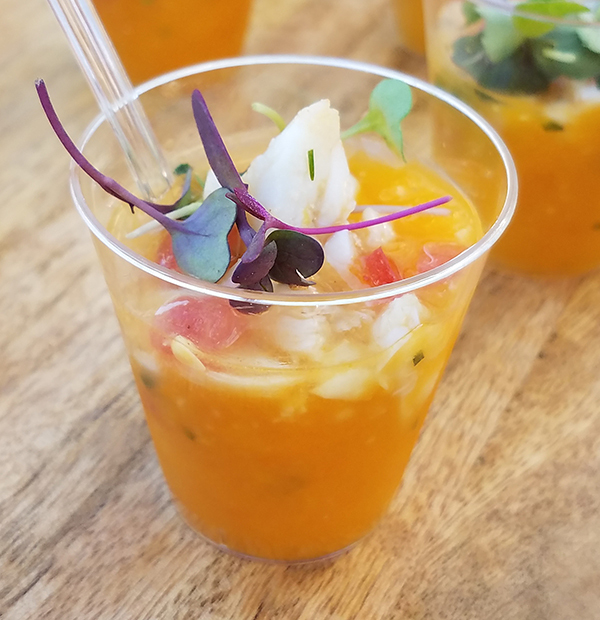 To highlight locally grown & harvested products, we served a fresh Yellow Tomato Gazpacho with Jumbo Lump Crab & Corn Relish- featuring local Lindy's Seafood & Bartenfelder Farms produce. Get the recipe for this fresh Summer Soup below! We're celebrating July with "Fireworks!" 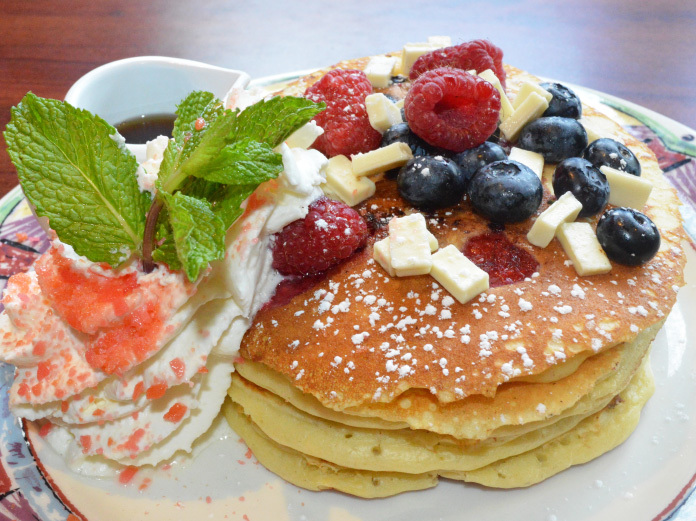 Back by popular demand, ALL Miss Shirley's Cafe locations are featuring 4th of July inspired Fireworks Pancakes with Raspberries, Blueberries, White Chocolate Chips, Whipped Cream & Crackling Strawberry Pop Rocks! 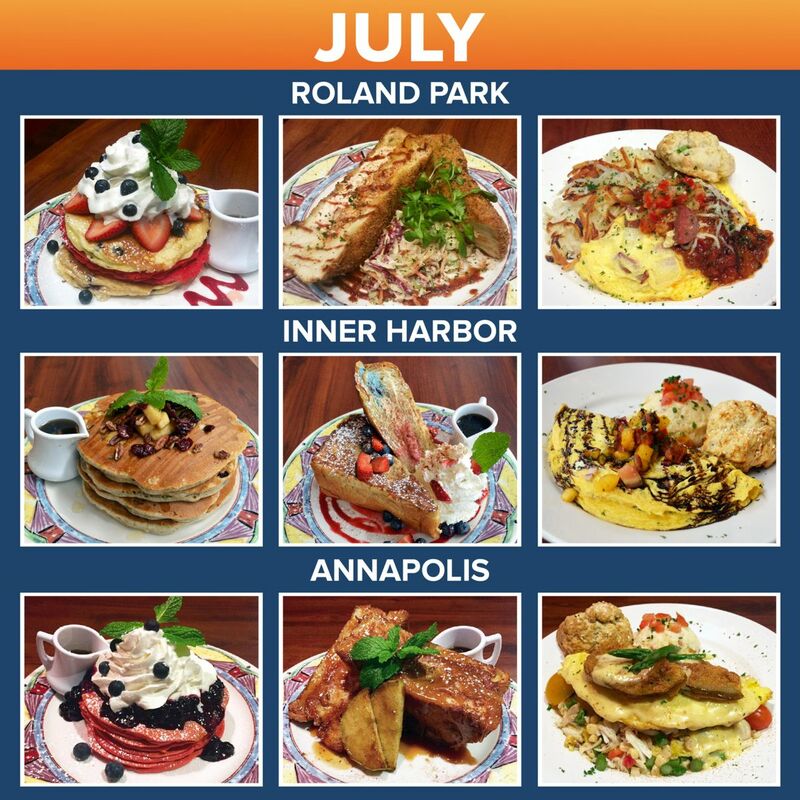 "View Entire Post" to check out the rest of our July 2018 Pancake, French Toast & Omelet Specials. Celebrating Father's Day - Our Tips on How to Honor Dad this Year! Dads are known to do so much for their kids - whether it's teaching you how to throw a ball, taking you to countless sports practices & after school activities or giving the best fatherly advice about friends, relationships and life. For this and so much more, there are countless reasons to say “Thank You” to the father figure in your life. So, with Father’s Day coming up in June, we thought we would share some of our favorite ways to celebrate Dad in Maryland this year! "View Entire Post" to read more. World Environment Day - What We Do to Help Keep our Planet Clean! World Environment Day occurs each year on the 5th of June, to encourage worldwide awareness & action for the protection of our environment. In honor of this important observance, we thought our guests may like to know some of the things we do daily at Miss Shirley’s Cafe, to help keep our planet clean & green! "View Entire Post" to read more! 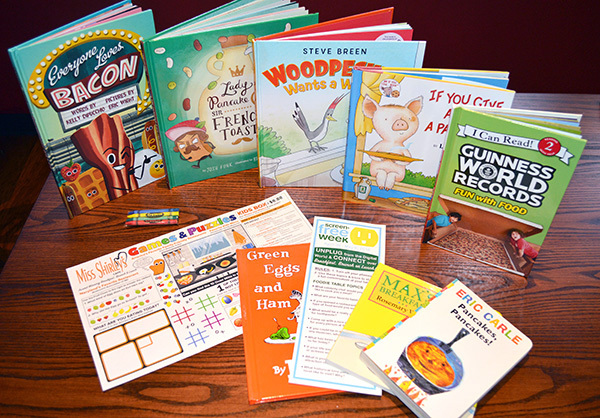 Screen-Free & Kid's Book Week - Unplug & Connect over Breakfast or Lunch! At Miss Shirley's, we always say that there's nothing more important than Family, Friends & Food - which is why we are happy to be participating in National Screen-Free Week & Children's Book week, for the 2nd year in a row, April 30 - May 6! We are encouraging our guests to unplug from the digital world & engage in warm conversations with family & friends while dining with us at any Miss Shirley’s location! "View Entire Post" to learn more! Celebrating Mother's Day - A Special Tribute To Our Mothers! Each May, we gather to celebrate the first woman in our lives – Mom! So, in honor of Mother’s Day, we asked an array of Miss Shirley’s team members to share a few words about why they are grateful for their mothers, and these were some of the answers. "View Entire Post" to see their heartfelt answers. National Salad Month - Our Executive Chefs Dish on their Favorite Salad Creations! With fresh local produce in abundance, there’s no question as to why May is National Salad Month! And with the weather finally warming up, it’s the perfect time to give your oven a rest and enjoy a lighter meal. Salads can serve as quick & delicious starters, sides or easy weekday lunches & dinners. But with so many possible combinations, how do you create an unbeatable combination atop tasty greens? 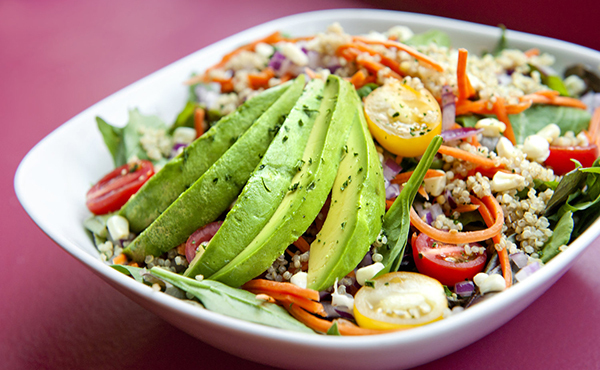 We talked to our Executive Chefs to get the scoop on their Top Tips & Favorite Salad Creations! "View Entire Post" for tips on creating the perfect Summer salad. When you think about food in Baltimore, there are many unique and delicious options that come to mind, but most Marylanders agree that you haven’t experienced Baltimore until you’ve eaten a Jumbo Lump Crab Cake! Maryland is best known for the blue crab, the bountiful delicacy of the Chesapeake Bay, along with an abundance and variety of seafood. Must have Maryland food and drinks include, Steamed Blue Crabs with lots of Old Bay seasoning, Chesapeake Bay Oysters, Soft Shell Crabs, Traditional MD Crab Soup, Fried Chicken, Old Bay Bloody Mary’s, Orange Crushes, and you can’t visit without taking a trip to a local Farmer’s Market to explore what Maryland agriculture has to offer! 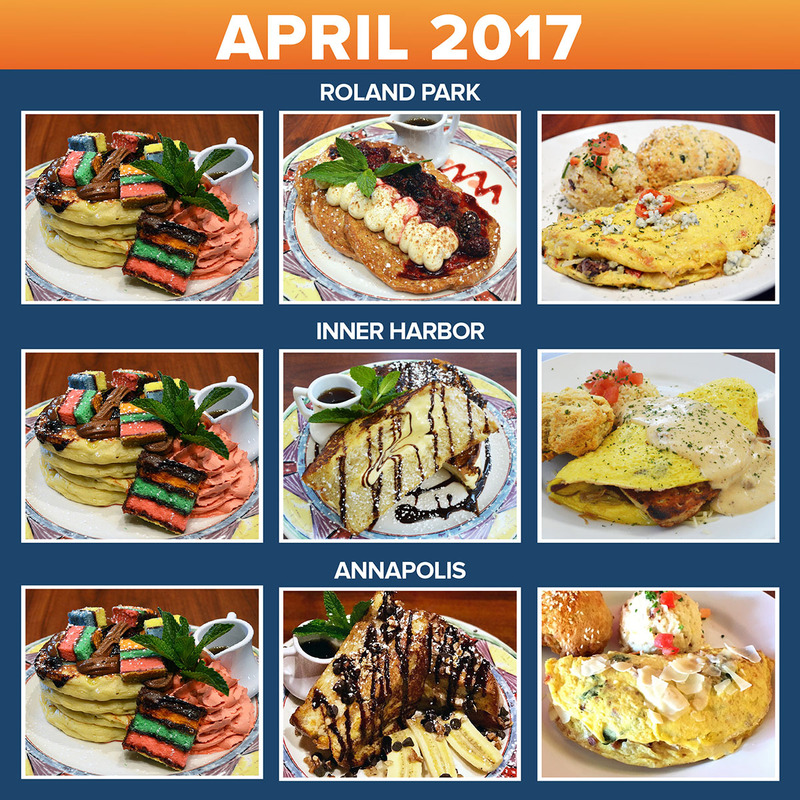 "View Entire Post" to check out our Top 5 quintessential Maryland foods & flavors you must experience when visiting our beautiful state. Spring Menu Debut April 18th! The weather is warming up, which means it’s time to switch out some of our cold-weather favorites for fresh new Spring selections! This season, our culinary team is going to Wake Up Your Taste Buds with all new starters like Mexican Street Corn Fried Deviled Eggs, filled with Queso Fresco, Roasted Corn & Cilantro, garnished with Red Onion, Comeback Sauce & Crispy Corn Tortilla Strips. But if you’re looking for something a little lighter, Avocado Toast topped with Arugula, new Southern Pickled Shrimp & Poached Eggs is a healthy & delicious way to begin your brunch. "View Entire Post" for more sneak peaks! 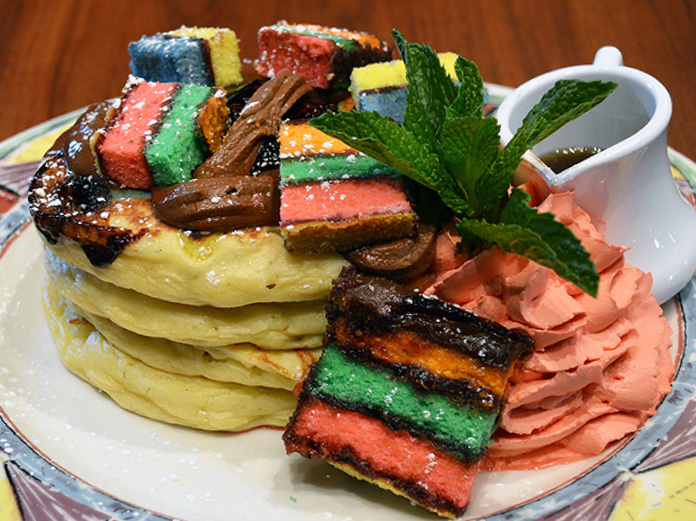 Back by popular demand & taking inspiration from the upcoming colorful Light City Baltimore festival, Rainbow Pancakes are back at ALL Miss Shirley's Cafe locations this month! 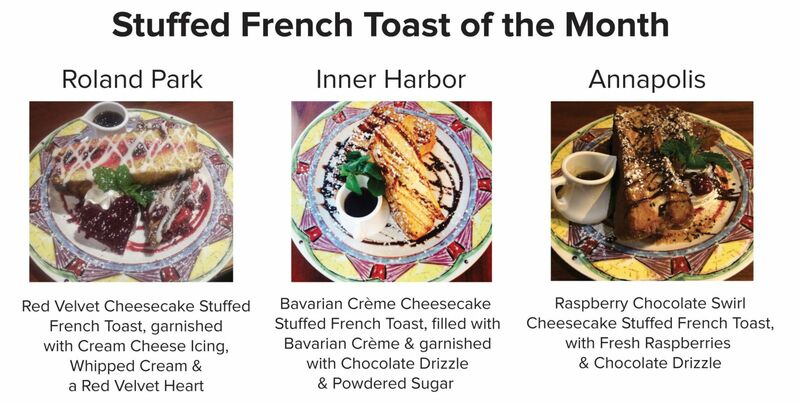 Check out the rest of our French Toast & Omelet Specials for the month of April below! 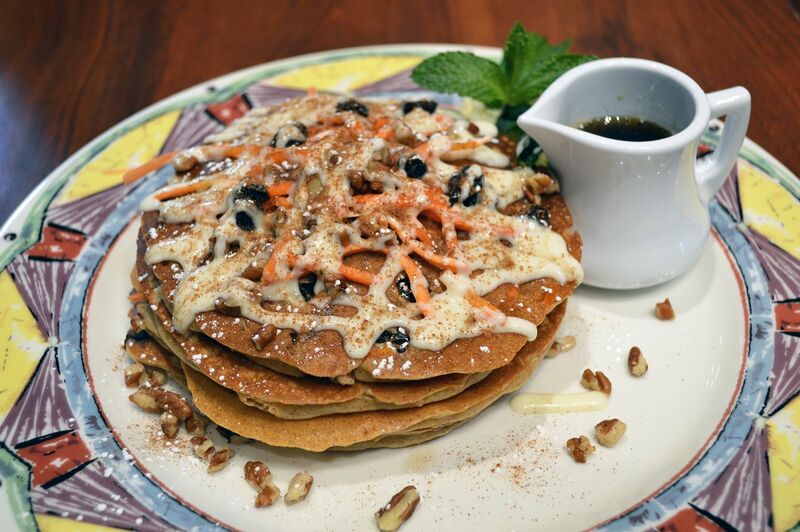 All Miss Shirley’s Café locations are featuring Carrot Cake Pancakes, as well as festive St. Patrick’s Day themed French Toast & Omelet specials during the month of March. "View Entire Post" to check out all of our March Specials! The New Year offers us a special opportunity to reflect on all that we have accomplished in 2017, and extend a sincere "THANK YOU!" to all of our amazing friends, family, guests & supporters. Looking back, we wanted to highlight some of our favorite Miss Shirley's moments of 2017, because they would not have been possible without your continuous love & support! "View Entire Post" to check out our 2017 Timeline of memorable Miss Shirley's moments. 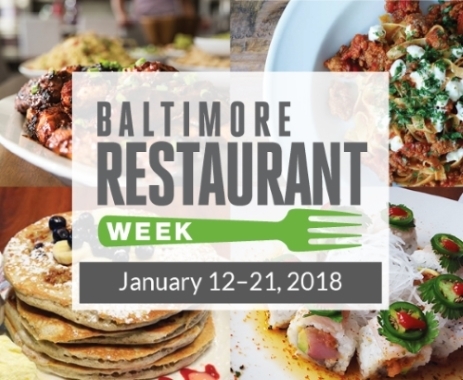 Baltimore Restaurant Week - now available on weekends! Ditch the brown bag & put your fork into something special at Miss Shirley's Cafe, Roland Park or Inner Harbor during Baltimore Restaurant Week! Indulge in our delicious Restaurant Week deals, January 12-21st - now available on weekends! Both Baltimore locations will be offering $15 Two-Course Breakfast and $18 Two-Course Lunch options. We will be featuring some of our favorites like the Fried Chicken, Biscuits & Gravy Omelet, BBQ Mac & Cheese Skillet, Benne Seed Chicken 'N Waffles, Hog Wild on a That's How We Roll, Chicken Corn Chowder, Spinach & Kale Salad, and more! "View Entire Post" to see our full Restaurant Week Menu! Few things scream Southern cooking quite like Gumbo! 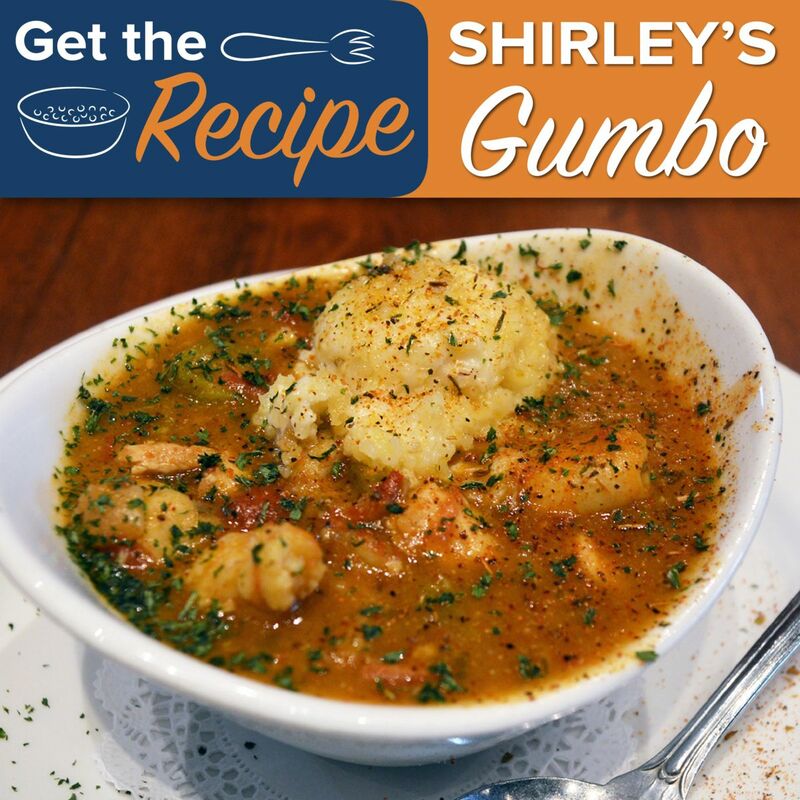 Transform your kitchen into an authentic New Orleans restaurant with Miss Shirley’s much-loved Signature Gumbo. This creole classic features Andouille Sausage, Chicken, Shrimp, Crawfish Meat, Okra & Tomatoes, served with Stone Ground Grits with Diced Bacon, and dusted with Cajun Spice! "View Entire Post" to get Corporate Executive Chef Brigitte’s Full Recipe! While we'll miss warm sunny days and summer fun, there is a lot to look forward to in the upcoming cooler months - like hearty Fall soups! 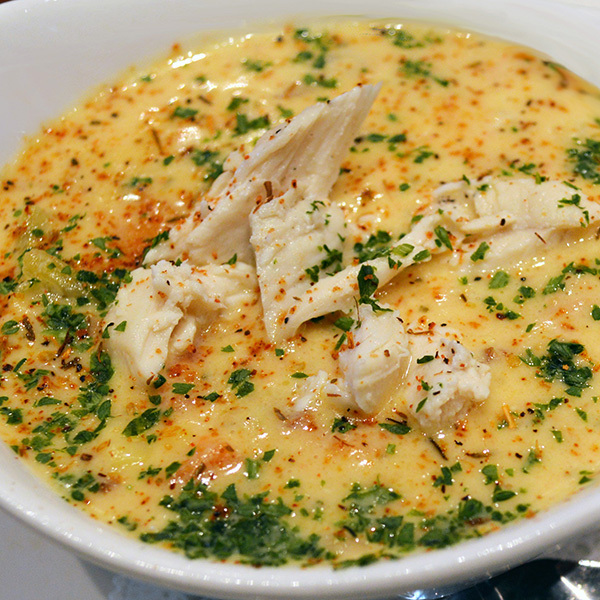 There's no better way to chase away Fall's chill than with a nice, hot bowl of Miss Shirley's Signature Chicken Corn Chowder. "View Entire Post" to check out the recipe! 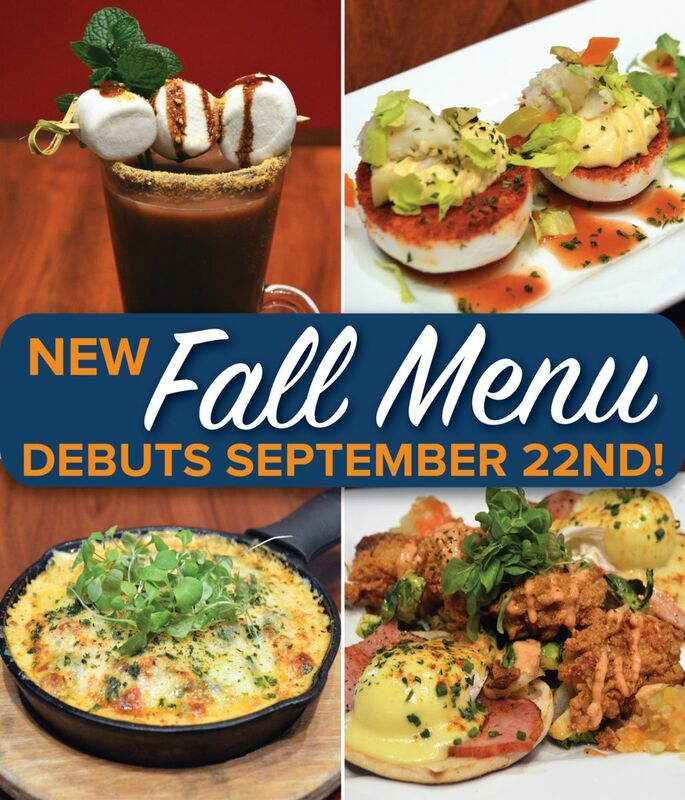 Sneak Peak: Fall Menu Debuts September 27th! Miss Shirley’s NEW Fall Menu is set to debut at all locations on Wednesday, September 27th, featuring all-new cool-weather dishes that are sure to chase away the autumn chill. This season, our culinary team is kicking up the heat with spicy starters like new Buffalo Cauliflower Bites featuring local Chuck’s Trading Post Buffalo Sauce; Benne Seed Cheddar, Roasted Corn & Jalapeño Buttermilk Biscuits with House-Made Raspberry Cranberry Bourbon Jam; and Southern Fried Loaded Deviled Eggs filled with Cheddar & Chives, breaded in Panko, fried & topped with Jalapeno-Smoked Bacon, local Huckle’s Late Harvest Jalapeno Aioli & Baltimore BBQ Co. Chesapeake Sauce. Once you’ve had your fill of our featured appetizers, it’s time to cozy up to comforting classics like Shirley’s Signature Oyster Feller - Cornmeal-Encrusted Oysters, Chesapeake Chicken Sausage Gravy, Stone Ground Grits with Diced Bacon & Egg Round with Pimento Cheese, Tabasco Bacon Onion Jam & Chow Chow. "View Entire Post" for more sneak peaks of our upcoming Fall Menu! We’ve all heard that eating a healthy & nutritious breakfast has been linked to enhanced work performance, better test grades for school kids & reduced hunger throughout the day. And with schools back in session and summer coming to a close, it’s no surprise that September is recognized as Better Breakfast Month – a perfect opportunity to reflect on our breakfast eating habits. But, creating a healthy breakfast doesn’t have to be an elaborate ordeal. Incorporating a few key elements such as fruits, veggies, grains & protein can make a world of difference in starting your day off on the right foot! So, to kick start Better Breakfast Month, we’re giving you our quick & easy recipe for Miss Shirley’s Healthy ‘Hot Mess’ Scramble! Summer isn't quite over yet! 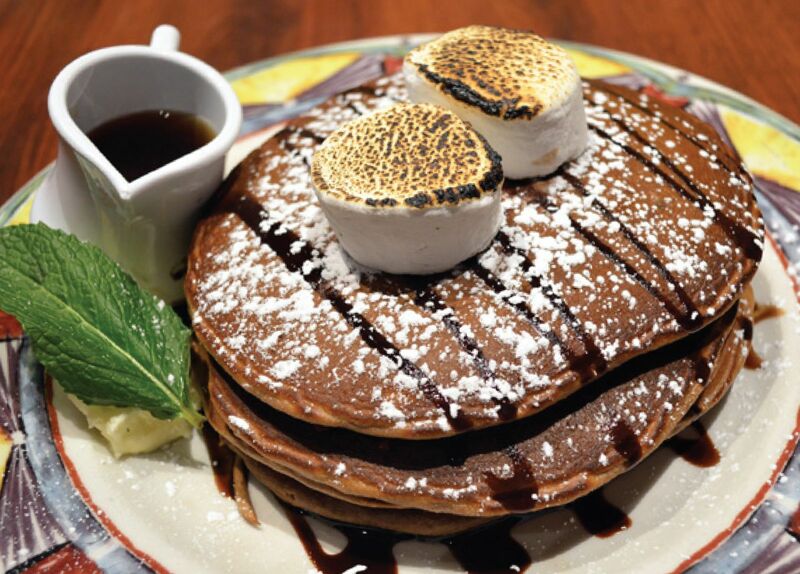 All Miss Shirley's Cafe locations are featuring warm weather-inspired selections like Key Lime Pancakes, Pina Colada Pancakes, Hawaiian Tropic Omelet & more! "View Entire Post" to view all of our August Pancake, French Toast & Omelet Specials at each location. 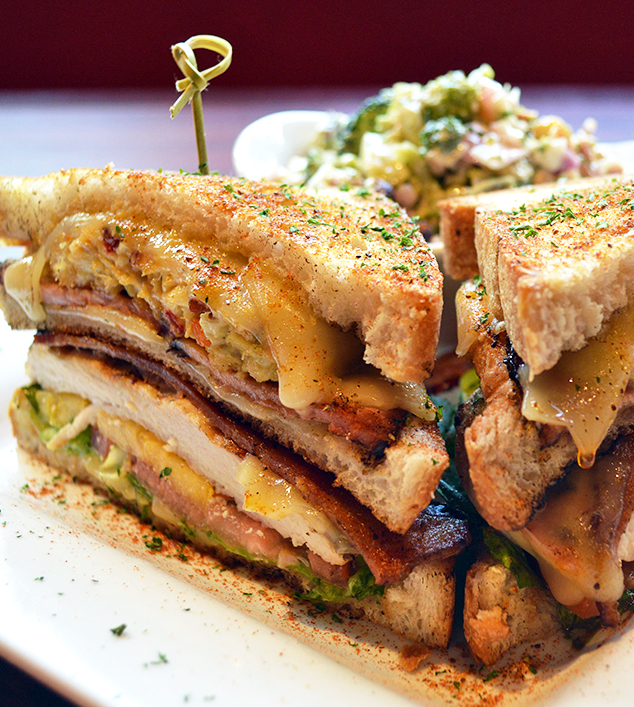 National Sandwich Month: Our Chefs’ Tips for Building a Better Sandwich! With summer coming to a close and schools back in session soon, it’s no surprise that August pays homage to a lunch-box favorite – Sandwiches! Though people have been combining meat and bread for centuries, the sandwich as we know it was popularized in 1762 by John Montagu, the 4th Earl of Sandwich, a small town in southeast England. According to food lore, the Earl had a substantial gambling problem and found himself at the card table for 24 hours straight one evening! Not wanting to leave the table, he asked the cooks to bring something he could eat with one hand, as not to interrupt his game. The London club he was playing at provided beef and cheese between two slices of loaf bread. Men at the club started to follow suit, stating, “I’ll have the same as Sandwich.” This convenience food soon became popular in London society circles and permanently took on the Earl’s name! Today, sandwiches can be made savory, sweet, hearty, light, crispy & saucy & so on...but with the endless variety of sandwich combinations available, how do you decide? We sat down with our Executive Chefs and one thing was unanimous – it all starts with a quality bread! “Whether it’s a hearty sliced bread that will stand up to condiments or a fresh baguette to provide crunch, the bread is definitely the key to building a great sandwich,” says Executive Chef Eric of the Inner Harbor. 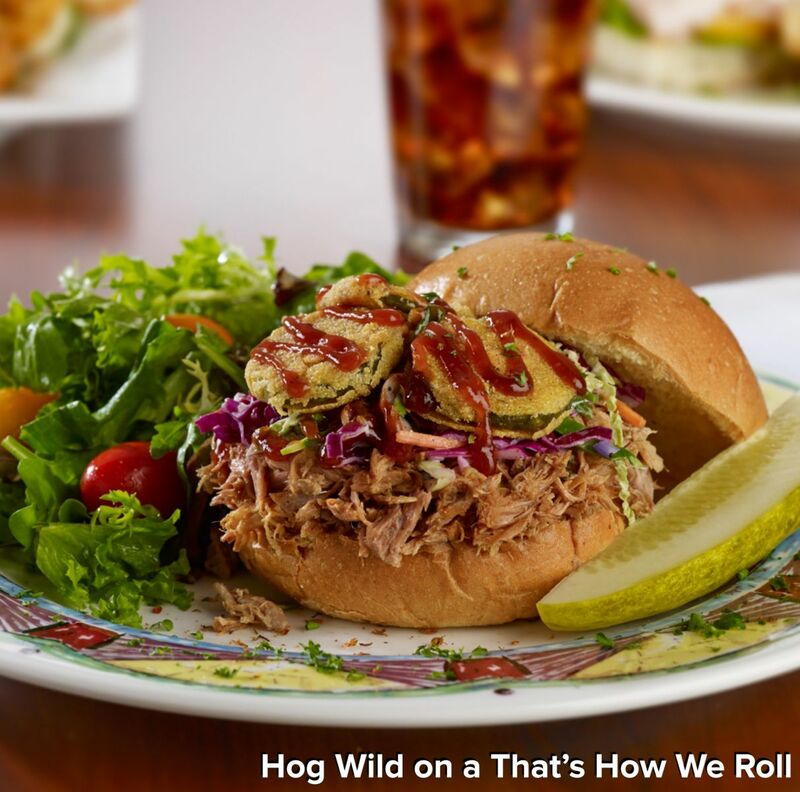 "View Entire Post" to check out our Chefs’ top tips and recommendations for their favorite flavorful sandwiches! 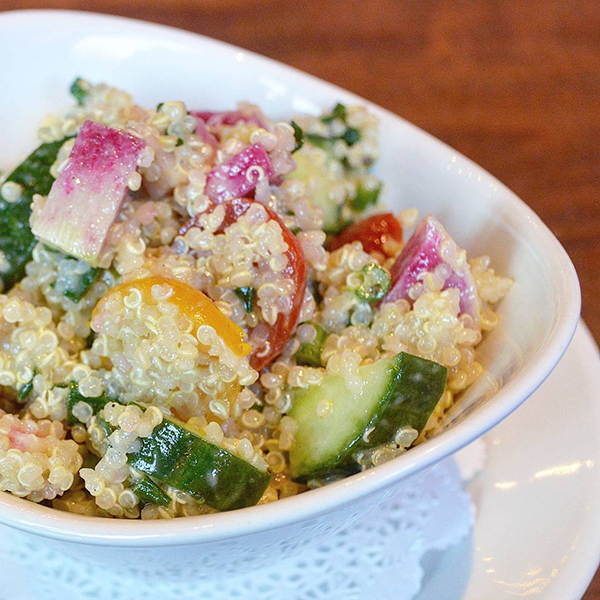 Celebrate longer, lighter days with fresh new recipes like our Summer Quinoa Salad, featuring beautiful & delicious Watermelon Radishes, as well as Cucumber, Tomato & Quinoa! This healthy side salad is quick, easy & sure to be a crowd pleaser at your next backyard bash or holiday cookout. "View Entire Post" to get Corporate Executive Chef Brigitte's full recipe, and don't forget to follow Miss Shirley's on Pinterest for more tasty tips! 2017 Baltimore Summer Restaurant Week Deals! Why eat lunch at your desk, when you can indulge in a delicious deal? 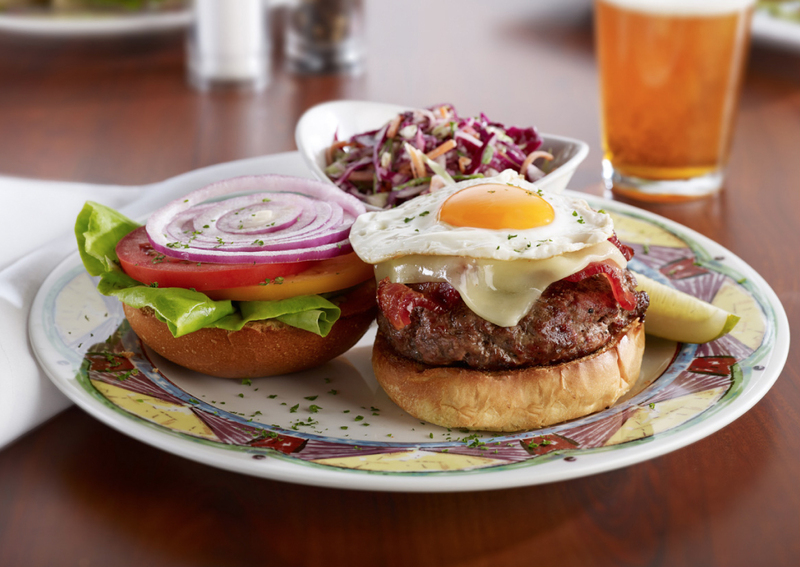 For summer restaurant week, we're featuring a mix of Shirley's signatures & seasonal selections like our Broiled Grapefruit Brûlée, BBQ Chicken Deviled Eggs, Benne Seed Chicken 'N Waffles, Cuban Huevos Sandwich, Naptown Lemon Dill Shrimp Salad, Cold Spring Lane Hot Brown, Spinach & Asparagus Salad and more! "View Entire Post" to check out our Full Restaurant Week Menu. Meet the Miss Shirley's Managers! You see them in our restaurants each day, stopping by for a quick chat or checking in to make sure that you are enjoying your experience. But have you ever wanted to know more about Miss Shirley's Managers? The management team at Miss Shirley’s Cafe is comprised of a group of diverse and talented team members, who all share a strong passion for customer service & hospitality. Each manager, with his or her unique background, brings something new and meaningful to the Miss Shirley's team! 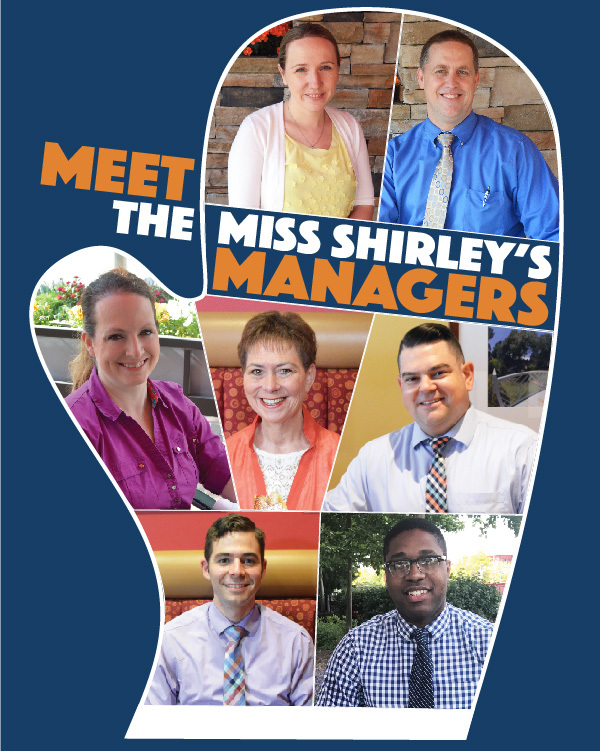 "View Entire Post" to learn more about Miss Shirley's Managers! 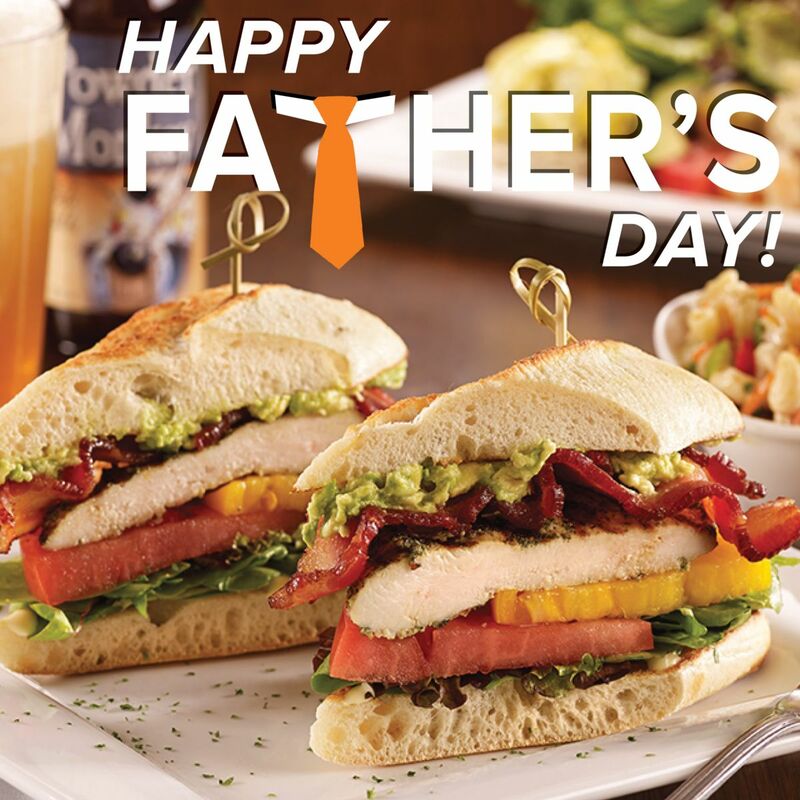 Celebrate Dad All Month Long! Once a year we gather to celebrate Dad - so mark your calendars because Father’s Day is coming up on June 18th! They say that the way to a man’s heart is through his stomach, so show Dad you care by treating him to an Award Winning Breakfast, Brunch or Lunch at Miss Shirley’s this month! From barbecue and burgers to seafood and steak, we’ve got a menu that’s sure to suit his every craving. Catch up over hearty House Favorites like our Benne Seed Chicken ‘N Waffles, Gravy Train Southern Skillet, Eddie’s Beef ‘N Eggs or Soft Shell Crab & Succotash Eggs Benedict. For years, Miss Shirley's Corporate Executive Chef Brigitte Bledsoe, dreamed of having her own restaurant garden. In 2014, Brigitte's vision became a reality with the creation of Miss Shirley's Fresh Vegetable & Herb Garden in Roland Park. Each year, Corporate Executive Chef Brigitte & Executive Chef Zuri plant their fresh seasonal veggies & herbs in a completely Non-GMO environment using All-Natural Fertilizer, made from composted materials at our Annapolis restaurant location! 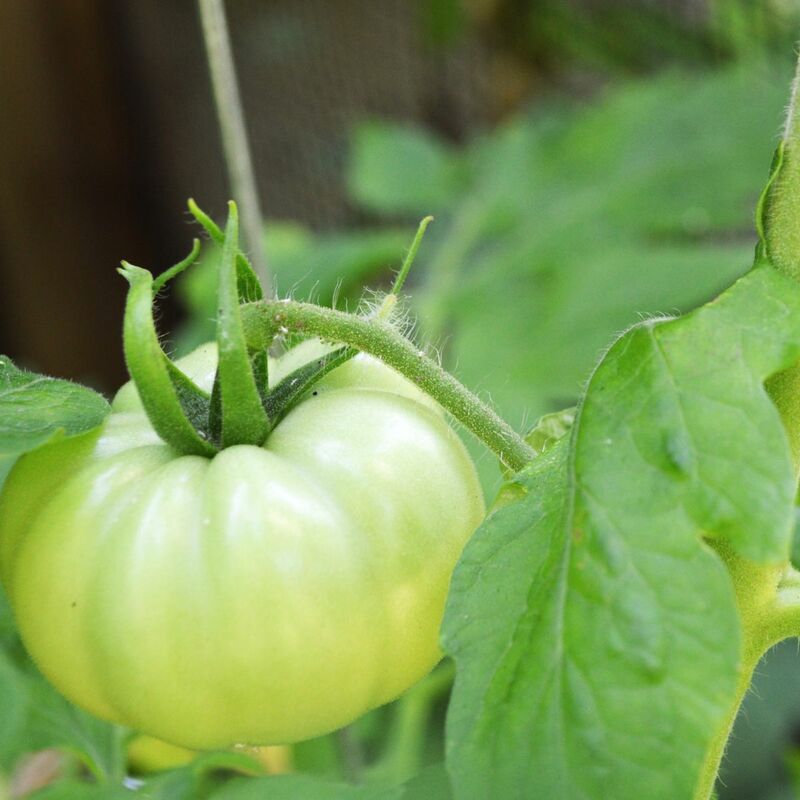 This Summer, they're growing: Mint, Thyme, Dill, Parsley, Chives, Basil, Cilantro, Green Onions, Tomatoes, Cucumbers, Cabbage, Beans, Spinach, Mesclun Mix, Carrots, Broccoli, Okra, Collard Greens, Corn, Jalapeños, Red & Yellow Peppers, Pumpkins and Asparagus. 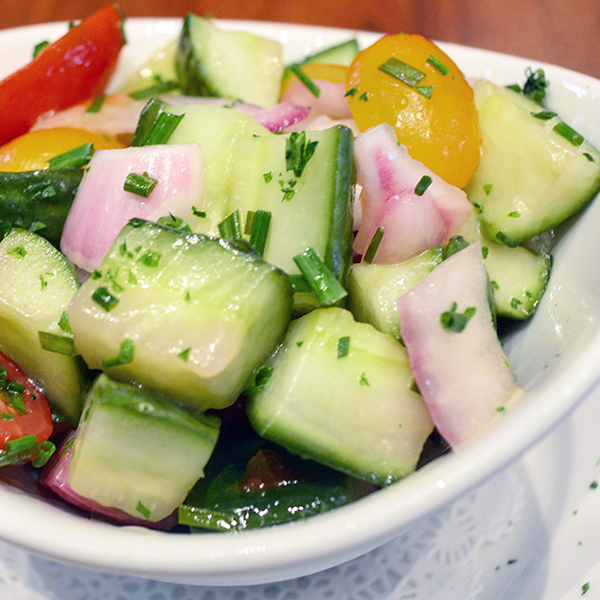 "View Entire Post" to get Miss Shirley's Cucumber & Tomato Salad Recipe! Twelve years ago, Miss Shirley’s Founder, Eddie Dopkin, put an ad out calling for the “Best Breakfast Chef In The World,” and since then, we have always known that is exactly who he found. That’s why we are especially thrilled to announce that over thirty-five thousand Maryland diners voted, and Corporate Executive Chef Brigitte Bledsoe was named Chef of the Year in the Restaurant Association of Maryland’s 2017 Stars of the Industry Awards! The title of Chef of the Year is described as “an executive chef who demonstrates consistent standards of excellence, serves as an inspiration to other foodservice professionals, displays dedication to the artistry of food and exhibits ongoing commitment to the community,” and Chef Brigitte, as well as the entire Miss Shirley’s Cafe team, is overjoyed and honored to receive such a prestigious and inspiring award. 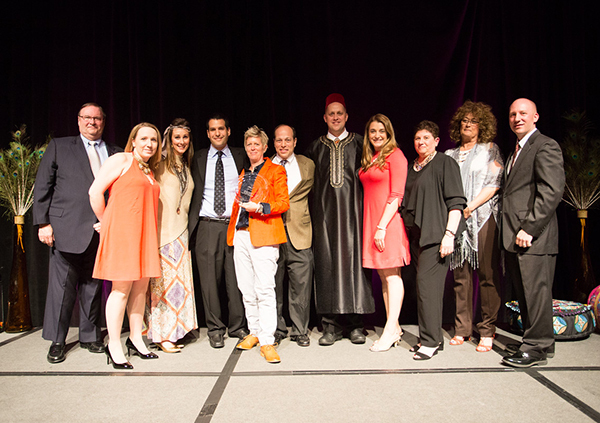 "View Entire Post" to read more about the Annual Awards Gala! Unplug & Enjoy Quality Time for National Screen-Free Week! At Miss Shirley’s, we always say that there is nothing more important than Family, Friends & Food - which is why we are happy to be participating in National Screen-Free Week from May 1st – 7th! Screen-Free Week is an annual celebration when families, schools, and communities are urged to swap digital entertainment for the joys of life beyond the screen. 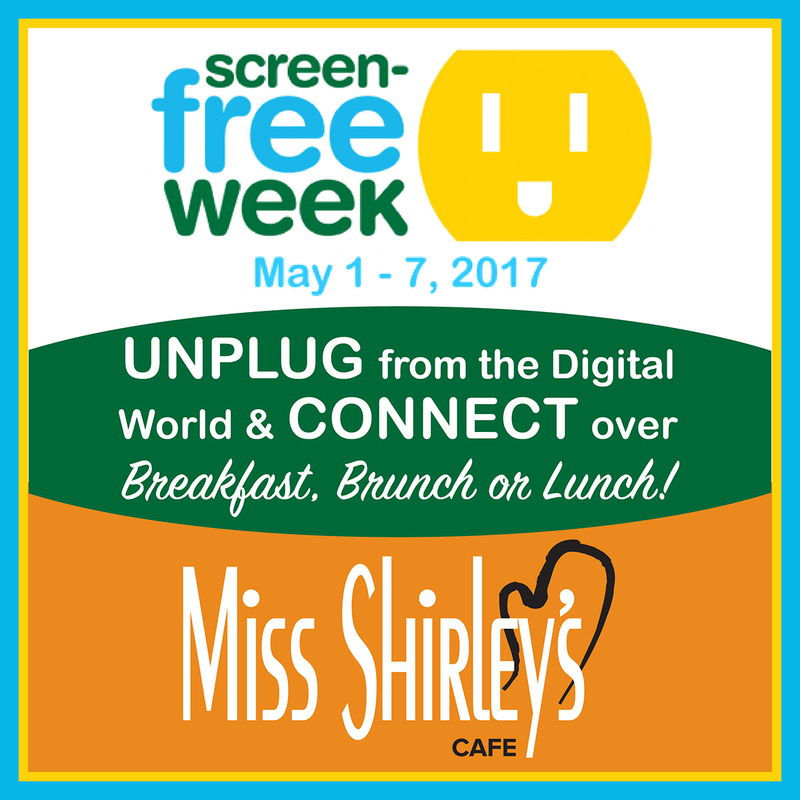 "View Entire Post" to learn how Miss Shirley's is participating in Screen-Free Week! ALS Bites! Help us support the Brigance Brigade Foundation. Founded in honor of O.J. Brigance, a former Baltimore championship football player who was diagnosed with ALS in 2007, the Brigance Brigade Foundation understands that ALS truly BITES! That’s why they are working with Bars, Restaurants & Cafes statewide during ALS Awareness Month, to help raise funds and awareness for patients and families living with ALS, a motor neuron disease, also known as Lou Gehrig’s disease. 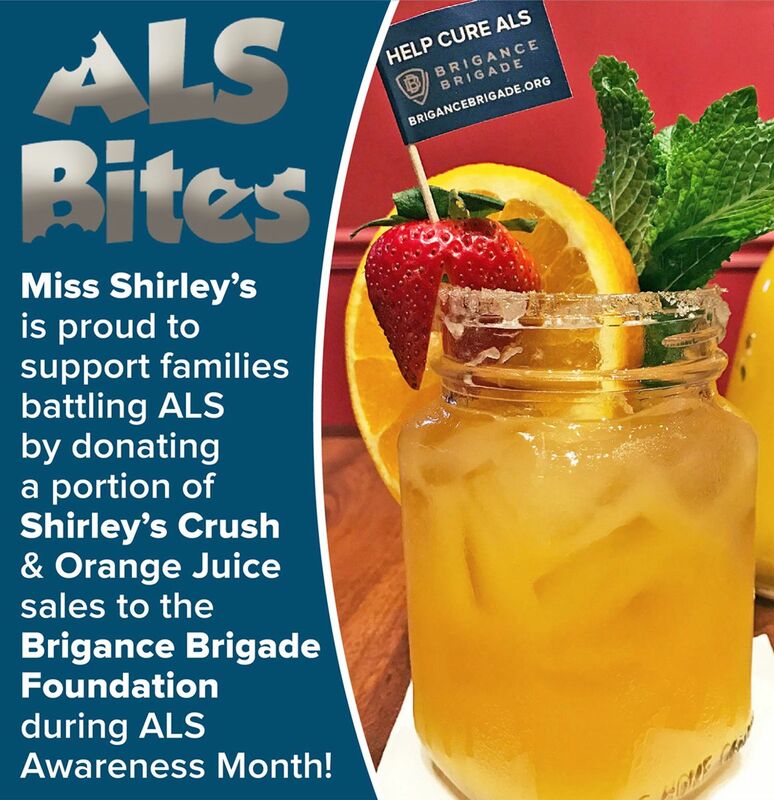 "View Entire Post" to learn about how Miss Shirley's is supporting ALS Bites! 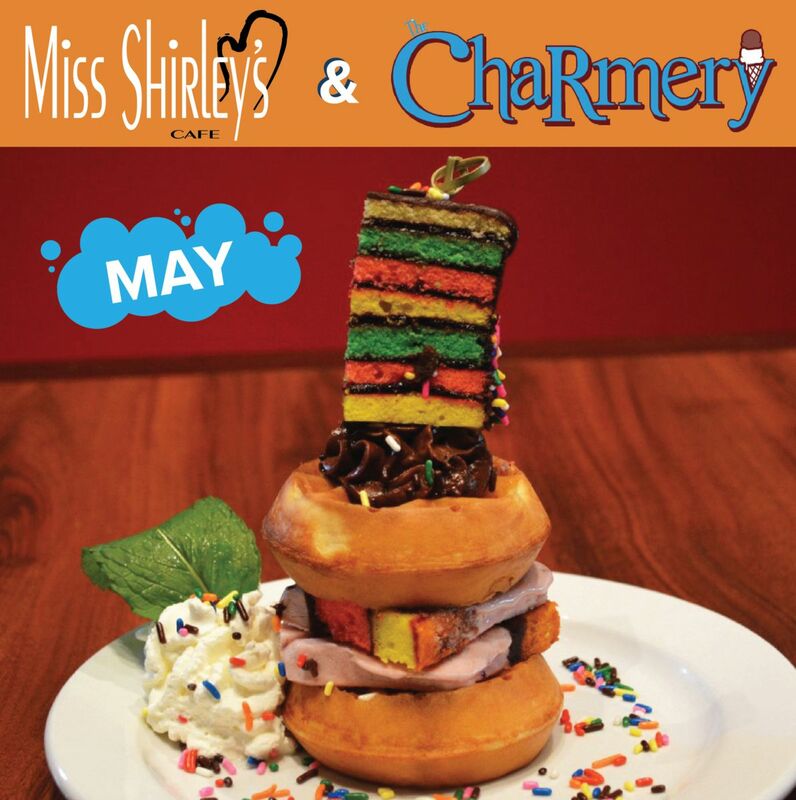 This April, all Miss Shirley's Cafe locations are featuring special Rainbow Cake Pancakes to celebrate the colorful illuminations of Light City Baltimore! We are also featuring some decadent and delicous French Toasts & savory Omelets that are sure to satisfy. 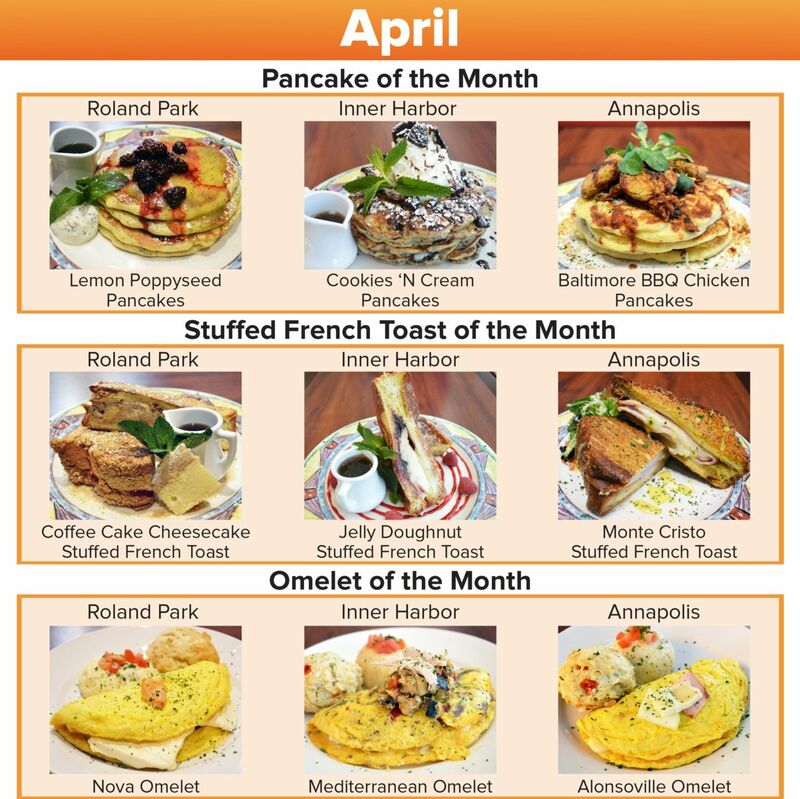 "View Entire Post" to check out the rest of our April Pancake, French Toast & Omelet selections! 2017 Spring Menu Debuts March 30th! 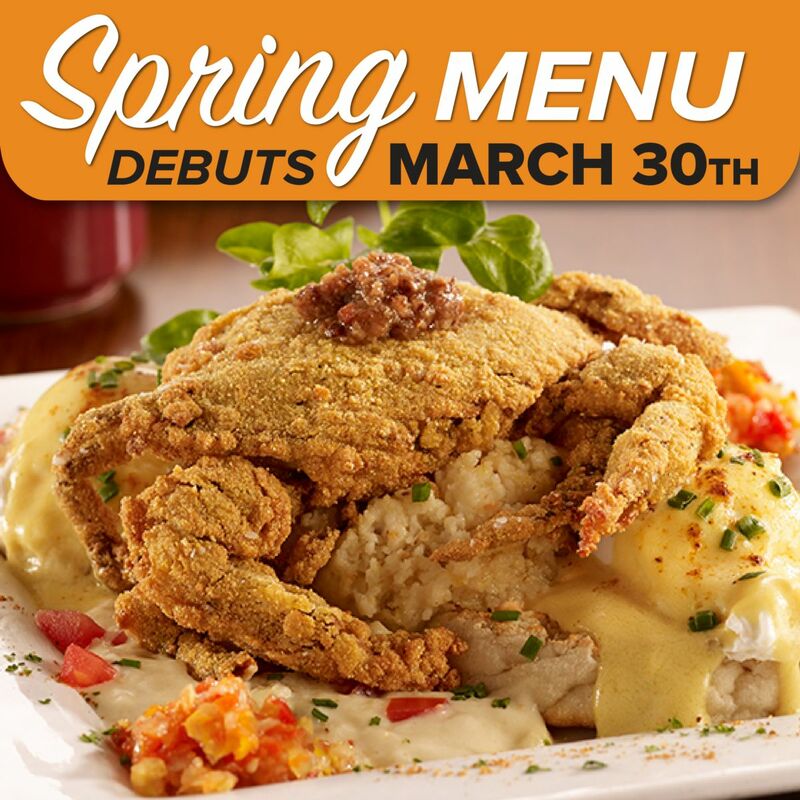 Spring sunshine has shed it’s light, and with warmer weather comes Miss Shirley’s NEW Spring Menu, which will debut at all locations on Thursday, March 30th! This Spring, Corporate Executive Chef Brigitte Bledsoe and her culinary team have kicked it up a notch with some savory & sweet starters that are sure to Wake Up Your Taste Buds! Spice things up with a few House-Made Shrimp Gritters. This new starter consists of 5 Gritters filled with Blackened Shrimp & Pimento Cheese, encrusted with seasoned panko breading and fried, garnished with local Huckle's Late Harvest Jalapeno Aioli. "View Entire Post" to learn more about the seasonal selections coming your way this March! This March, all Miss Shirley’s Cafe locations are featuring all-new flavor packed Pancake, French Toast & Omelet selections that are sure to satisfy! "View Entire Post" for Full Names & Descriptions of all of our March 2017 Specials! 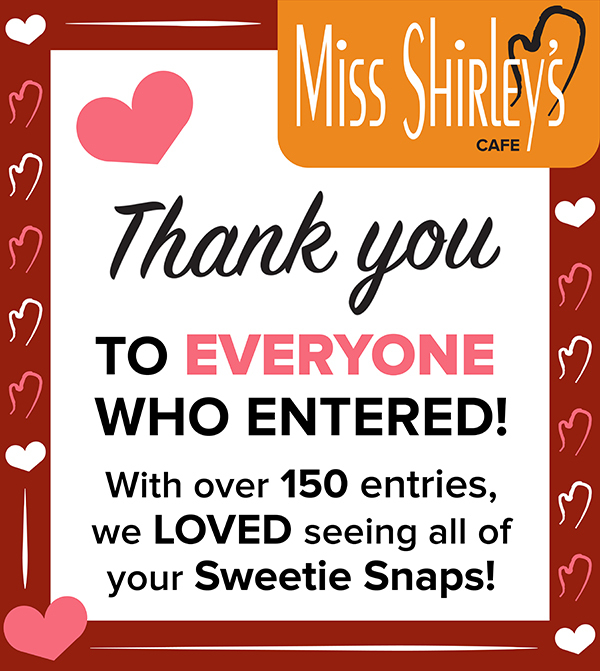 Congratulations to our Shirley's Sweetie Snapchat Winners! In February, Miss Shirley's created a date-worthy Snapchat geofilter, perfect for capturing the moment with your sweetheart! All month long, you sent in your Sweetie Snaps, and we were so overwhelmed to receive over 150 entries - which is why we couldn't choose just one winner! "View Entire Post" to check out the winning photos! They say that the way to someone's heart is through their stomach, which is why we've got some sweet eats that are sure to seduce your sweetie this month! In celebration of Valentine's Day, all Miss Shirley's Cafe locations are featuring our much-loved Red Velvet Pancakes with Cream Cheese Icing, as well as an assortment of other decadent & delicious dishes! "View Entire Post" to check out all of our February Pancake, French Toast & Omelet Specials! Send Us a Snap with your Sweetie for the Chance to WIN! February is the month of love, which is why we've created a date-worthy geofilter, perfect for capturing the moment with your sweetheart! 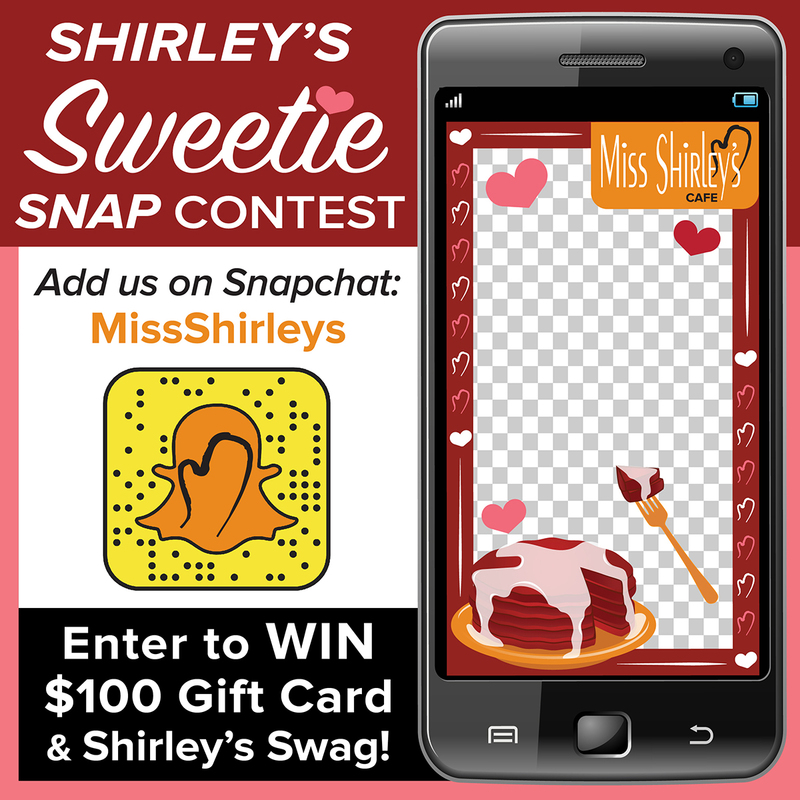 Send us your photo on Snapchat & you'll be entered into Shirley's Sweetie Snap Contest, for the chance to WIN a $100 Gift Card & Shirley's Swag! "View Entire Post" for Shirley's Sweetie Snap Contest Rules & Restrictions. 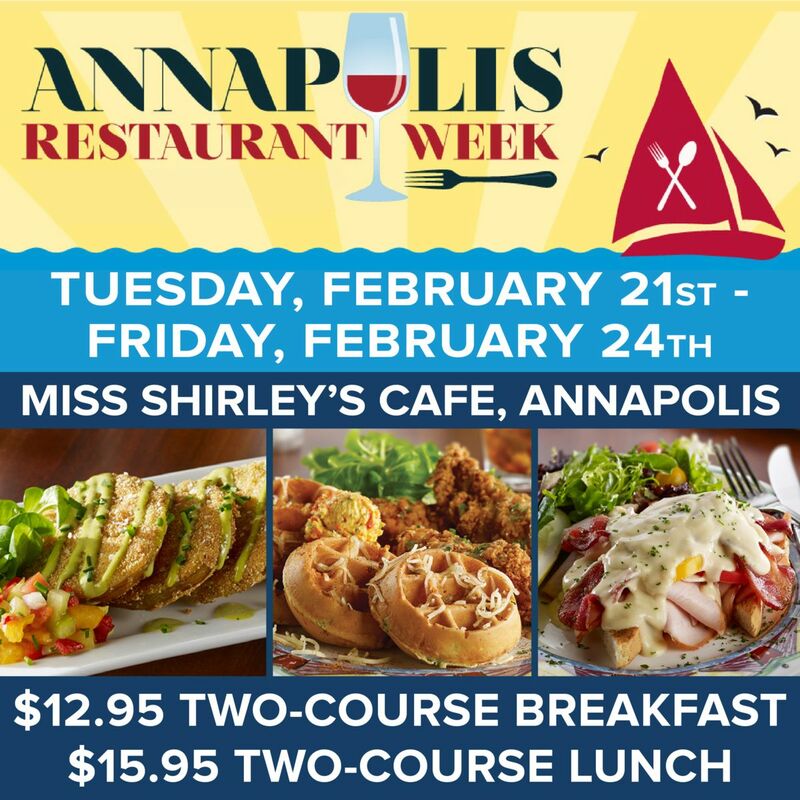 Take Advantage of Miss Shirley's Annapolis Restaurant Week Deals! Looking for the perfect opportunity to sample Miss Shirley's signature & seasonal dishes? Look no further! 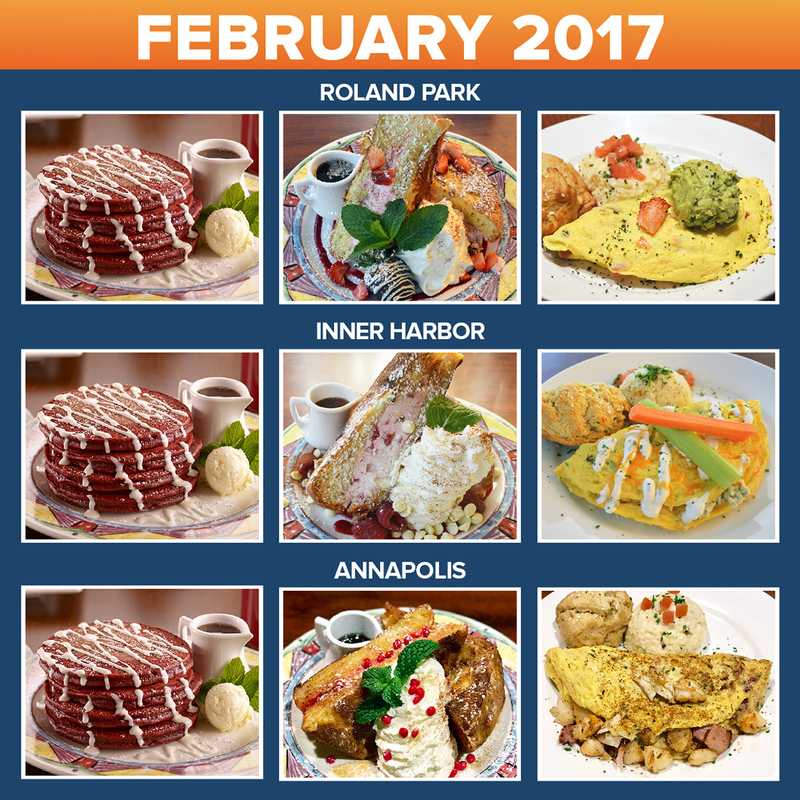 Miss Shirley's Cafe, Annapolis is offering $12.95 Two-Course Breakfast & $15.95 Two-Course Lunch deals for Annapolis Restaurant Week, Tuesday, February 21st - Friday, February 24th. 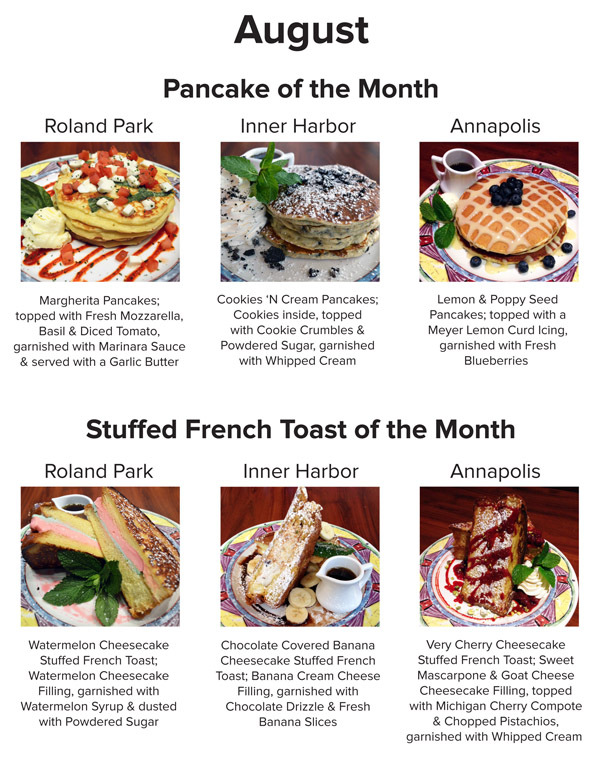 "View Entire Post" to view Miss Shirley's full Annapolis Restaurant Week Menu! Happy New Year! 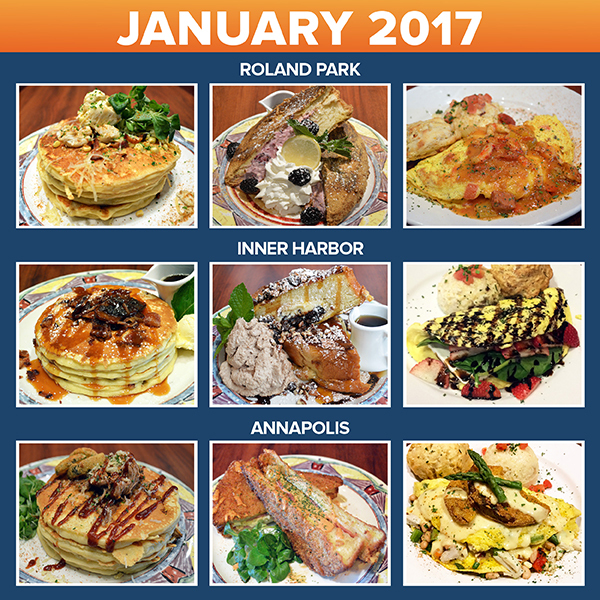 We're celebrating 2017 with a delicious array of new Pancake, French Toast & Omelet of the Month Selections at each location! "View Entire Post" to check out full Names & Descriptions of Miss Shirley's January Specials. Join us for Baltimore's Winter Restaurant Week 2017! Love Miss Shirley's Southern-inspired Breakfast & Lunch? 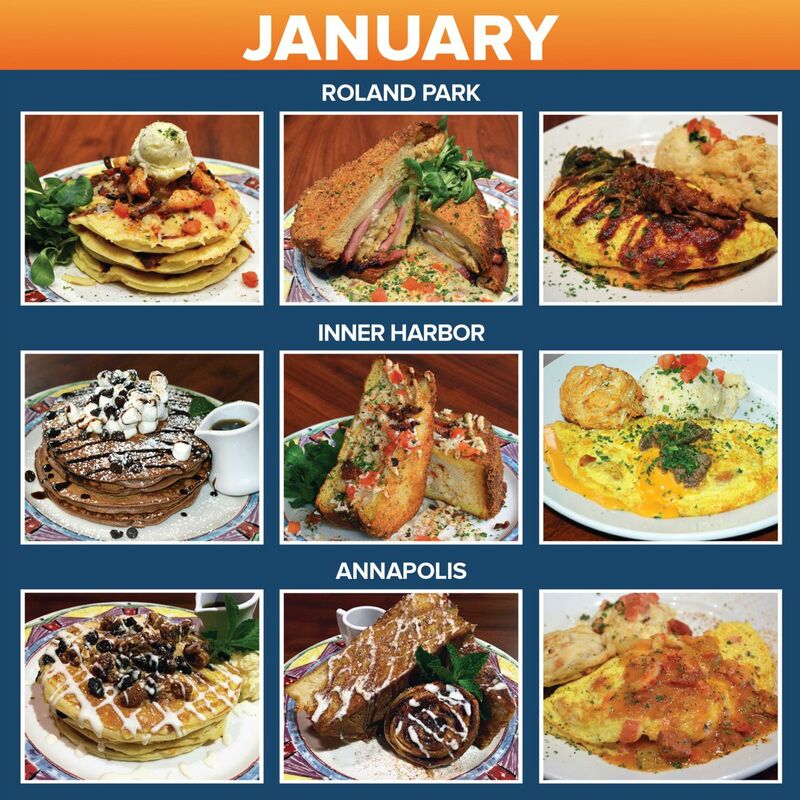 Visit our Roland Park and Inner Harbor locations between Tuesday, January 17th - Friday, January 20th and between Monday, January 23rd - Friday, January 27th for our special Baltimore Restaurant Week Menu! Both Baltimore locations are offering $15 Two-Course Breakfast and $18 Two-Course Lunch options, featuring some of our favorite signature and seasonal dishes. "View Entire Post" to view Miss Shirley's Baltimore Restaurant Week Menu! Celebrate 2016 - A Year In Review! As the year ends, we think about all we have accomplished in 2016, including our National TV Debut on Food Network’s Diners, Drive-Ins & Dives, David Dopkin selected as Restaurateur of the Year by the Restaurant Association of Maryland, being named one of America’s Favorite Family-Friendly Restaurants by Food Network, and voted Best Business Lunch Restaurant in Capital Gazette’s Readers’ Choice Awards! "View Entire Post" to check out our 2016 Year In Review Timeline! 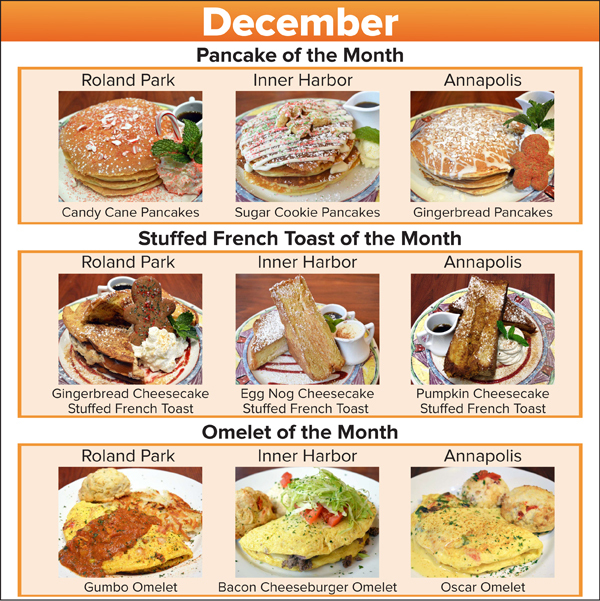 The Holiday Season has officially begun and we're celebrating with Festive Pancake, French Toast & Omelet Specials at all Miss Shirley's Cafe locations this month! 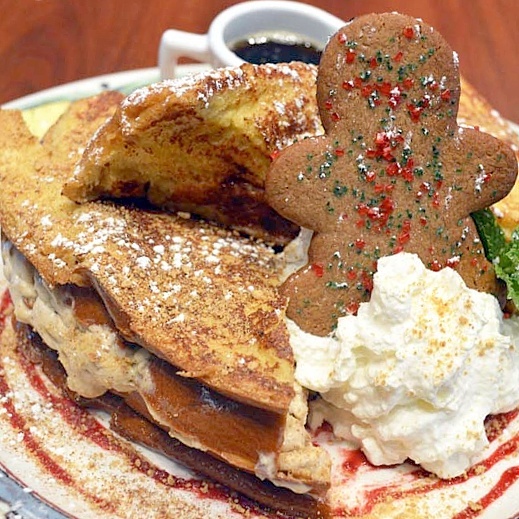 Try Delicious Dishes inspired by Holiday Sweets like Candy Cane Pancakes, Hot Chocolate Pancakes, Sugar Cookie Cheesecake Stuffed French Toast & Gingerbread Cookie Cheesecake Stuffed French Toast! "View Entire Post" to check out full Names & Descriptions for all of our December Specials! Looking for the perfect dish to impress your Holiday guests? You're in luck! Corporate Executive Chef Brigitte Bledsoe is giving YOU her Recipe for our Shirley's Affair with Oscar - awarded Best Breakfast Dish in Maryland by Food Network Magazine! 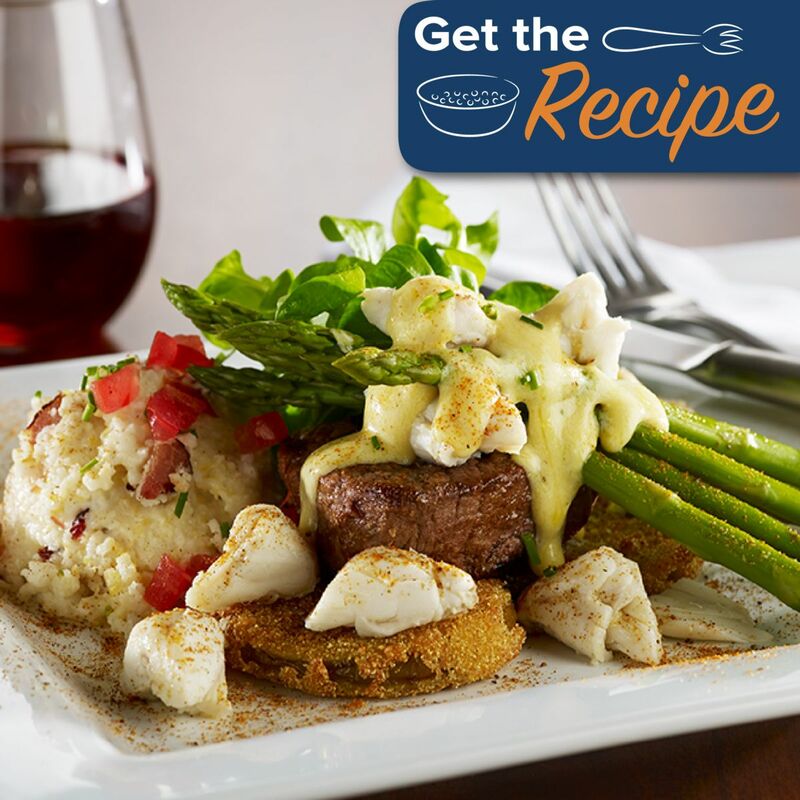 This Award Wining combination of Stone Ground Grits with Diced Bacon, Fried Green Tomatoes, Jumbo Lump Crab Meat, Roasted Asparagus and Beef Tenderloin Center Cut Filet is sure to "Wow" your family & friends this season! "View Entire Post" to get the Recipe! 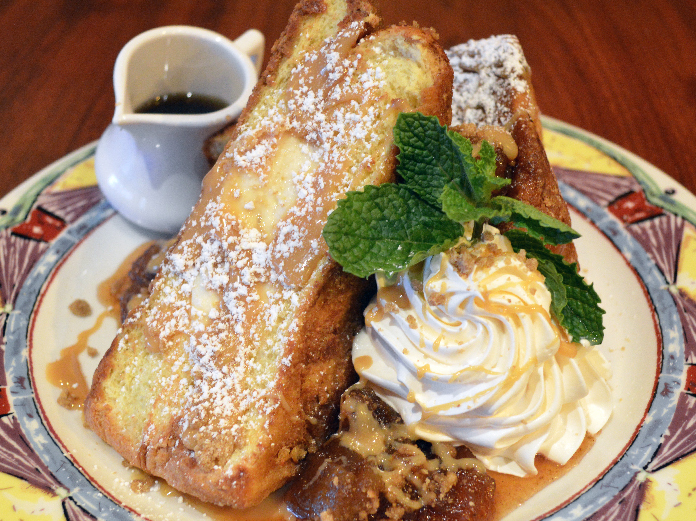 This November, we're thankful for Thanksgiving Stuffed French Toast at all Miss Shirley's Cafe locations! We're also featuring some of our much-loved Fall Favorites, like Pumpkin Raisin Pancakes, Sweet Potato Pancakes & our Thanksgiving-inspired "Gobble Gobble Omelet." 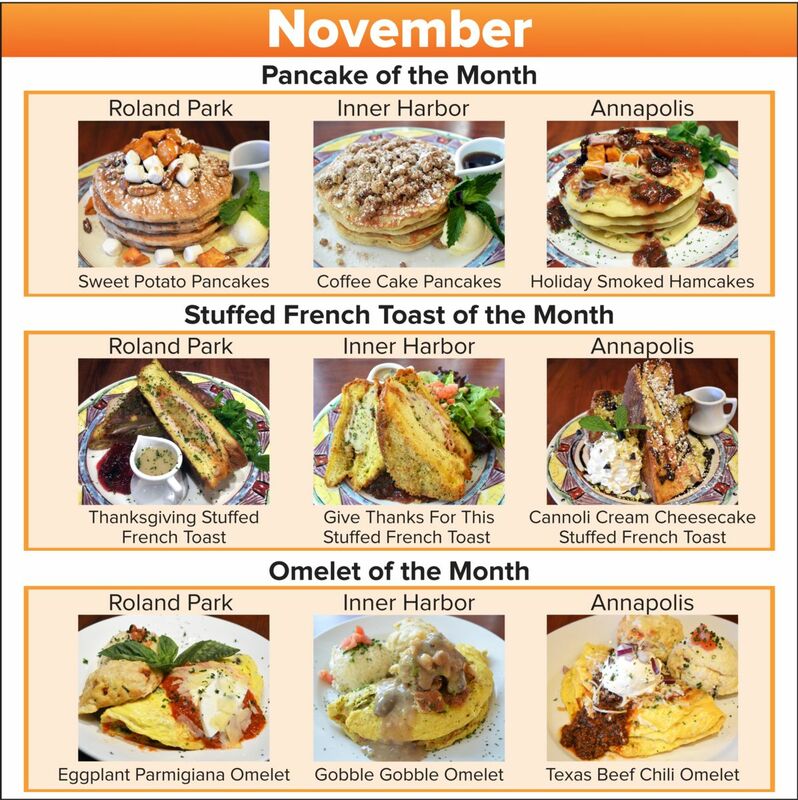 "View Entire Post" to check out the rest of our November Pancake, French Toast & Omelet Specials! To Corporate Executive Chef Brigitte, Fall is all about cozying up on the couch with a hearty meal & the Ravens game on TV! And her all-time favorite Fall food has got to be the fresh local Oysters! 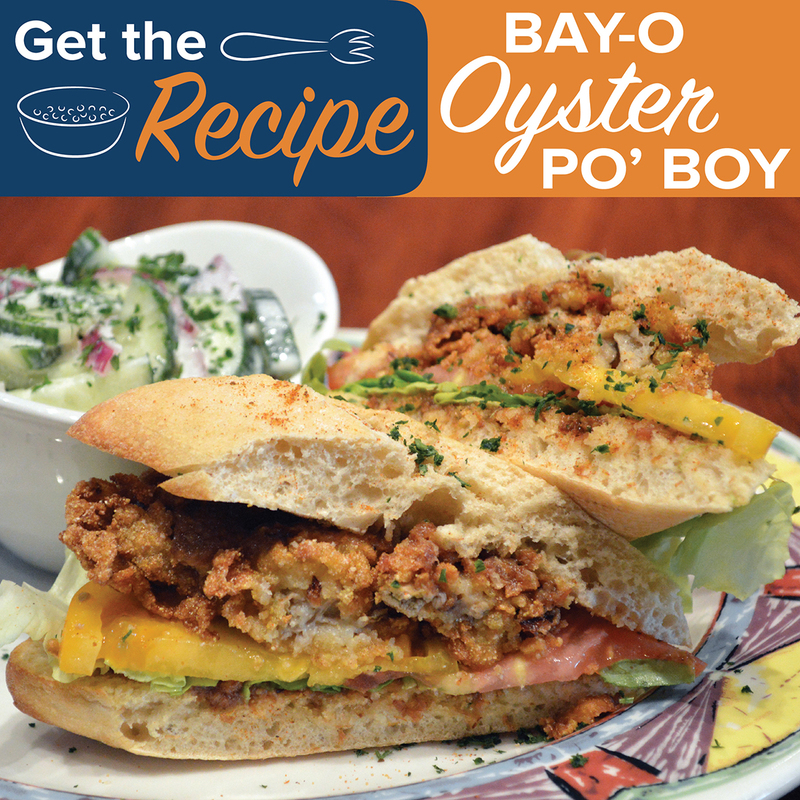 That’s why she's giving YOU her recipe for our Bay-O Oyster Po’ Boy! 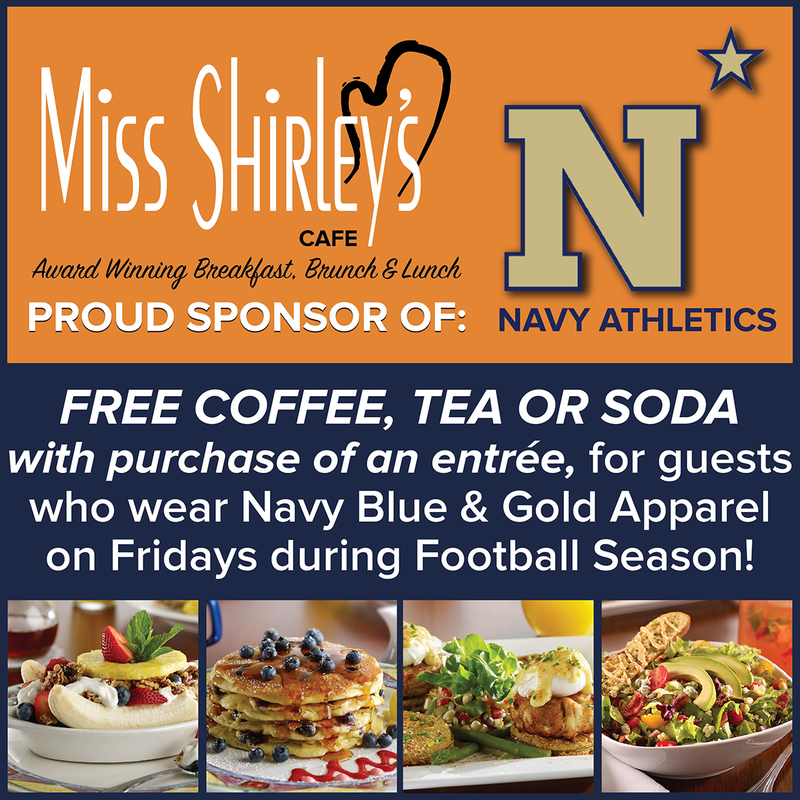 As a proud sponsor of Navy Athletics, Miss Shirley's Annapolis location is participating in Navy's Blue & Gold Fridays Promotion! Any guests who wear their Navy Blue & Gold Apparel to our Annapolis location on Fridays throughout the Navy Football Season, can receive a FREE Coffee, Tea or Soda, with the purchase of an entrée! "View Entire Post" for full details and restrictions. At Miss Shirley's, we think October means Pumpkin Spice! 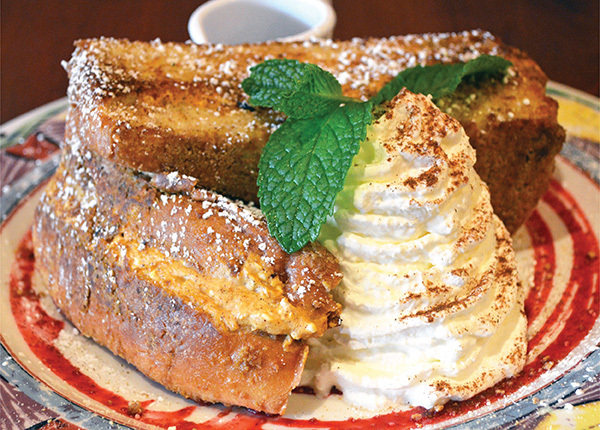 That's why all Miss Shirley's Cafe locations are featuring our much-loved Pumpkin Cheesecake Stuffed French Toast! 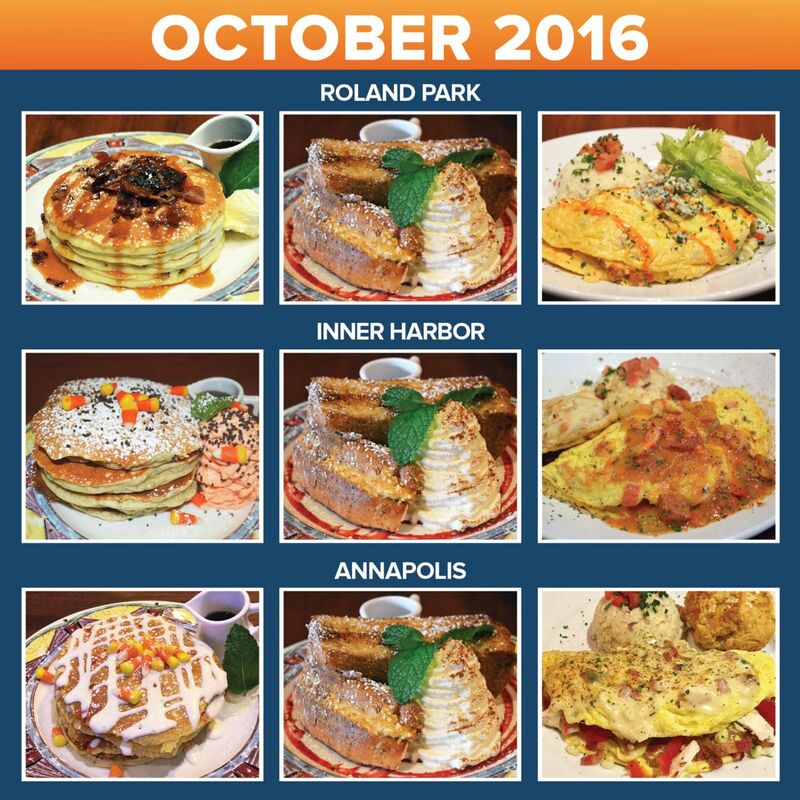 We're also featuring festive sweets like the new Trick or Treat Pancakes with Crushed Oreos, Candy Corn & Orange Whipped Cream at Miss Shirley's Inner Harbor location and Candy Corn Pancakes with Cream Cheese Icing in Annapolis. "View Entire Post" to check out the rest of our October Pancake, French Toast & Omelet Specials! The weather is cooling down and the smell of Pumpkin Spice is in the air! That's why we're featuring our fun & festive Pumpkin Cheesecake French Toast at all Miss Shirley's Cafe locations during the month of October! But the Fall & Winter seasons are also the perfect time to cozy up in the kitchen and share in the joy of cooking, which is why Corporate Executive Chef Brigitte Bledsoe is giving YOU the Recipe for Miss Shirley's much-loved seasonal treat. "View Entire Post" to get the recipe now! 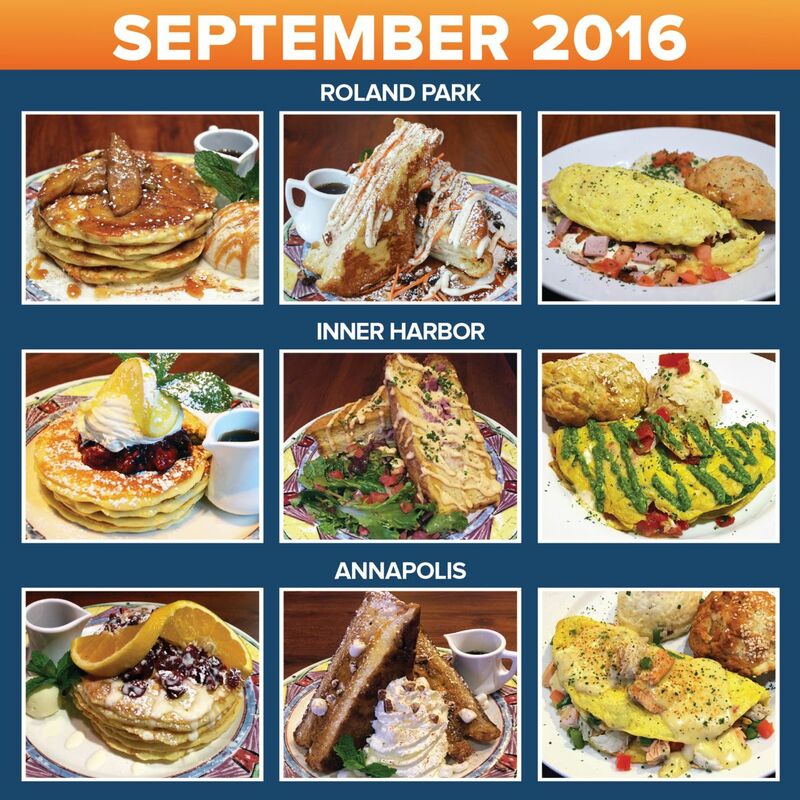 NEW 2016 Fall Menu Debuts September 22nd! With the days slowly growing cooler, the leaves will soon begin to change - and so will Miss Shirley’s Seasonal Selections! Miss Shirley’s NEW Fall Menu debuts at all locations tomorrow, Thursday, September 22nd, featuring all-new cool-weather dishes. This season, Corporate Executive Chef Brigitte Bledsoe and her culinary team have added some Savory Starters that are sure to Wake Up Your Taste Buds! “Take a dip” into the new Blackened Shrimp Pimento Skillet, served with Ciabatta Toast, or snack on Bloody Mary Deviled Eggs, inspired by Miss Shirley’s much-loved Spicy Shirley cocktail. "View Entire Post" to read about more of our seasonal selections! Happy September! Fall is on it's way, and we're celebrating with all-new comforting and delicious Pancake, French Toast & Omelet Specials! 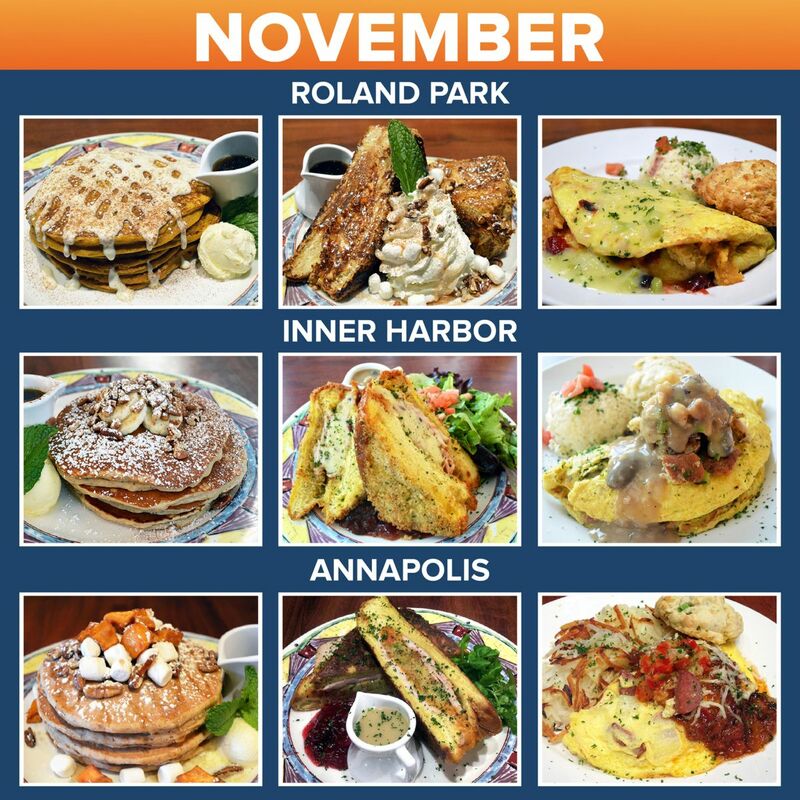 Put a fork into cozy Caramel Apple Pancakes in Roland Park; Roasted Tomato, Artichoke & Pesto Omelet in Inner Harbor or Pecan Pumpkin Cheesecake Stuffed French Toast in Annapolis! "View Entire Post" to check out the rest of our September Specials at all locations. NEW Fall 2016 Menu Coming Soon! As the days slowly grow cooler and the leaves begin to change, so will Miss Shirley’s Seasonal Selections! On Thursday, September 22nd, cozy up to delicious new cool-weather dishes, with the debut of Miss Shirley’s Fall Menu at all locations! 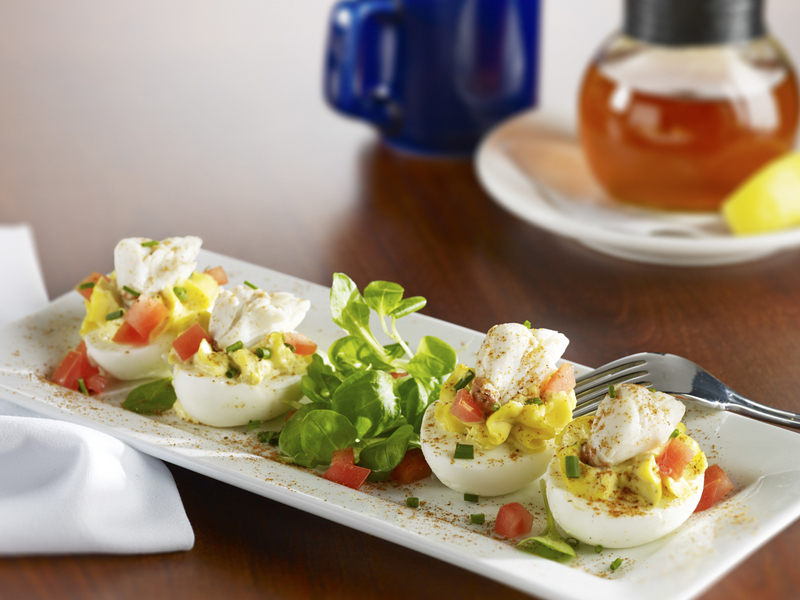 This season, we’ve added some Savory Starters that are sure to Wake Up Your Taste Buds! 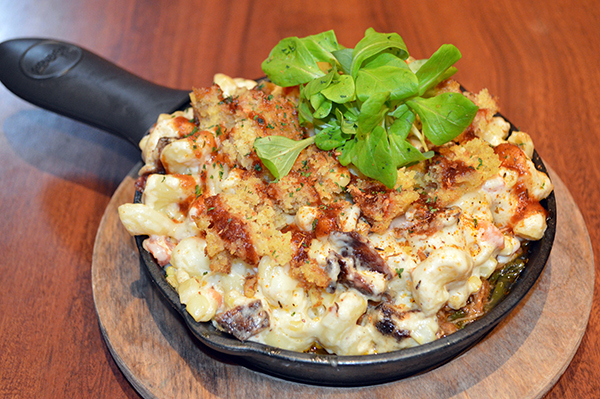 “Take a dip” into our Shrimp Pimento Skillet, served with Ciabatta Toast, or snack on new Bloody Mary Deviled Eggs, inspired by our much-loved Spicy Shirley cocktail - kick them up a notch by adding on Jumbo Lump Crab Meat or Jalapeño-Smoked Bacon! We’re also bringing back fan favorites like Miss Shirley’s Gumbo with Andouille Sausage, Chicken, Shrimp, Crawfish Meat, Okra & Tomatoes, topped with Stone Ground Grits with Diced Bacon. 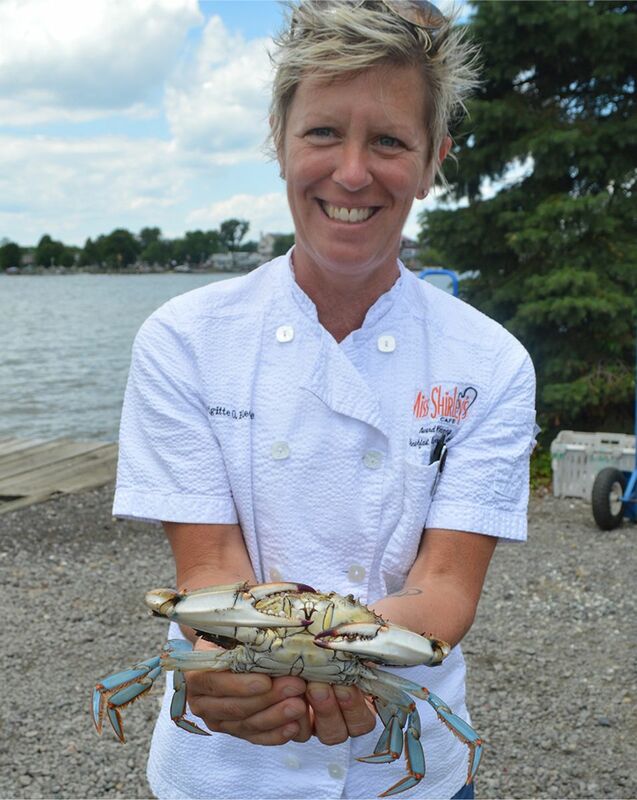 Growing up, Miss Shirley's Corporate Executive Chef Brigitte spent the majority of her time by the ocean, which is how her love of seafood developed. Brigitte's grandparents used to own a hotel called The Fairfax down in Ocean City, and she would visit every summer. Brigitte would head out to the beach at 7 a.m. and soak up the sun all day! "Nowadays, I spend my free time gardening, or on my porch reading and watching the hummingbirds make their way towards the bird feeders I have scattered across my yard." 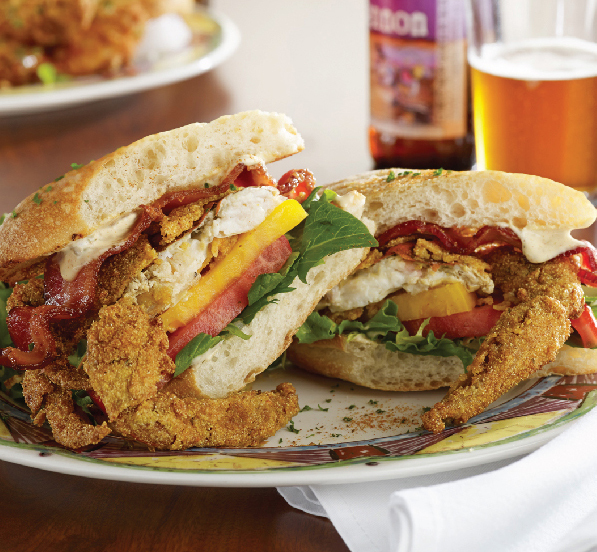 But, Brigitte's favorite thing about summer has got to be the fresh seafood options, like Soft Shell Crabs! 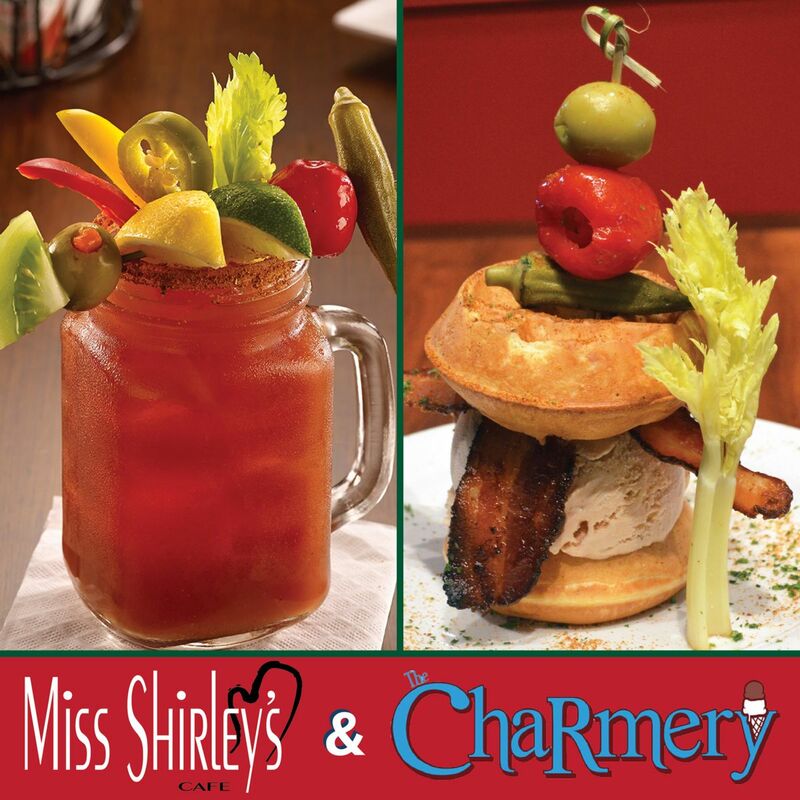 At Miss Shirley’s, her favorite Soft Shell dish is definitely the Soft Shell Crab & Succotash Eggs Benedict! It features local Logan’s Sausage Company’s Chesapeake Chicken Sausage and Black Eyed Pea Succotash on a Jumbo English Muffin with Old Bay Holandaise Sauce. 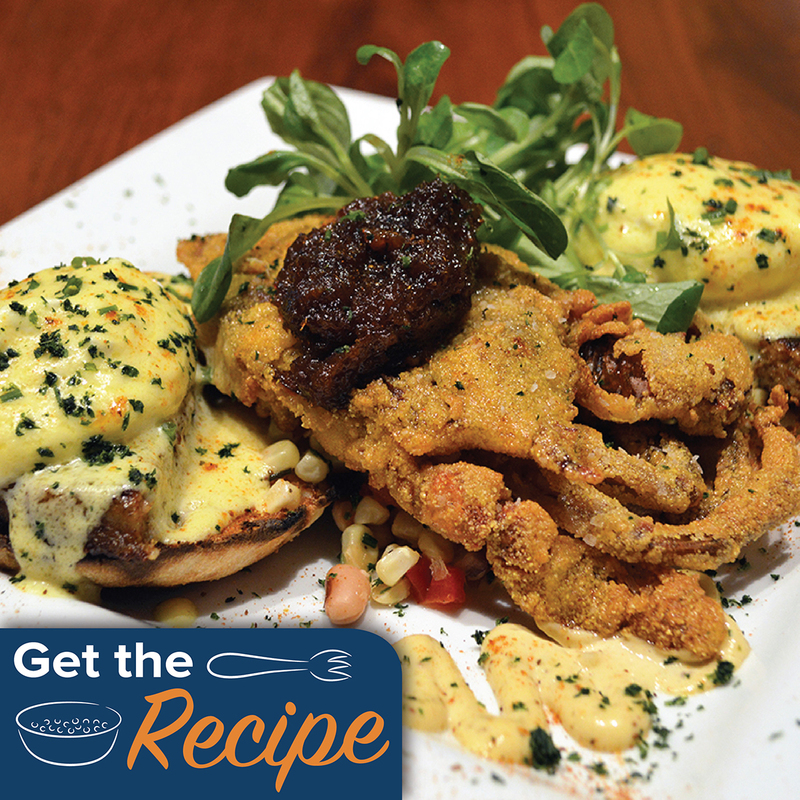 "View Entire Post" to get her Soft Shell Crab & Succotash Eggs Benedict Recipe! 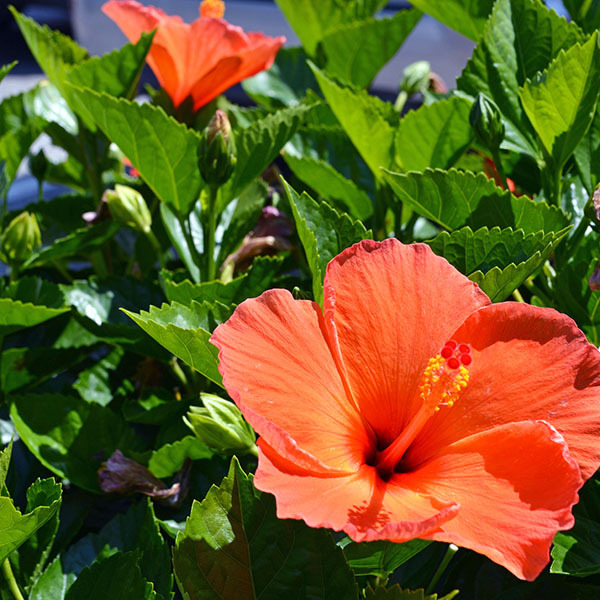 Gardening can be a relaxing and rewarding pastime for the mind, body & soul. It allows you to escape the hustle & bustle of daily life to soak in some vitamin D, peacefully connect with nature, and get a great workout! Nevertheless, a green thumb isn’t necessarily something that you are born with. Gardens require a constant source of water, sunlight, and T.L.C., but don’t let that dissuade you in your pursuit to grow! 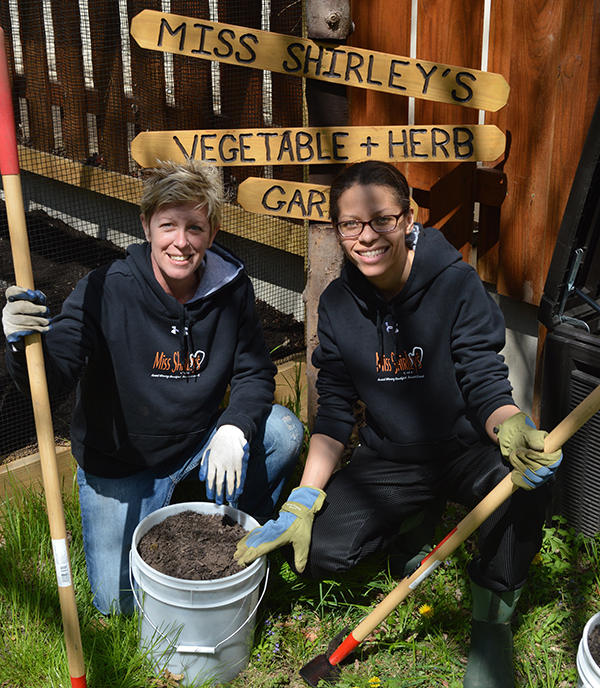 If anybody knows how challenging, yet rewarding gardening can be, it’s Miss Shirley’s Corporate Executive Chef Brigitte & Executive Chef Zuri! With the assistance of our Inner Harbor location's Executive Chef Eric, they cultivated the Fresh Vegetable & Herb Garden at Miss Shirley’s Roland Park location in 2014, and have kept it thriving ever since! So for newcomers to the gardening world, we sat down to chat with Brigitte & Zuri to get their top tips & tricks on how to maintain a flourishing Vegetable & Herb Garden! "View Entire Post" to check out their helpful hints! 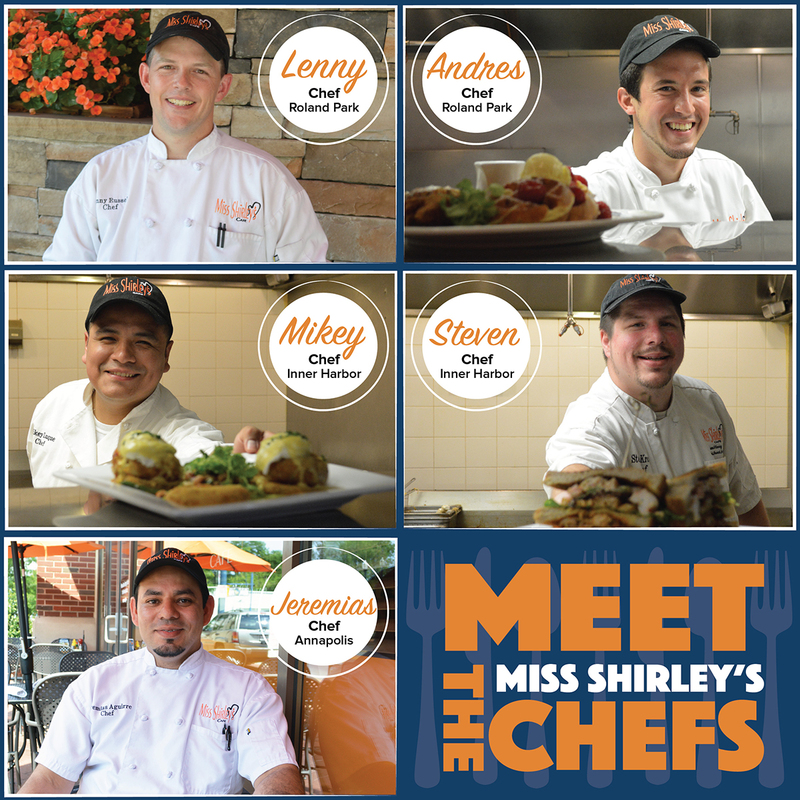 Last month, you had a chance to learn about Miss Shirley's Executive Chefs, so we thought it was about time to highlight the rest of the Chefs, who are a part of our fantastic culinary team! "View Entire Post" to read all about Miss Shirley's Chefs! 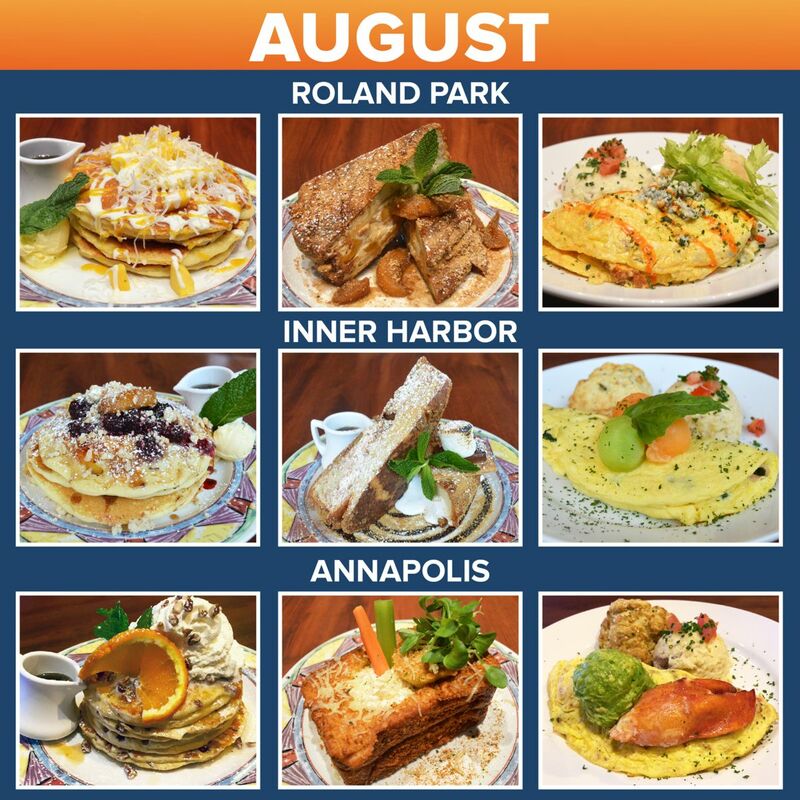 This August, we're featuring Pancake, French Toast & Omelet Specials that are sure to get your mouth watering! 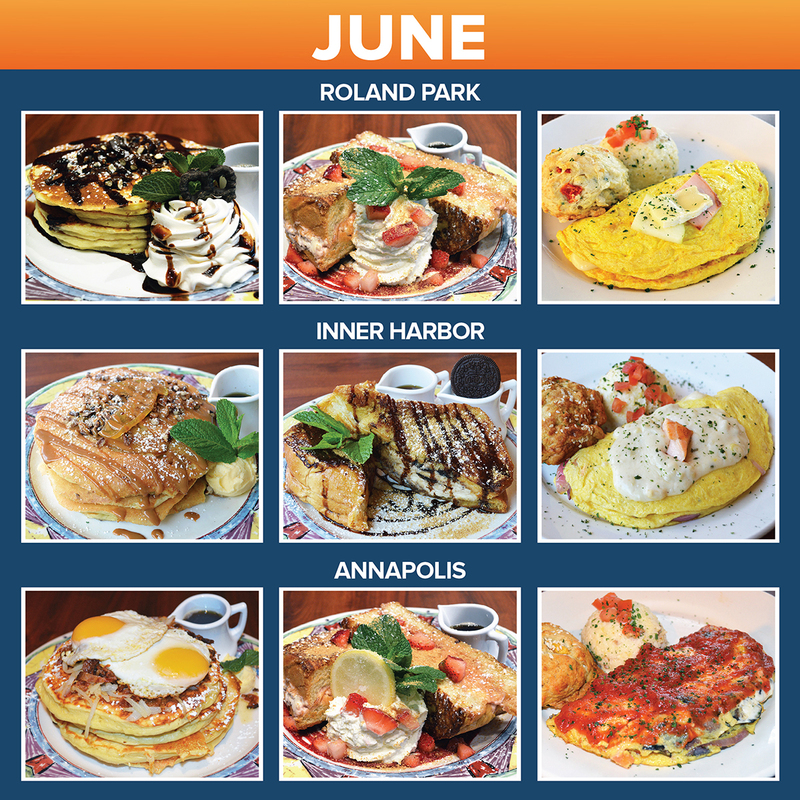 Try the NEW Tropical Pineapple Mango Coconut Pancakes at the Inner Harbor, savory Bacon Cheeseburger Stuffed French Toast in Roland Park or Hot Brown Omelet in Annapolis! "View Entire Post" for full Names & Descriptions of all of our August Specials! 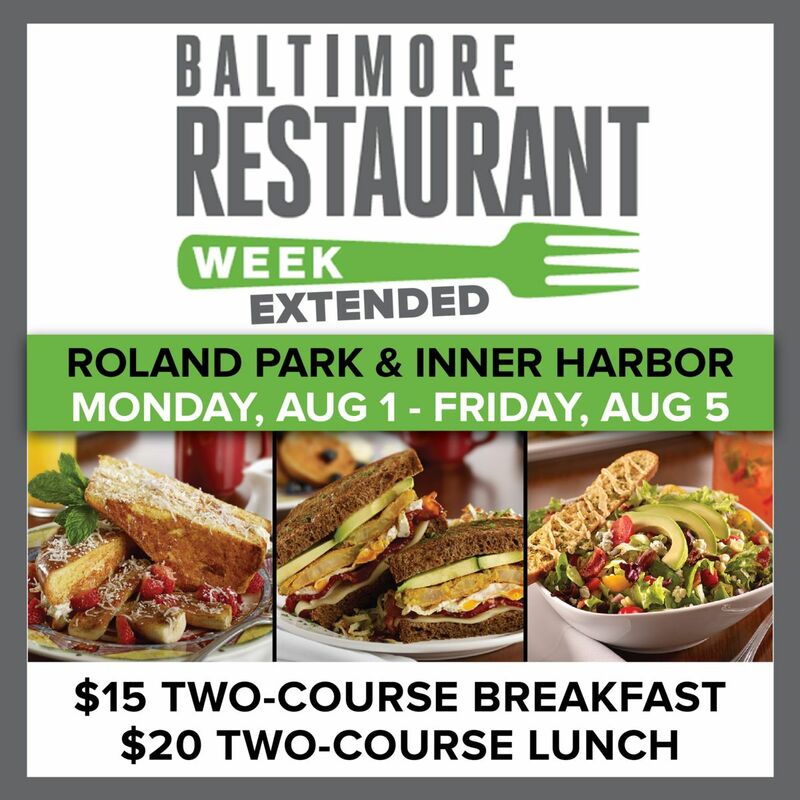 Baltimore Summer Restaurant Week EXTENDED! Haven’t had the chance to take advantage of Miss Shirley’s Summer Restaurant Week Deals? 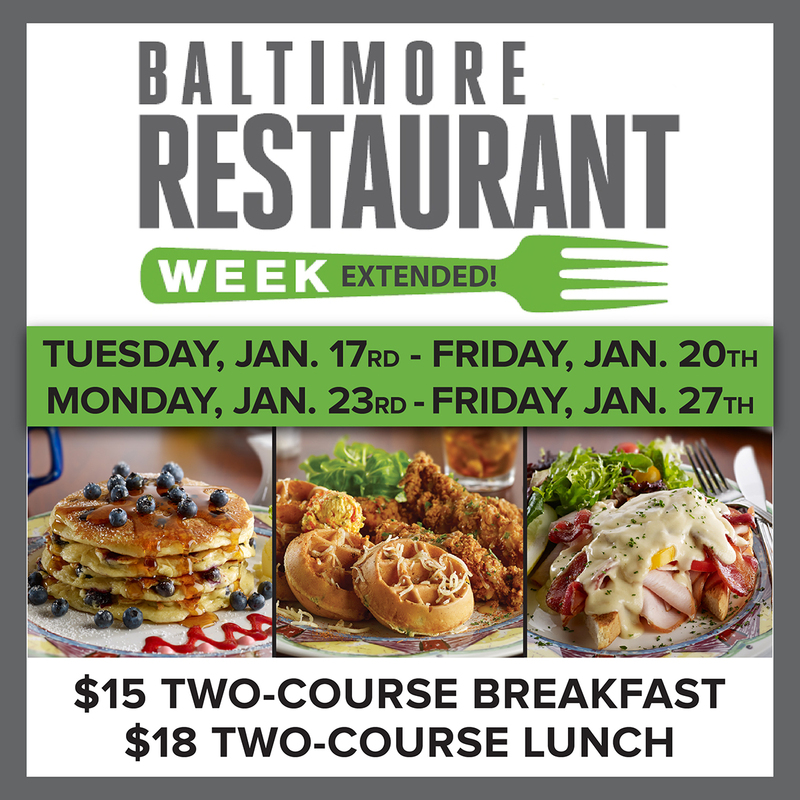 No worries – Baltimore’s Restaurant Week has been EXTENDED! 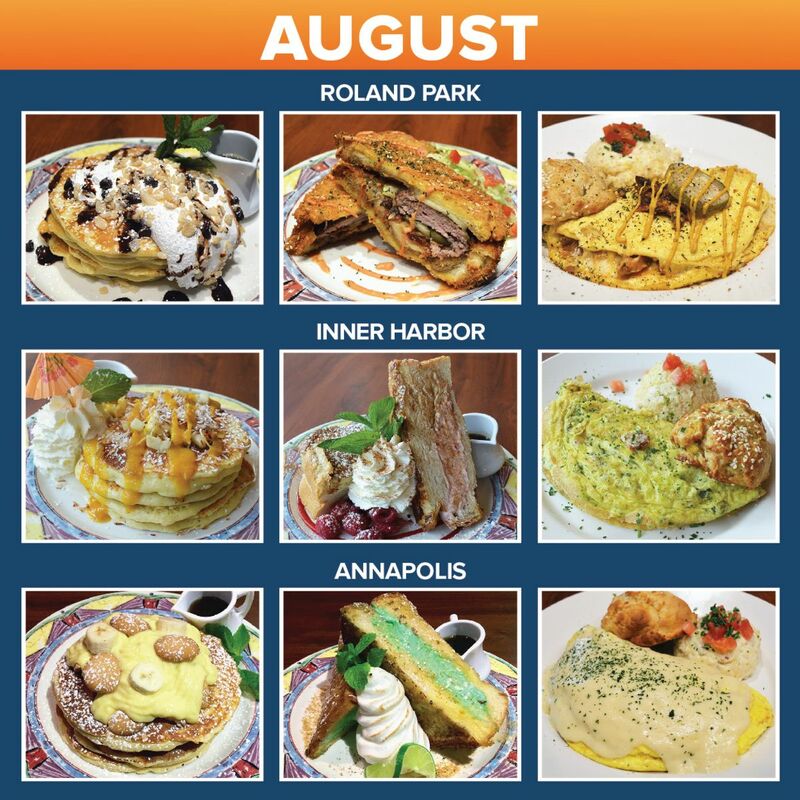 Visit Miss Shirley’s Roland Park or Inner Harbor locations for Two-Course Breakfast & Lunch Deals on Monday, July 25th - Friday, July 29th & Monday, August 1st – Friday, August 5th! "View Entire Post" to view our Restaurant Week Menu! Hey, all you Pokémon Trainers! What cool creatures have YOU found while dining with us? 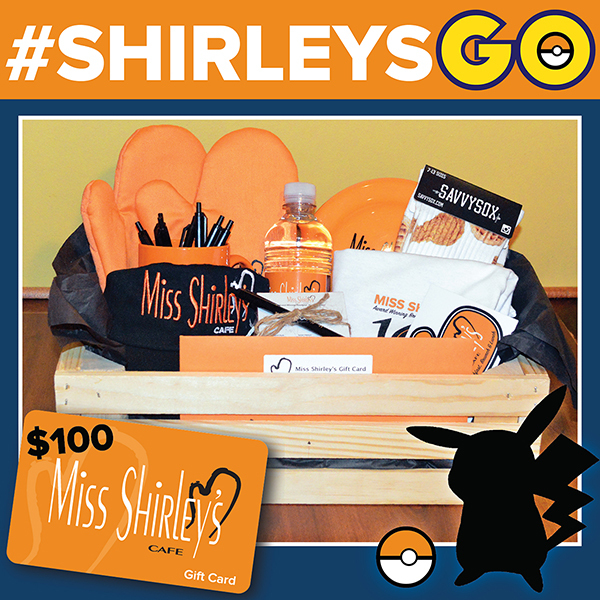 Show us your funny & creative Pokémon GO photos for the chance to WIN a $100 Gift Card & Shirley's Swag! "View Entire Post" to learn how to enter! Get ready for a fun-filled July! 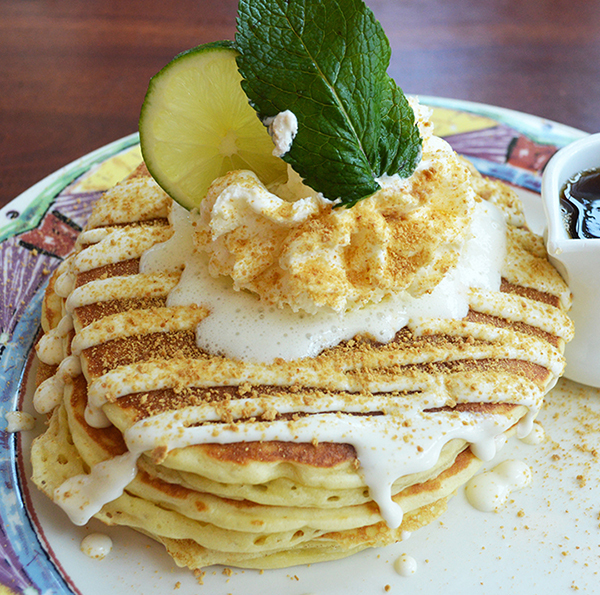 We're bringing back a childhood favorite in this month's Specialty Pancakes. "View Entire Post" to find out more! The summer sun has finally shed it’s light, and the season for outdoor dining is well underway. So, get out of the house or office, and catch some rays while enjoying Shirley’s Light & Fresh Summer Selections! 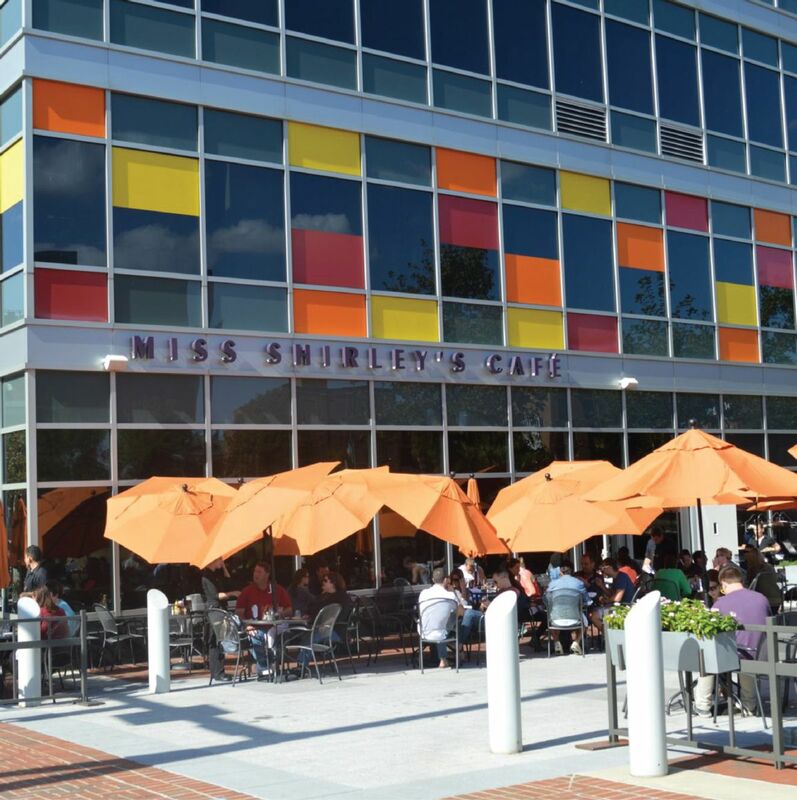 Settle into a sunny spot on Miss Shirley’s Inner Harbor patio and sip on House-Made Mornin’ Cocktails like our Strawberry Lemonade Mojito, Blackberry Peach Tea Crush, White Summer Sangria or Spicy Shirley Bloody Mary! 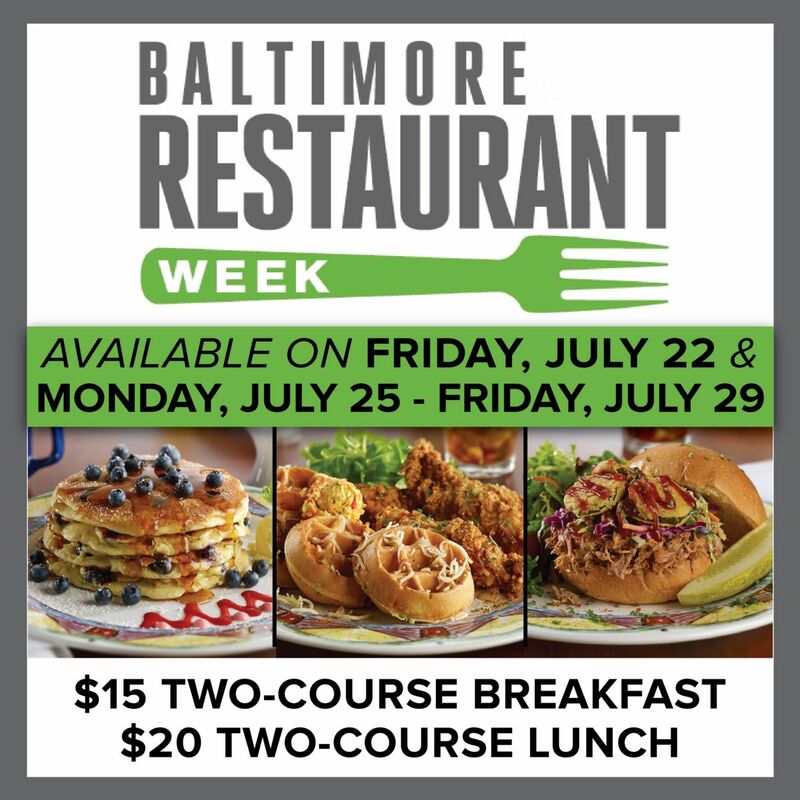 Baltimore Restaurant Week Breakfast & Lunch Deals! Have you been waiting for the perfect time to try out some of Shirley's Signatures? 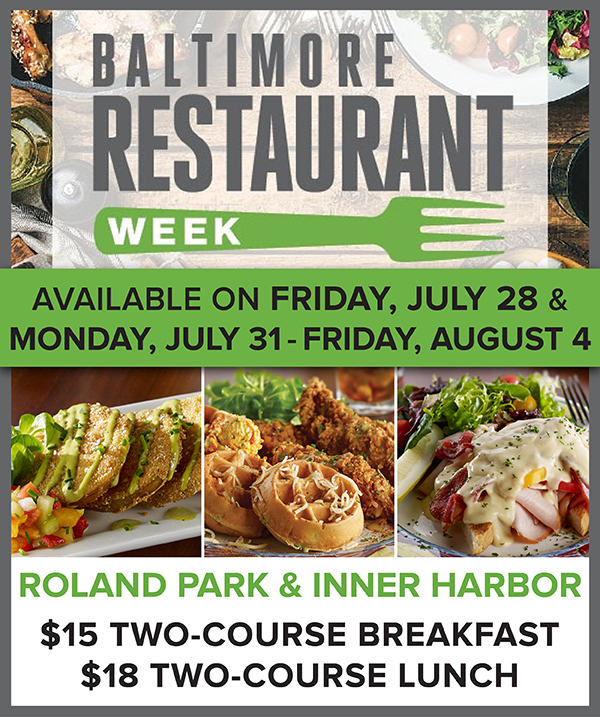 Visit Miss Shirley's Roland Park or Inner Harbor location for Baltimore Restaurant Week! Both locations will be offering Two-Course Breakfast & Lunch Deals on Friday, July 22nd & Monday, July 25th - Friday, July 29th only! "View Entire Post" to view our Baltimore Restaurant Week Menus! Get the Recipe for National Egg Day! Today is one of Miss Shirley's favorite national holidays - National Egg Day! There are over a hundred different ways to cook this delicious, protein-packed breakfast staple, but at Miss Shirley's Cafe, one of our favorite ways to incorporate eggs is in our much-loved Eggs Benedict! 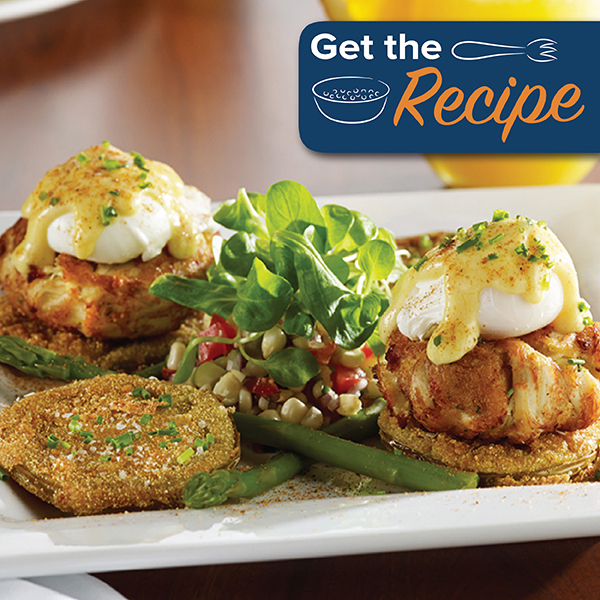 "View Entire Post" to get the recipe for our Crab Cake & Fried Green Tomato Eggs Benedict! 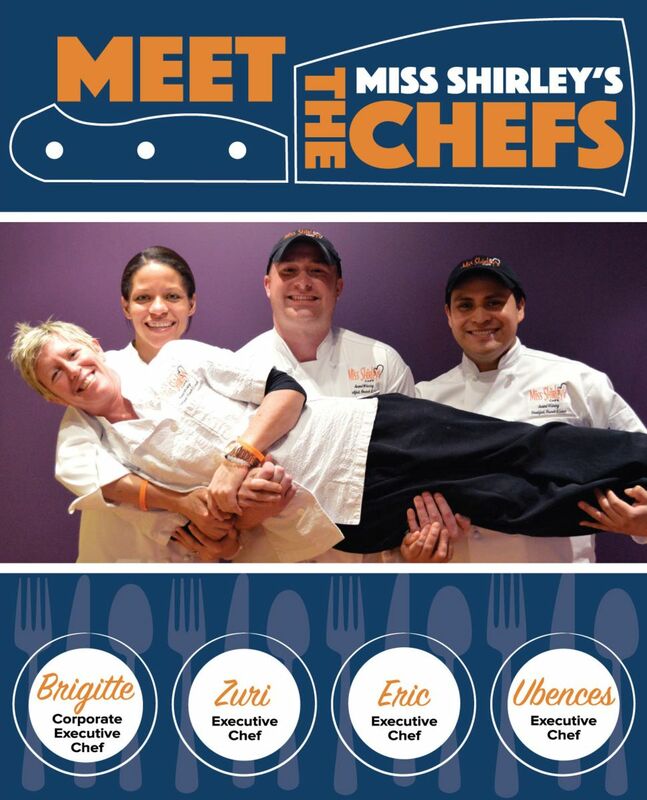 Meet Miss Shirley's EXECUTIVE CHEFS! Ever wonder who is creating and cooking up your Miss Shirley’s award winning breakfast, brunch and lunch favorites? The culinary team at Miss Shirley’s Café is comprised of a group of diverse and talented chefs, who all share a strong passion for food, as well as the goal of achieving excellence and perfecting their craft. Each chef, with his or her unique background, tells a story through food with an emphasis on local ingredients and seasonality. "View Entire Post" to read about our amazing chefs! Always Brunching' - 7 Days a Week for Over a Decade! When most people think of Brunch, they picture a lazy Saturday or Sunday; but why limit this Mouthwatering Morning Meal to weekends only? Miss Shirley’s Cafe has been dedicated to serving our guests Award Winning Breakfast, Brunch & Lunch, seven days a week, for over a decade now! Step out of the office and add some flavor to your next Client Meeting, Team Member Appreciation Meal, or Association Gathering. They’ll be impressed and appreciative for the gesture of a comforting meal, like our Crab Cake & Fried Green Tomato Eggs Benedict, Coconut Cream Stuffed French Toast, Maryland Omelet or Cold Spring Lane Hot Brown! And with Graduations, End of School Year Celebrations, Weddings and Family Get-Togethers in season, it’s the perfect time to book your Weekday Group Event at Miss Shirley’s! 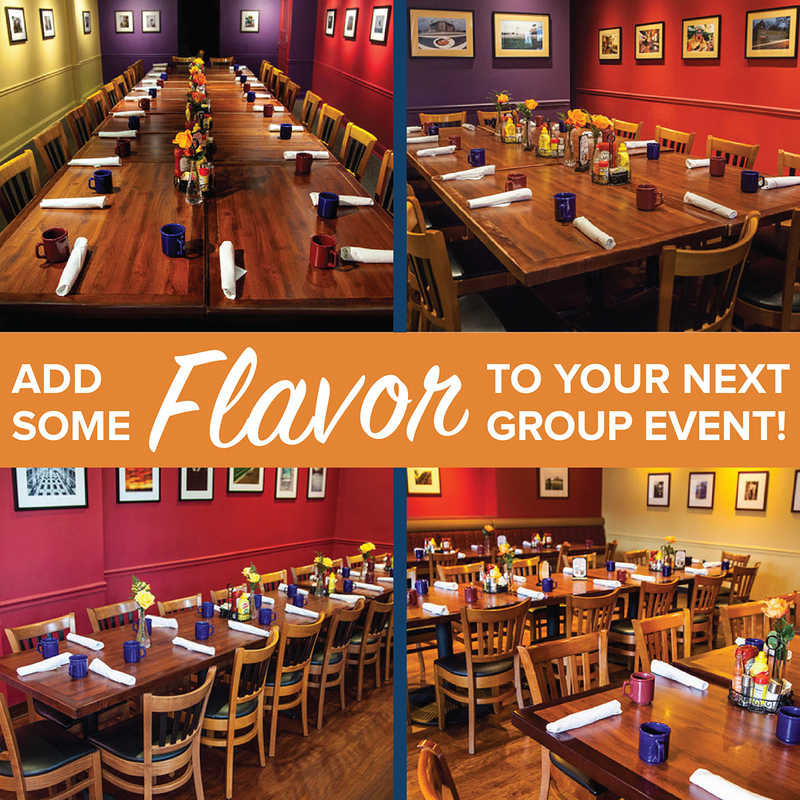 "View Entire Post" to learn more about Group Events! All-new Savory & Sweet Summer Specials are coming your way this month. 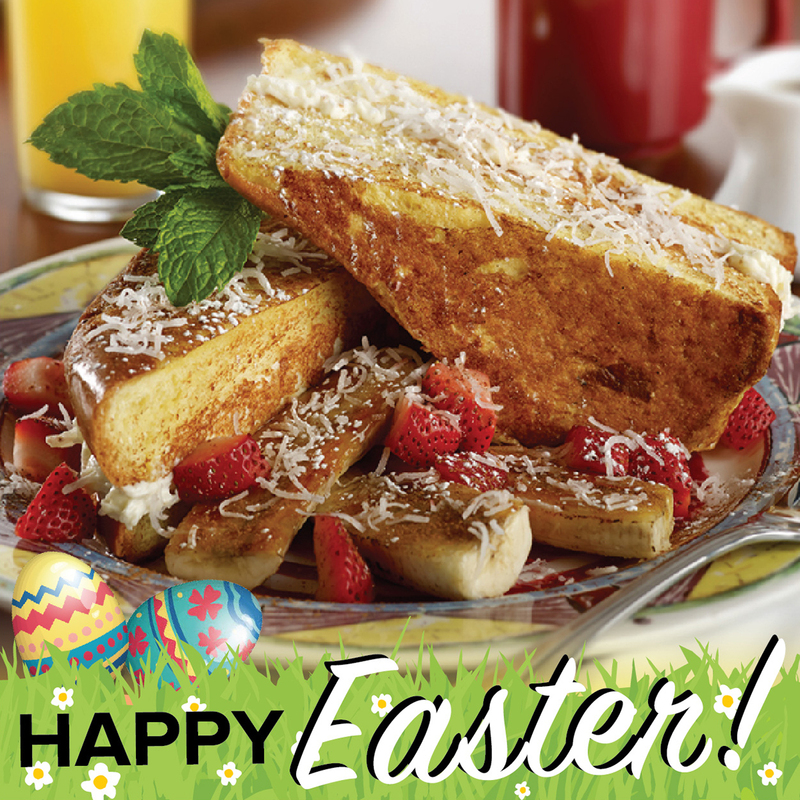 Indulge in sweet treats like Strawberry Cheesecake Stuffed French Toast or Caramel Apple Pecan Pancakes! And if you're a chocolate lover, you won't want to miss our much-loved Chocolate Covered Pretzel Pancakes & Oreo Cheesecake Stuffed French Toast. "View Entire Post" to check out all of our June Specials! 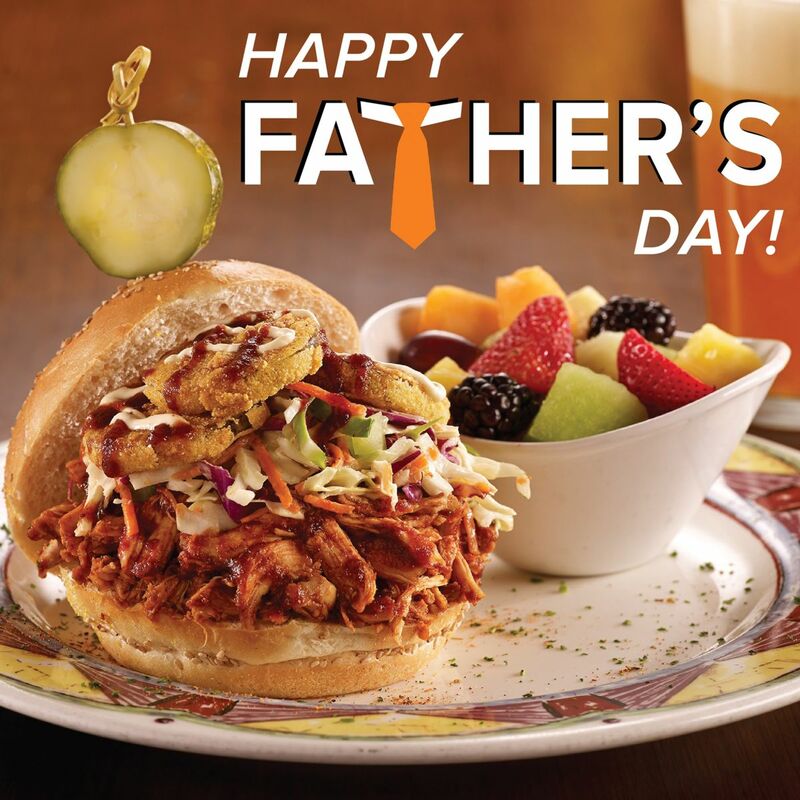 Treat Dad to a Food-Filled Father's Day! They say that the way to a man’s heart is through his stomach, so show Dad you care by treating him to a Food-Filled Father’s Day celebration at Miss Shirley’s this June! From Barbecue and Burgers to Seafood and Steak, we’ve got a menu that’s sure to suit Dad’s every craving. "View Entire Post" for our Father's Day Favorites. Each May, Food Allergy Research & Education, also known as FARE, hosts a nationwide week-long campaign, to shine a spotlight on the seriousness of food allergies, and to improve public understanding of this potentially life-threatening medical condition. 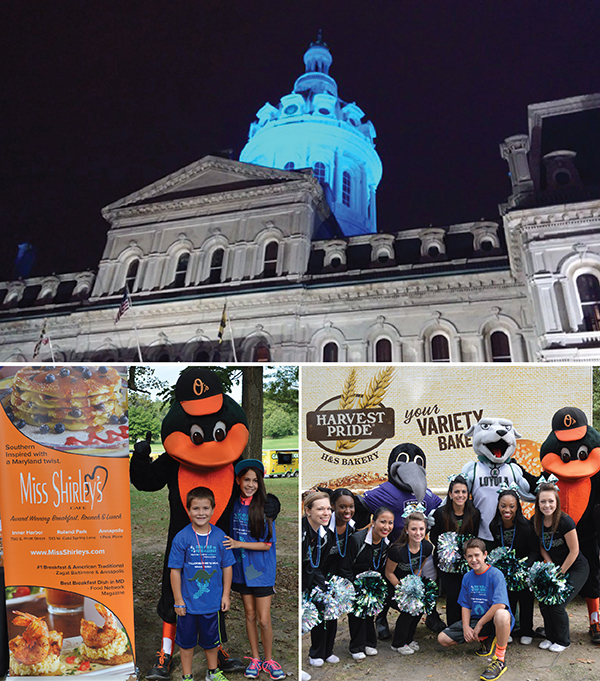 This year's Food Allergy Awareness Week is taking place now through May 14th, and Baltimore City is supporting the cause by lighting up City Hall in teal, the color associated with food allergy awareness! Every three minutes, a food allergy reaction sends someone to the emergency room in the U.S. As a restaurant, Miss Shirley's Cafe takes food allergies very seriously. In fact, it is a restaurant policy for our servers to ask guests, “Are there any food allergies at the table?” before any orders can be placed. This is why Miss Shirley’s is happy to help say "FAREwell to Food Allergies," in support of the upcoming local FARE Walk for Food Allergy on Sunday, October 9th at The Maryland Zoo in Baltimore! Miss Shirley’s has participated in, and sponsored, the FARE Walk for 5 consecutive years. "View Entire Post" to learn more about the upcoming walk! As Miss Shirley’s 10th Anniversary Year comes to a close, we reflect on all of the rewarding experiences we have had in the past year, including our 10 Months of #ShirleysGiving Charitable Campaign! Beginning in May 2015, Miss Shirley’s set out to show our appreciation to the community that has supported us for the last decade, by giving to one local charitable organization each month, for 10 months! "View Entire Post" to check out all of the wonderful organizations we were able to support! 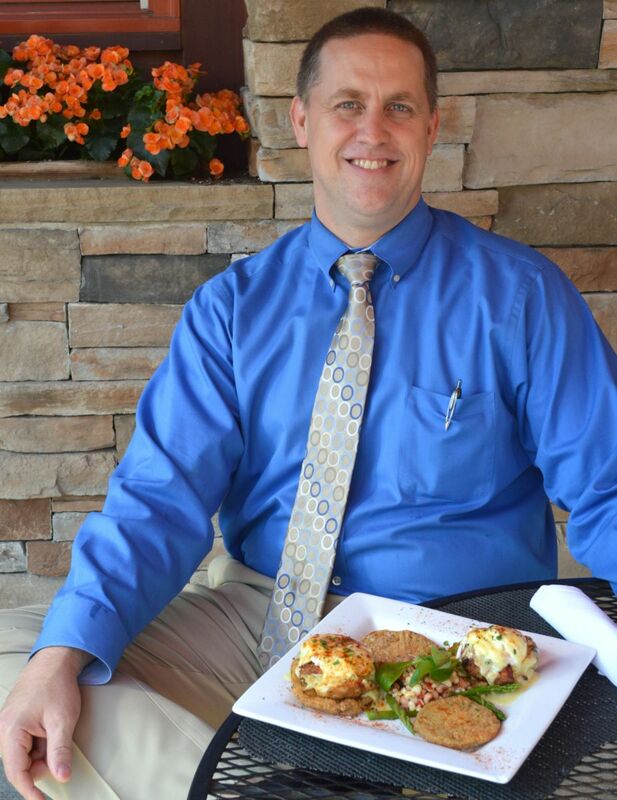 Miss Shirley's David Dopkin named Restaurateur of the Year! Miss Shirley’s Cafe is excited to announce that Managing Member, David Dopkin was named “Restaurateur of the Year” at the Restaurant Association of Maryland’s 2016 Stars of the Industry Awards Gala, which was held at the Baltimore Marriott Waterfront Hotel on Sunday, May 1st. David Dopkin and the entire Miss Shirley’s Cafe team are truly humbled and honored to accept this prestigious award, which was also awarded to David’s father and founder of Miss Shirley’s Cafe, Eddie Dopkin, only ten years ago. "View Entire Post" to read more about the award! Once a year we gather to celebrate our first love, Mom. But why only celebrate one day when she is there for you every day of the year? 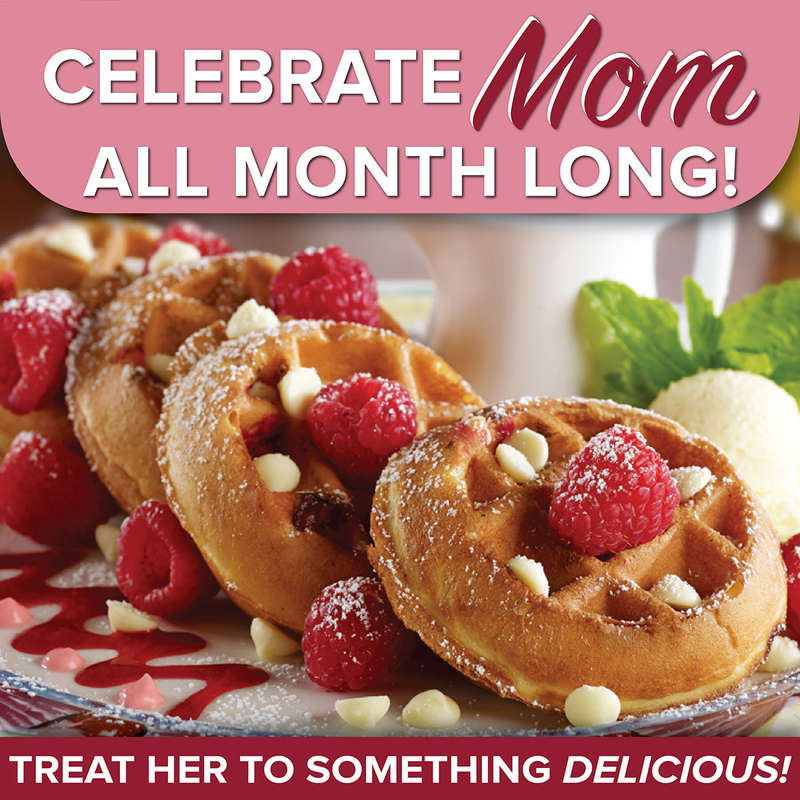 Celebrate Mom all month long and treat her to a delicious Breakfast, Brunch, or Lunch at Miss Shirley’s this May! "View Entire Post" for some fun Mother's Day suggestions at Shirley's! Miss Shirley's Joins the One Love Movement! 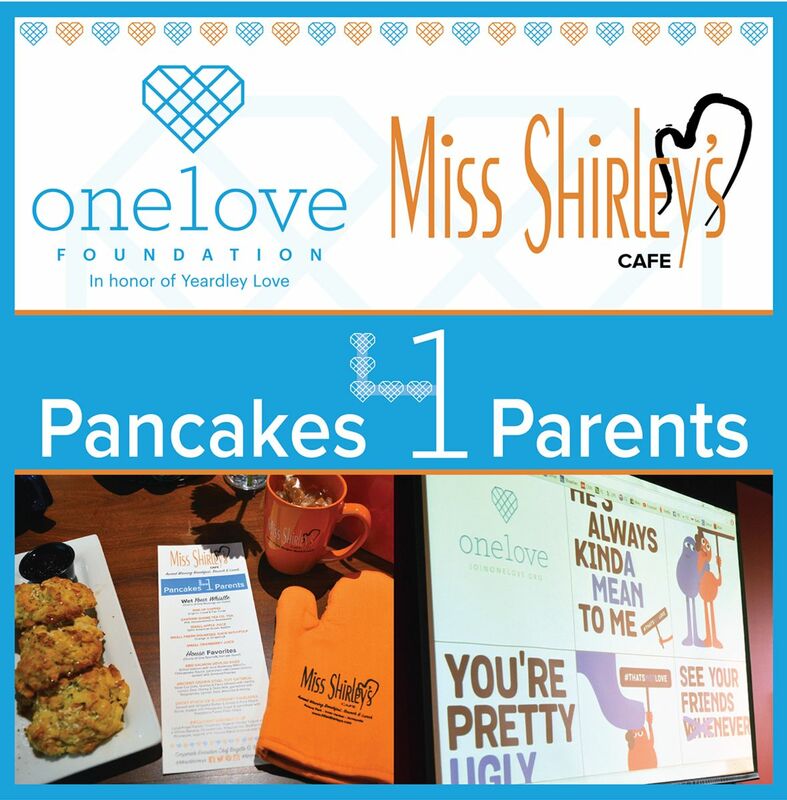 As our 10th Anniversary Year comes to a close, Miss Shirley’s Cafe is proud to support the One Love Foundation, in the final leg of our “10 Months of Shirley’s Giving” Charitable Campaign, which began in May of 2015. "View Entire Post" to learn more about how Miss Shirley's supports One Love. All Miss Shirley's Cafe locations are offering NEW Pancake, French Toast & Omelet specials, available at all locations beginning May 1st! "View Entire Post" to check out all of our new selections! Spring sunshine has finally shed it’s light, and with warmer weather comes Miss Shirley’s NEW Spring Menu, which debuted at all locations on April 13th! This Spring, Corporate Executive Chef Brigitte Bledsoe and her culinary team have kicked it up a notch with some savory & sweet starters that are sure to Wake Up Your Taste Buds! 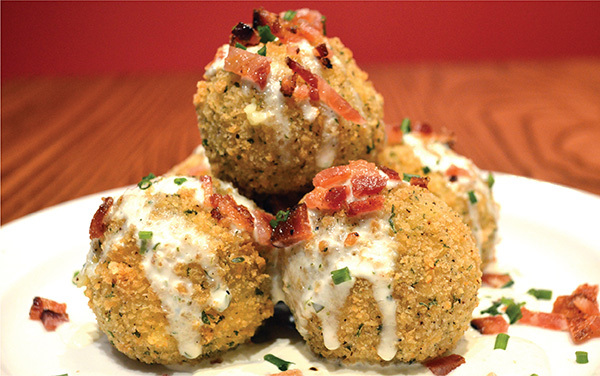 Spice things up with a few of Doppy’s Deviled Doppers. This hot new starter consists of 3 Roasted Jalapeños stuffed with Deviled Egg Mix, encrusted with seasoned panko breading and fried, garnished with an Avocado Lime Cream. "View Entire Post" to read about all of our Spring Selections! 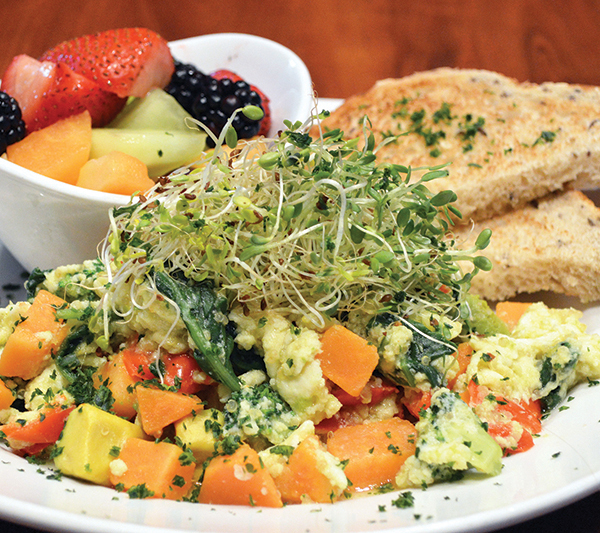 Miss Shirley’s Cafe strives to be a footprint-conscious company. We pride ourselves on being able to use eco-friendly, local, organic & family owned brands and products whenever possible, and we feel that our guests should know why we use them! 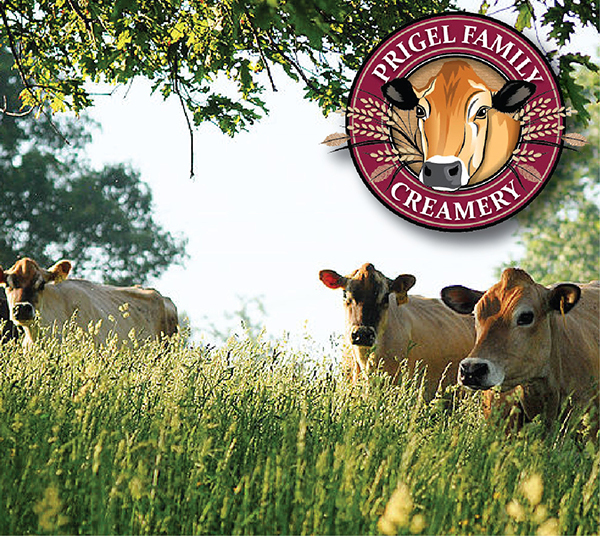 This Spring, Miss Shirley’s is excited to bring a new local brand on the menu, with the addition of Organic Chocolate Milk, Honey Yogurt & Cinnamon Ice Cream from Prigel Family Creamery! "View Entire Post" to read more about our Local Products! NEW Spring Menu Coming April 13th! Just when we thought the weather anchor would be telling us to keep our shovels on standby until May, Spring sunshine has finally shed its light. And with warmer weather comes Miss Shirley’s NEW Spring Menu! Coming April 13th, all Miss Shirley’s Cafe locations will be trading out our signature cold-weather dishes for all-new seasonal selections that are sure to get your mouth watering! "View Entire Post" for a sneak peak on some of our new Spring Selections! Happy Spring! This April, all 3 Miss Shirley's Cafe locations are featuring a variety Sweet & Savory dishes that are sure to get your mouth watering! "View Entire Post" for Full Names & Descriptions of our delicious new selections. Light City Rainbow Pancakes Available NOW! 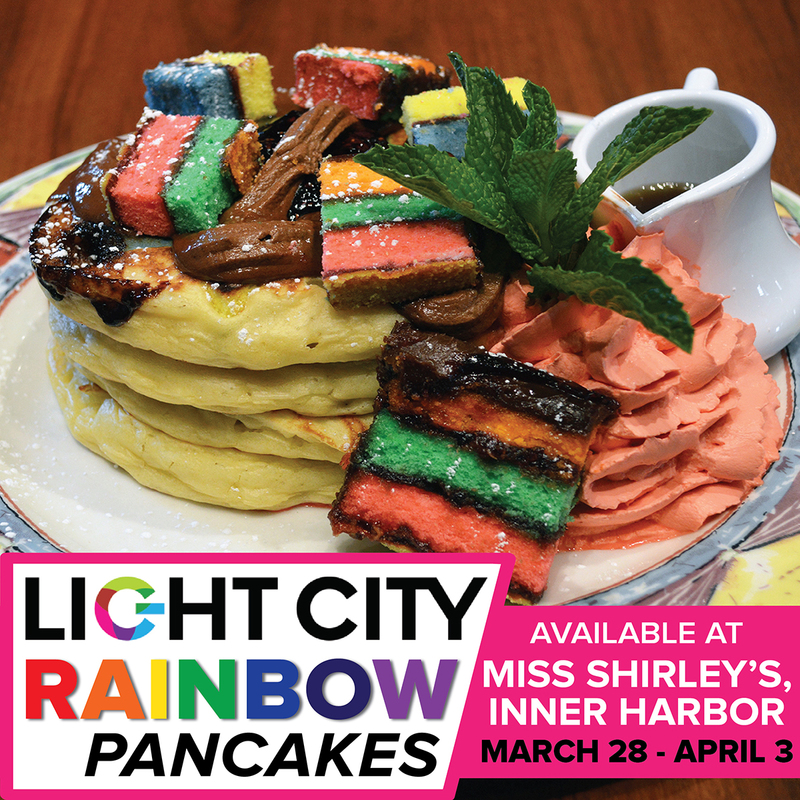 In celebration of LIGHT CITY BALTIMORE, Miss Shirley’s Inner Harbor location is featuring specialty Rainbow Pancakes for one week only, available until April 3rd! "View Entire Post" for full description and more information! Happy March! This month, we're offering Specialty Selections inspired by Fun Spring Holidays! 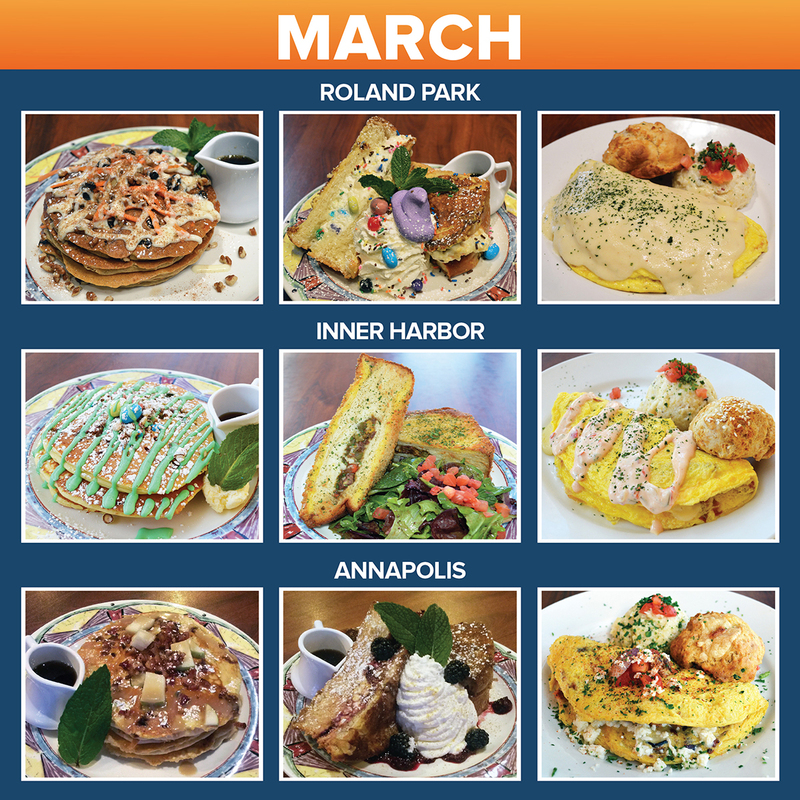 All locations will also be offering Maryland March Madness Pancakes throughout the month of March! "View Entire Post" for Full Names & Descriptions of our NEW March Specials! Make this Easter Celebration an EGG-CELLENT one! Make this Easter an EGG-CELLENT one & share a comforting Breakfast, Brunch or Lunch with family and friends at Miss Shirley’s! 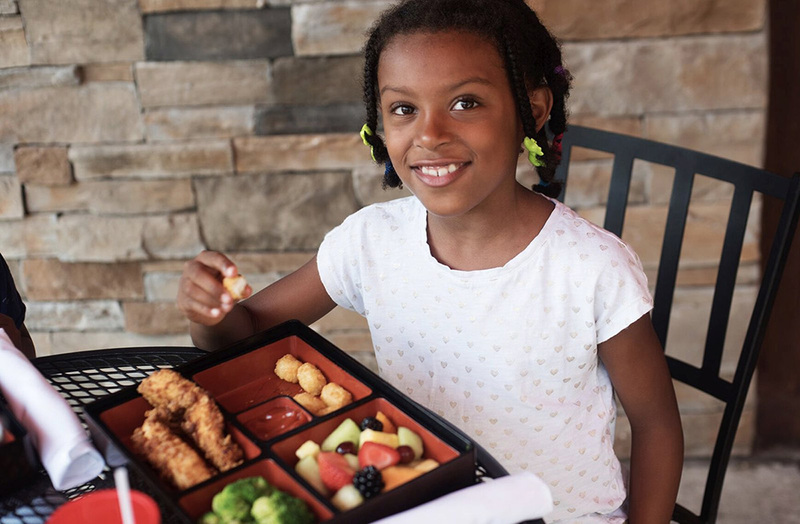 With our delicious array of House Specialties, Three Egg Omelets, Cakes on the Griddle, and Lunch Combos, there is bound to be something the whole family will love – including the kids! In fact, Miss Shirley’s Cafe was recently voted “Best Family Friendly Restaurant” in Baltimore Magazine’s 2016 Best Restaurants Readers’ Poll! Miss Shirley's Cafe in Annapolis is happy to once again be participating in Annapolis Restaurant Week! Monday February 22nd through Friday February 26th only, Miss Shirley’s Annapolis location will be offering a Two-Course Breakfast Menu for $12.95, as well as a Two-Course Lunch Menu for $15.95. 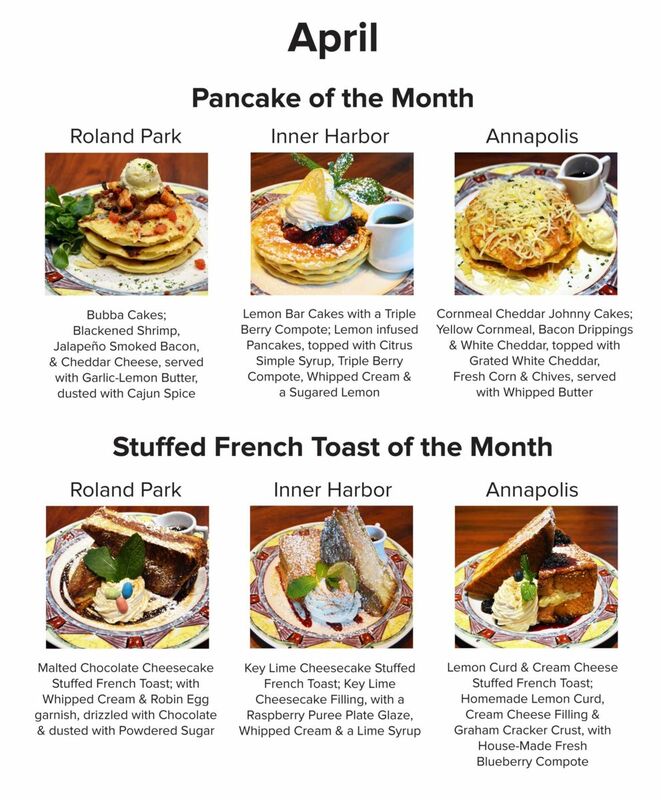 "View Entire Post" to see our full Annapolis Restaurant Week menus! Registered Loyalty Members Enjoy 16% OFF Next Visit! In celebration of a New Year, we’ve gifted all of our Registered Brunch Club Loyalty Members with a NEW Exclusive Reward! Receive 16% OFF your next visit when you use your Loyalty Card! This exclusive reward will Expire on 3/3/16 and can only be redeemed ONCE. Celebrate Valentine's Day all month! 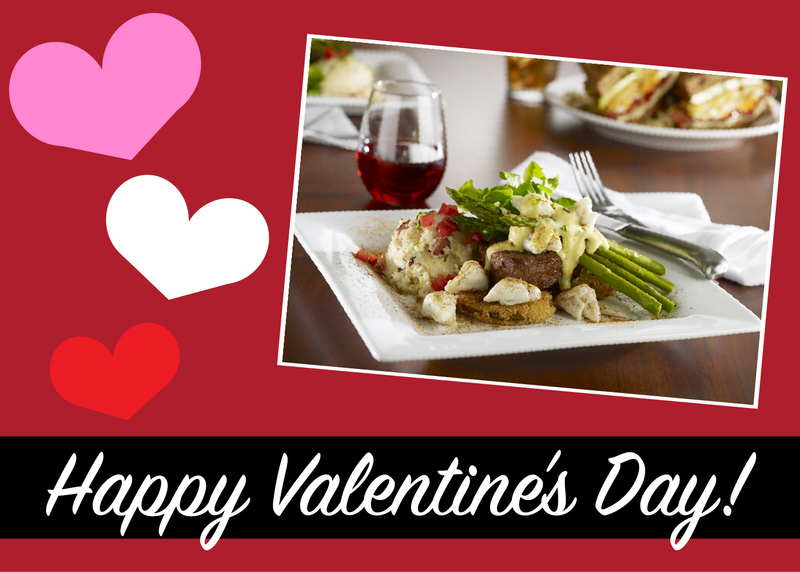 Why let dinner have all the fun this Valentine's Day? Make this holiday special for your sweetheart, friends or family all month long, with a Valentine's Breakfast, Brunch or Lunch at Miss Shirley's! Indulge in a sweet treat with your sweetie, like our Coconut Cream Stuffed French Toast, as seen on Food Network's Diner's Drive-Ins & Dives, or Specialty Red Velvet Pancakes, available at all locations this month! Eat more "CAKES" on Leap Day! Leap Day means an extra day to eat "Cakes" this year! Are YOU a Leap Year Baby? We're saying "Happy Birthday" with FREE "CAKES" for anyone born on February 29th. 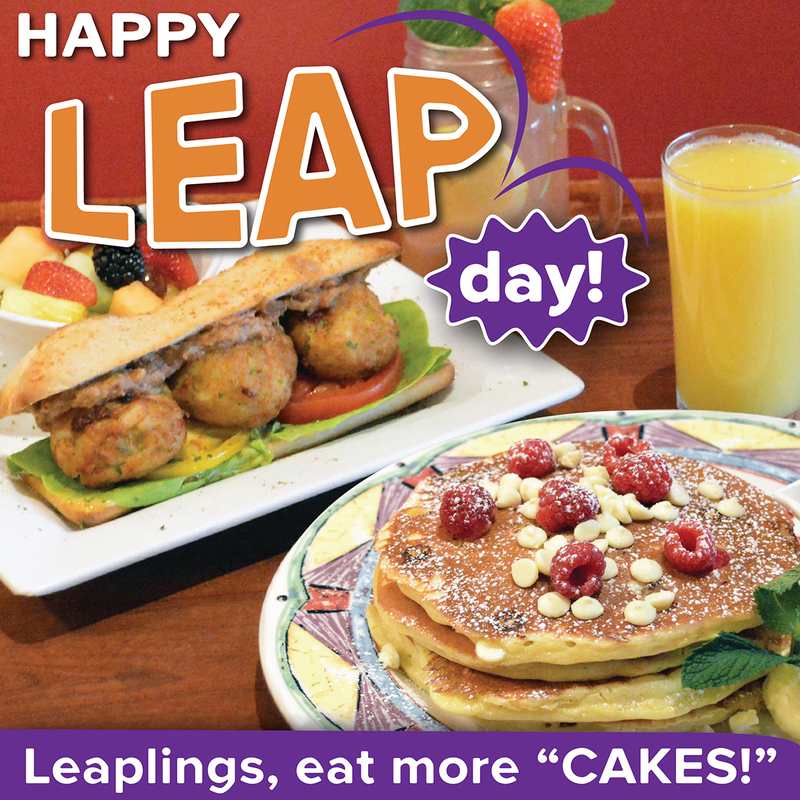 You and one guest will share a FREE Crab CAKE Po' Boy & Tall Stack of Specialty PanCAKES when you visit any of our restaurant locations on Leap Day! "View Entire Post" for more information on our special Leap Day Promotion. Happy February - it's the month of Love! Seeing Triple? 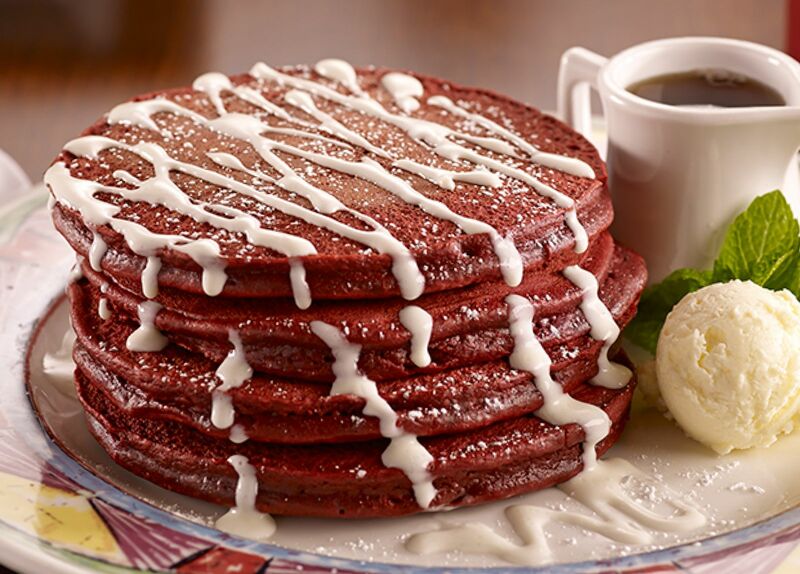 All locations will be offering Red Velvet Pancakes this month, in celebration of Valentine's Day! 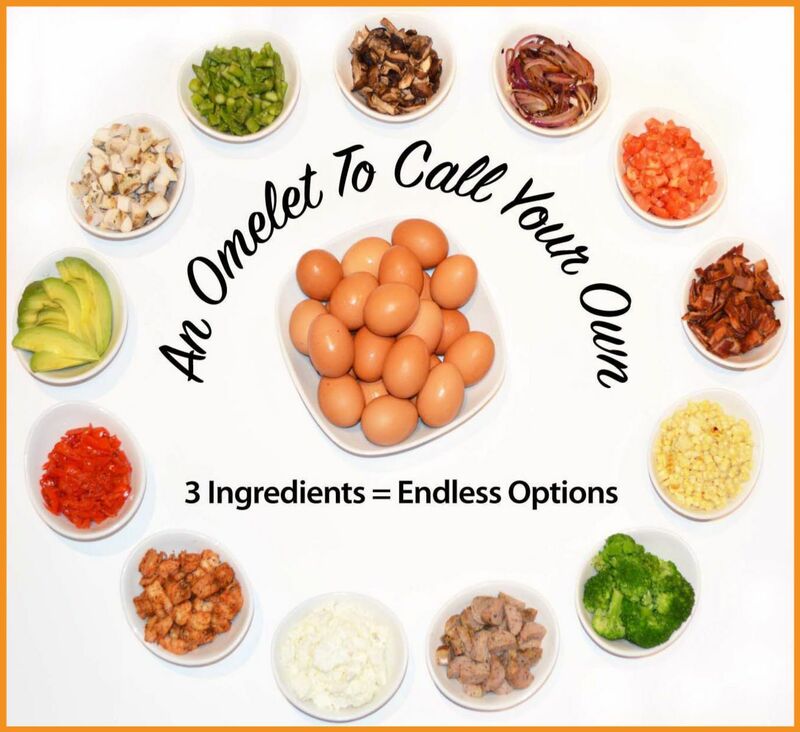 "View Entire Post" for Full Names & Descriptions of our NEW French Toasts & Omelets available at each location this February. 2016 Baltimore Winter Restaurant Week! 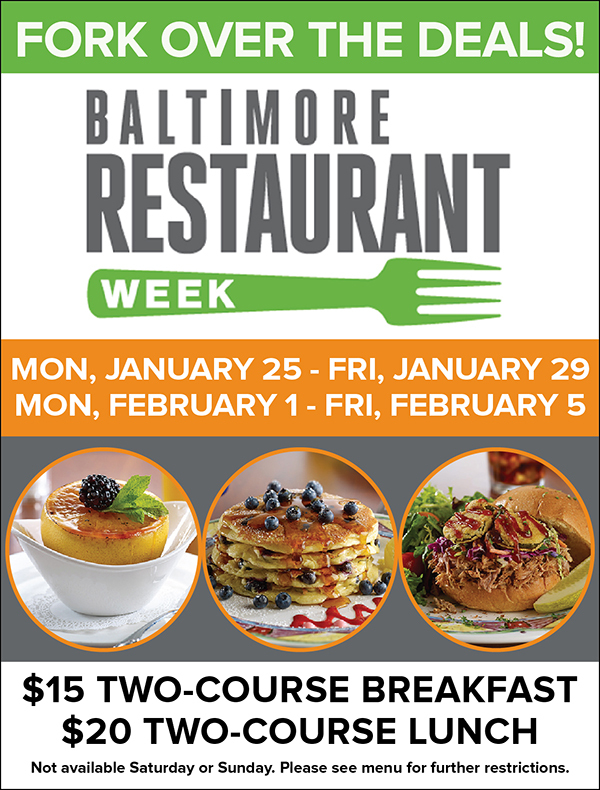 Miss Shirley's Roland Park & Inner Harbor locations are excited to once again be participating in Baltimore Winter Restaurant Week! 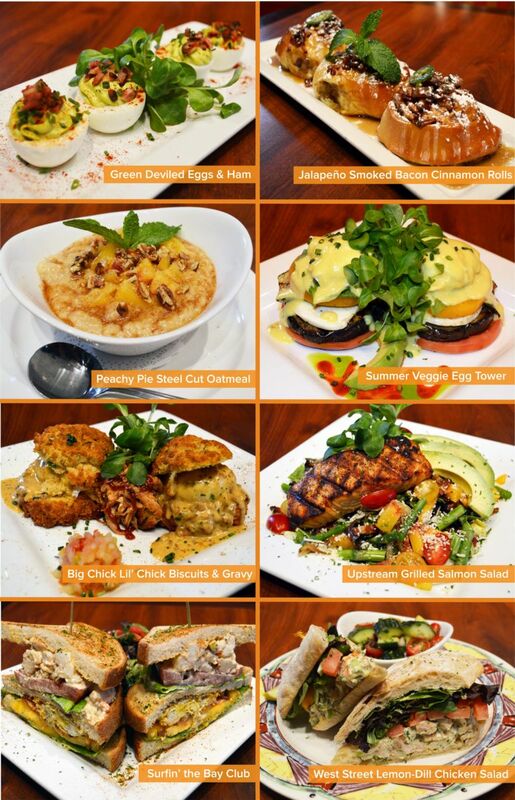 The menu features a variety of our signature and seasonal dishes, including our Fried Green Tomatoes, Buffalo Shrimp Deviled Eggs, Broiled Grapefruit Brûlée, Chicken & Corn Chowder, Benne Seed Chicken ‘N Waffles, Tall Stack of Pancakes, Cold Spring Lane Hot Brown and more! "View Entire Post" to learn more and view our Restaurant Week Menu! 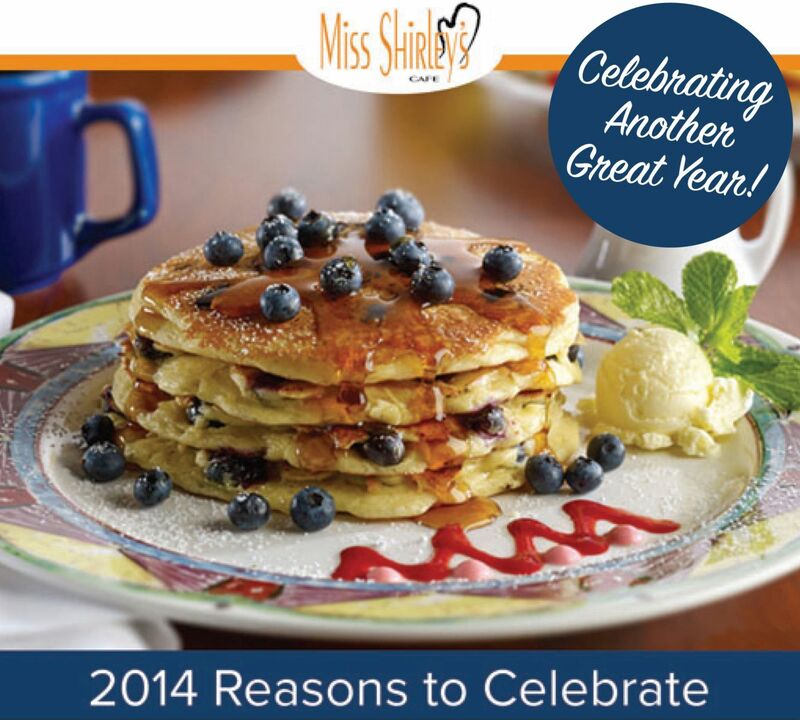 Ring in the New Year with Miss Shirley's NEW Specialty Pancake, French Toast & Omelets! 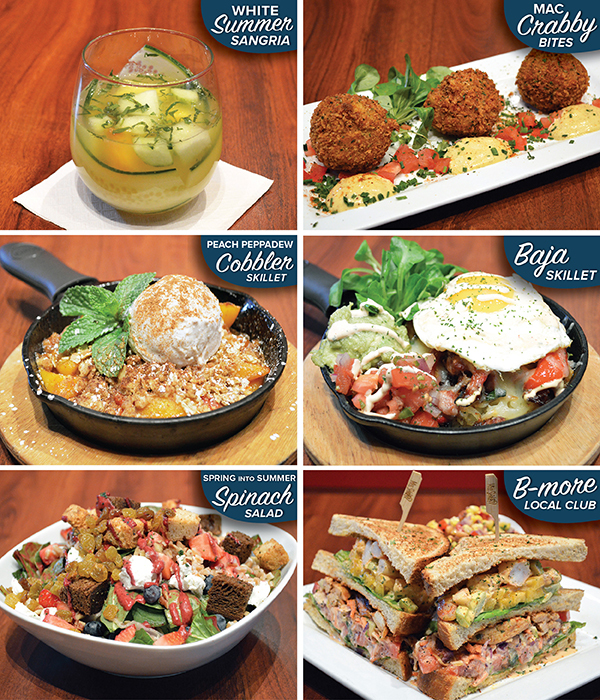 This month, we're dishing up a delicious array of Savory & Sweet selections that are sure to make your mouth water! "View Entire Post" to see Full Names & Descriptions of our January Specials. 2015 Year in Review - Celebrating 10 Years! Before we embark on new adventures in 2016, we pause and take a moment to reflect on all of the rewarding experiences we have had in the past year. It certainly has been an amazing, and memorable 10th Anniversary Year! 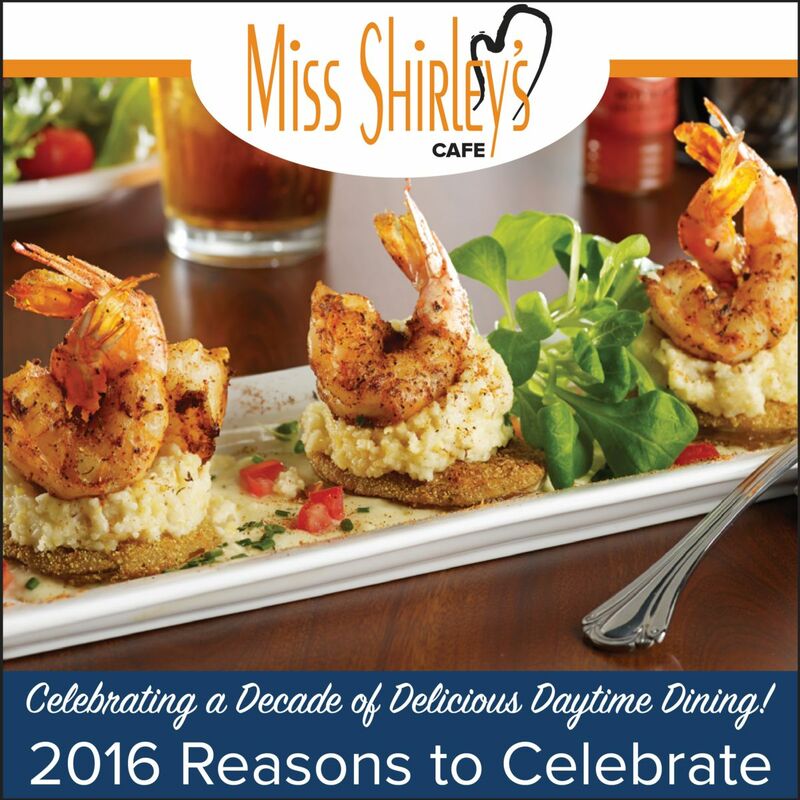 Looking back, we wanted to highlight some of our favorite Miss Shirley’s moments of 2015, because above all, we have YOU, our wonderful guests, to thank for another incredible year. "View Entire Post" to check out our Year in Review Timeline! "View Entire Post" to check out all of the Seasonal Selections we are offering this month! #ShirleysGiving to Kennedy Krieger Institute's Festival of Trees! Miss Shirley's Cafe is celebrating the 10 Year Anniversary of our original location in Roland Park, which is why we are #ShirleysGiving back to the community that has supported us for the last decade! 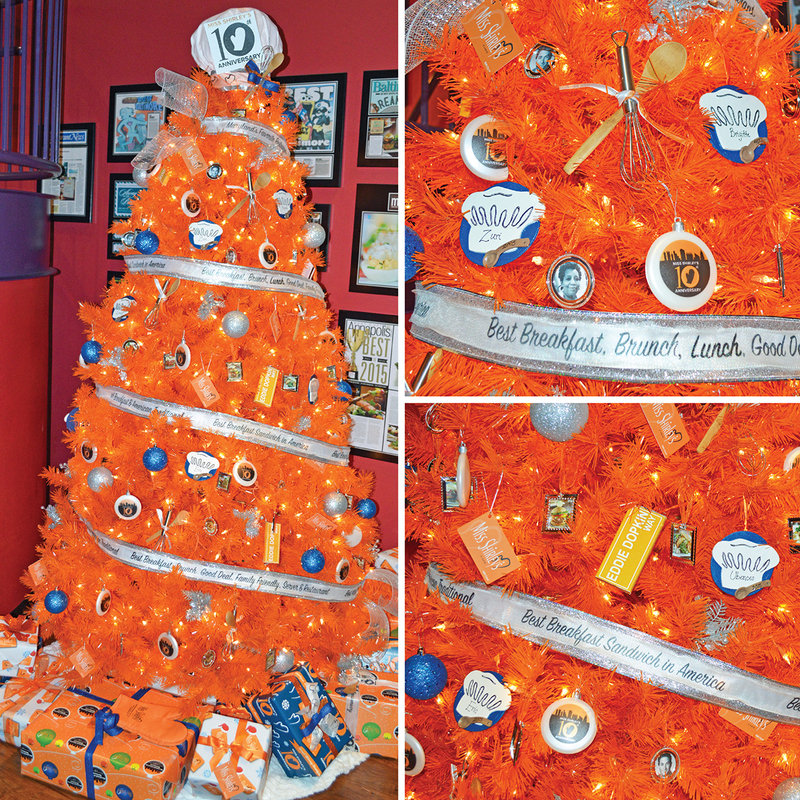 As part of our "10 Months of Shirley's Giving" Charitable Campaign, for the Holiday Season, Miss Shirley's sponsored, designed & purchased a 7.5' 10 Year Anniversary-Inspired Tree, which was displayed at Kennedy Krieger Institute's Festival of Trees from November 27-29th. "View Entire Post" to read more about the Festival! Can you believe it's November already? We sure can't! Miss Shirley's is celebrating the start of the Holiday Season with special Thanksgiving Inspired Pancakes, French Toasts & Omelets this month! "View Entire Post" to see Full Names & Descriptions of our specials this month. Don't miss the LAST MONTH of a Delicious Partnership! 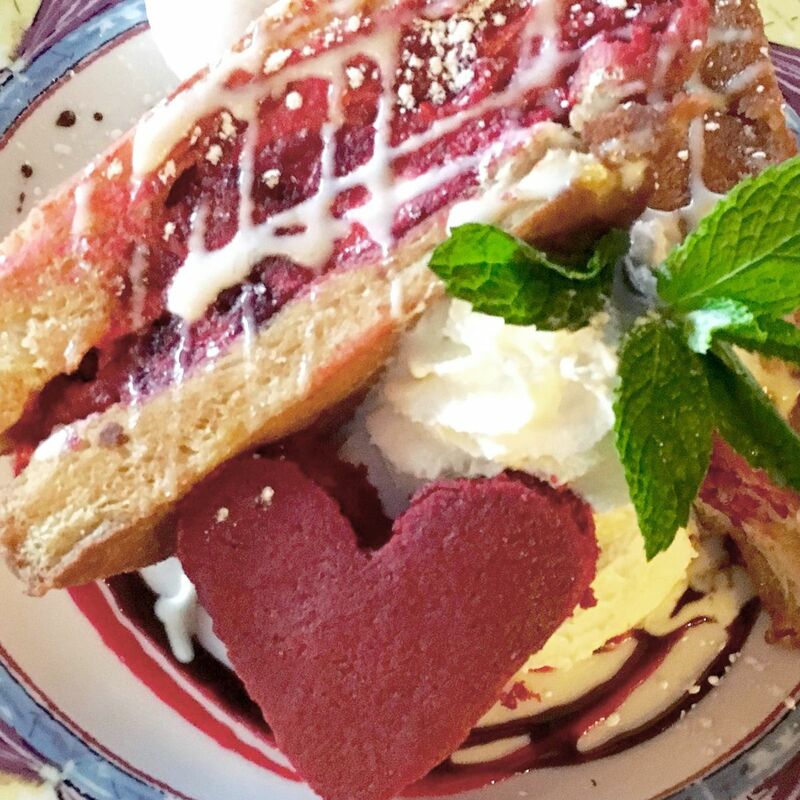 Miss Shirley’s Cafe has loved partnering with local Ice Cream Shop, The Charmery, to create some seriously yummy Ice Cream Waffle Sandwiches over the last few months. This October, you won’t want to miss the LAST Ice Cream Waffle Sandwich of this delicious partnership! Available at all Miss Shirley’s Cafe locations this month is a Fall-Inspired Apple Cider Doughnut Dessert! Book your Private Holiday Events! With cool weather holidays on the horizon, now is the time to start planning your upcoming special occasion celebrations. 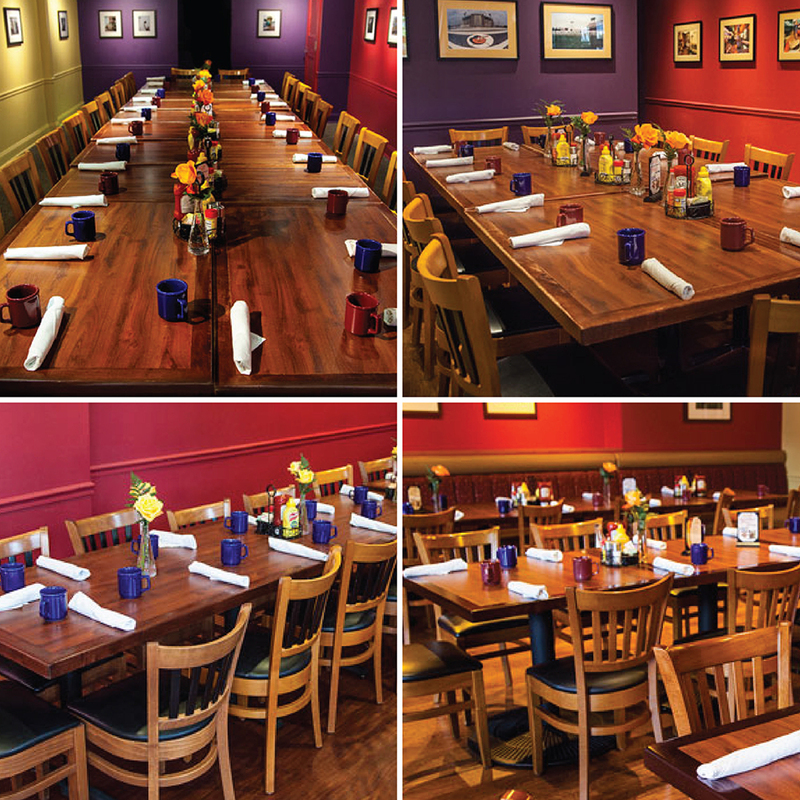 Celebrate the season with your Clients, Colleagues, Team Members, Family or Friends at Maryland’s Favorite Restaurant with a Private Weekday Breakfast, Brunch or Lunch! Reserve a Semi-Private or Private Dining Area for your group of 11 or more at any Miss Shirley’s Cafe location, Monday - Friday, excluding holidays, from 7 a.m. – 3 p.m.
#ShirleysGiving to The Maryland Zoo! Miss Shirley’s Cafe is humbled and honored to be celebrating the 10 Year Anniversary of the cafe’s original location in Baltimore City’s Roland Park neighborhood! That is why, from May 2015 - February 2016, Miss Shirley’s is #ShirleysGiving to one local charitable organization each month, in an effort to give back to the community who has supported them for the last decade. 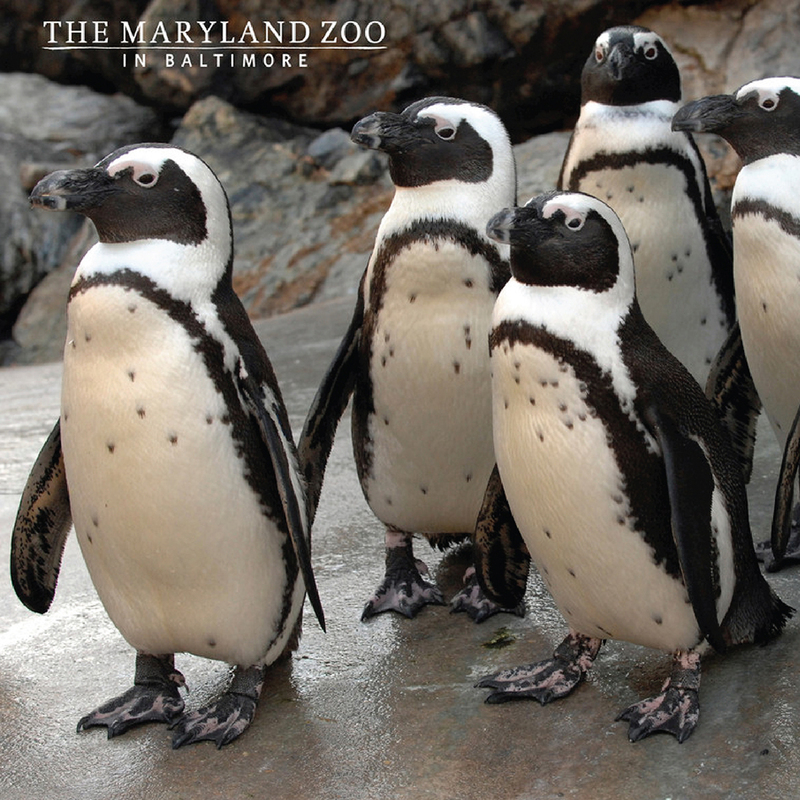 As a Corporate Member, Miss Shirley’s is happy to be partnering with The Maryland Zoo in Baltimore this month, by adopting 10 African Penguins and becoming a corporate member! Cozy Up to a NEW Fall Inspired Dessert! With Summer weather cooling down and Autumn on its way, Miss Shirley's took inspiration from a Favorite Fall Cookie for the restaurant's NEW featured dessert. This September, guests can cozy up to a delicious Oatmeal Raisin Ice Cream Waffle Sandwich at any Miss Shirley's Cafe location! "View Entire Post" to read more about this new dessert! 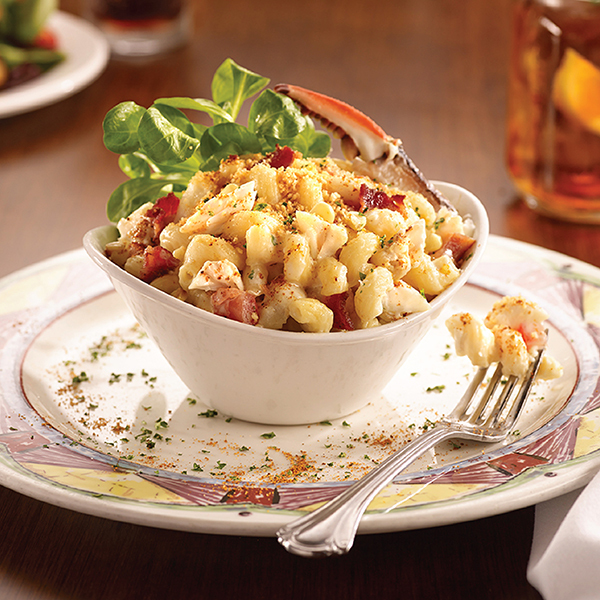 Ready for cooler weather & cozy comfort food? 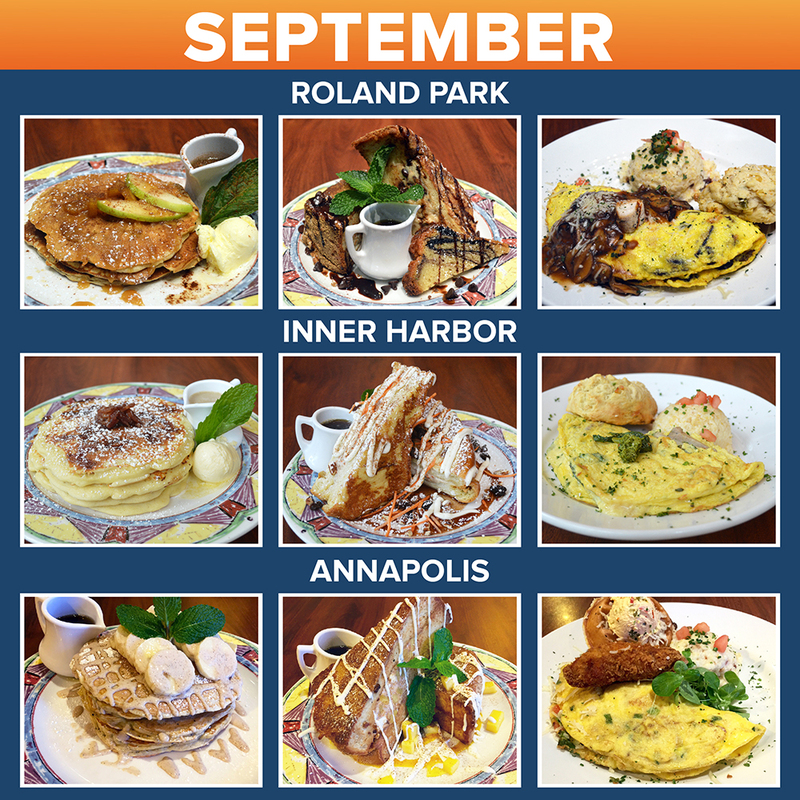 This September, Miss Shirley’s is easing into Autumn with all-new Pancake, French Toast & Omelet selections inspired by Fall Flavors & Classic Dishes! "View Entire Post" for full descriptions of our September Selections. NEW Fall Menu Coming September 23rd! 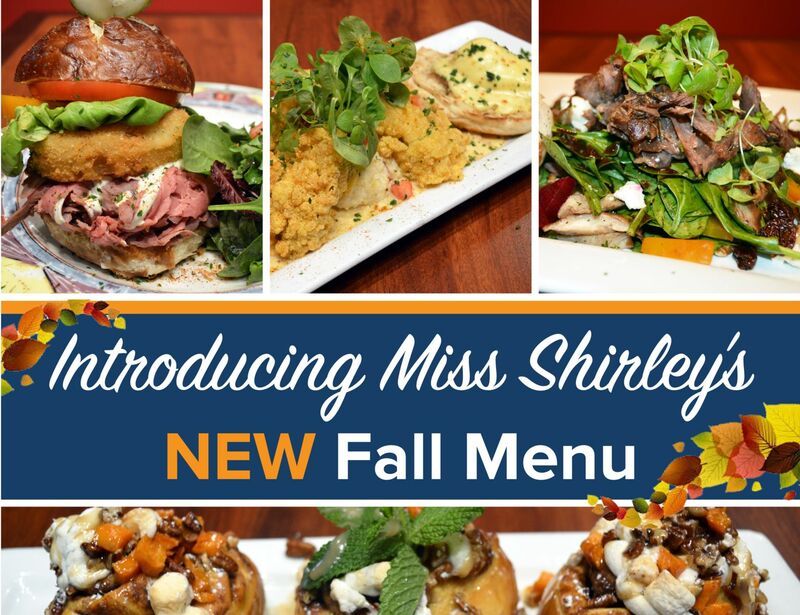 The first day of Autumn is Wednesday, September 23, and you know what that means – the debut of Miss Shirley’s NEW Fall Menu! If you’re a seafood lover, get excited for the reappearance of Oysters to the menu in a new Benedict, as well as the return of the Mac Crabby with Jumbo Lump Crab Meat with a Five Cheese Blend, Tomatoes, Jalapeno-Smoked Bacon and Roasted Corn. In celebration of Miss Shirley’s 10 Year Anniversary, we’re also bringing back a few more of our favorite Original Menu Items this season. 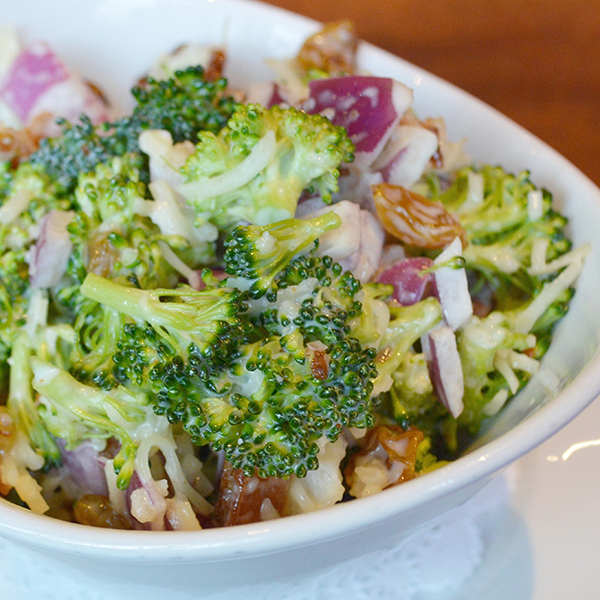 Broccoli Salad has been a Southern potluck and party favorite for decades, which is why we thought it would be the perfect addition to Miss Shirley’s Fall Menu! Can’t wait to try out this Fresh New Side Dish? You’re in luck! Corporate Executive Chef Brigitte Bledsoe is giving you her Southern Recipe, and just in time for your Labor Day cookout! In an effort to show appreciation to loyal guests, supporters, and give back to the local community, Miss Shirley’s Cafe is excited to announce its “10 Months of Shirley’s Giving” partnership with Sponsor-A-Highway. As part of this Charitable Campaign, Miss Shirley’s Cafe has teamed up again with Sponsor-A-Highway, to support their efforts in keeping our roadways and highways litter free. Miss Shirley’s added additional Road Signs in Roland Park, as well as in downtown Baltimore and Annapolis, to strengthen their commitment to the neighborhood, and to thank the community that has supported them for the last decade. "View Entire Post" to learn more about our partnership with Sponsor-A-Highway. Beat the Heat with a Refreshing & Sweet Frozen Treat! There is nothing more refreshing on a hot & humid Summer day than a tall glass of Sweet Tea, right? Wrong! This month, Miss Shirley's Cafe is offering a Refreshing & Sweet Frozen Treat that is sure to Beat the Heat this Summer - a NEW Sweet Tea Lemon Mint Ice Cream Waffle Sandwich! "View Entire Post" to read more about our new dessert! This August, Miss Shirley's Cafe is offering all-new Pancake, French Toast & Omelet selections that are sure to satisfy both your Sweet & Savory cravings! 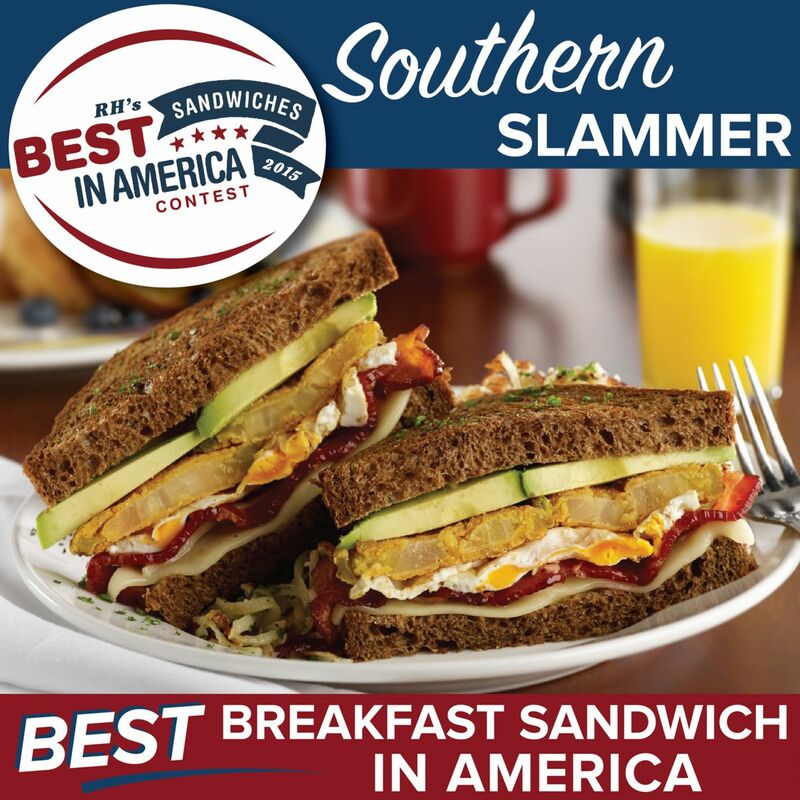 "View Entire Post" to learn more about our Award Winning Sandwich! Enjoy Delicious Daytime Dining Al Fresco this Summer! With warmer weather rolling in, who couldn’t use a little fun in the sun to brighten their day? 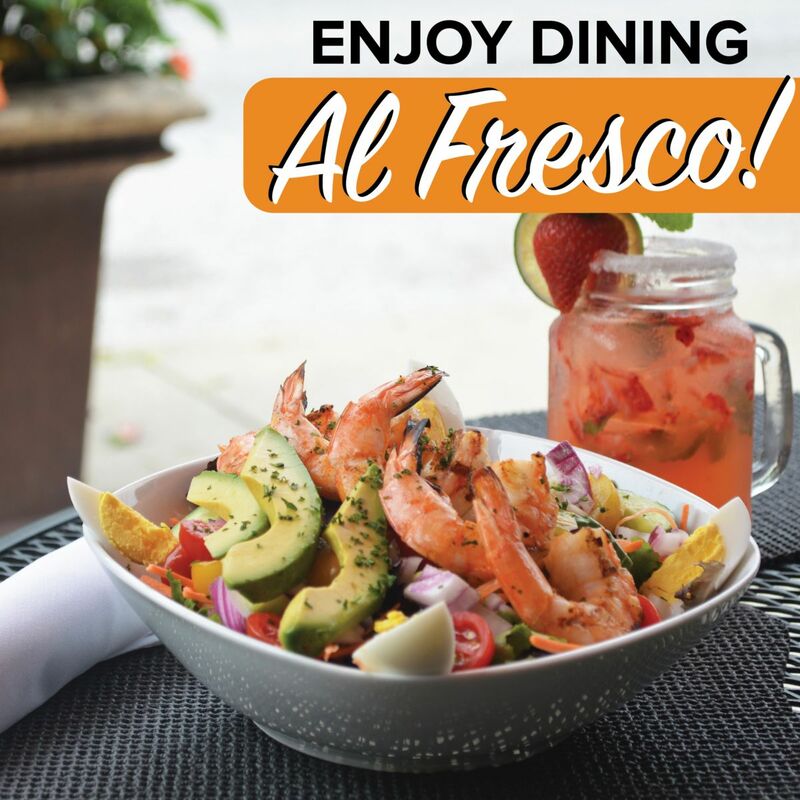 Step out of the office or house for a little Al Fresco Dining at any of our three locations this season. 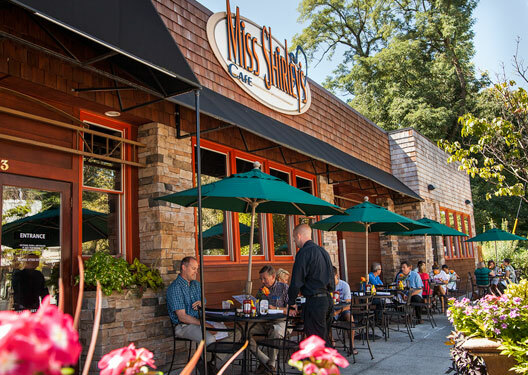 "View Entire Post" to read more about patio dining at Miss Shirley's! 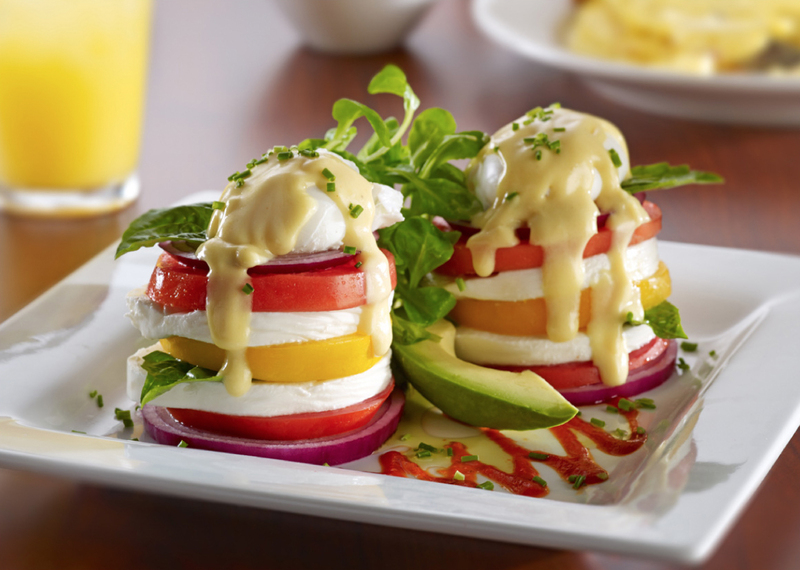 Introducing a Unique Twist on a Spirited Brunch Favorite! 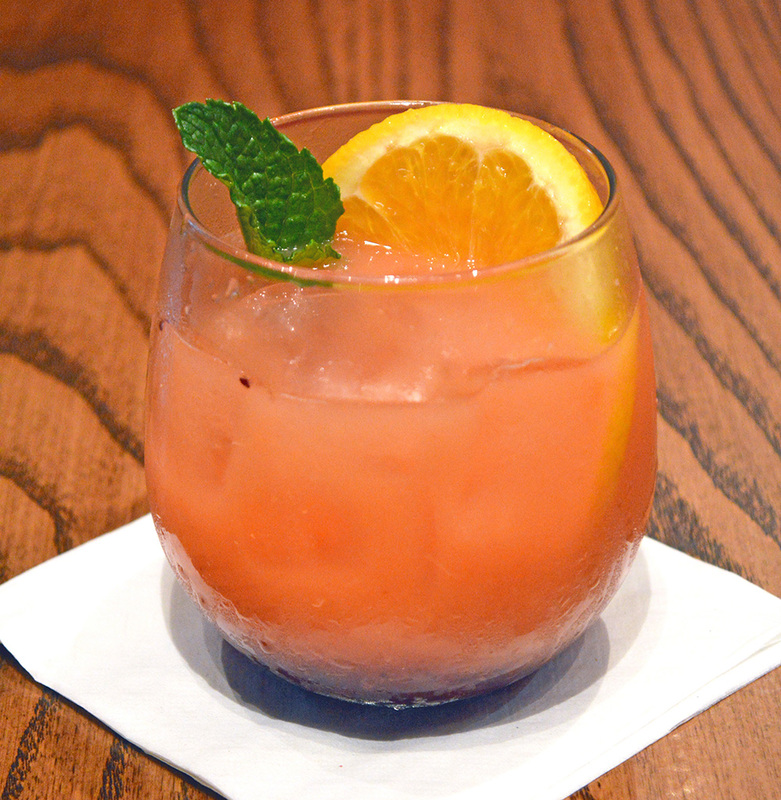 Belly up to a unique twist on one of Miss Shirley’s most-loved Spirited Beverages - the Spicy Shirley! 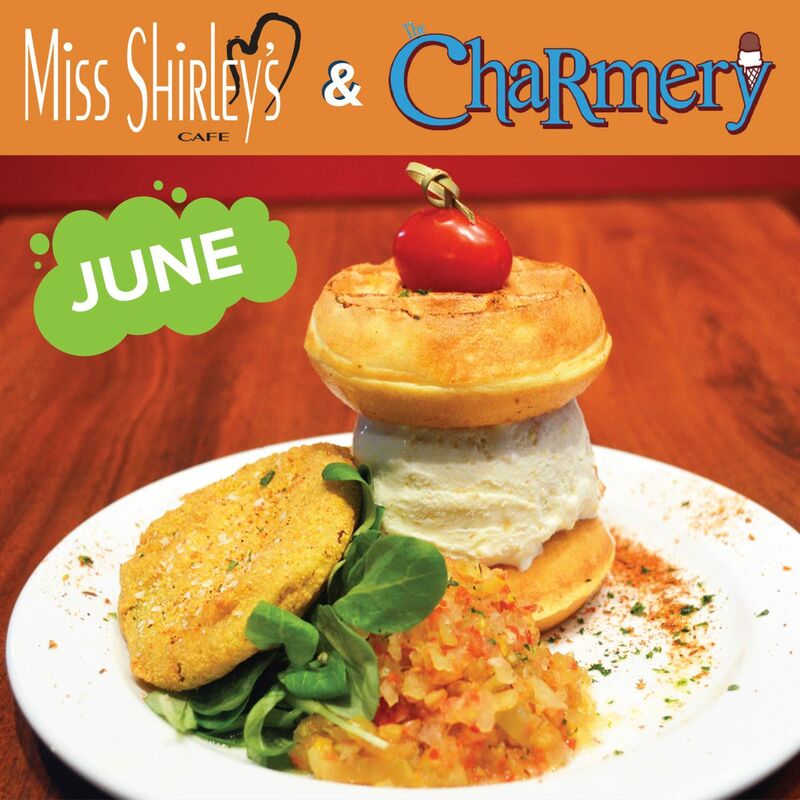 This July, in partnership with The Charmery, Miss Shirley's Cafe is offering a Sweet & Spicy Dessert that is sure to spike your tastebuds. "View Entire Post" to read more about our NEW Ice Cream Waffle Sandwich! This July, Miss Shirley's Cafe is offering all-new Pancake, French Toast & Omelet selections that are "Ooh" and "Ahh" worthy for Independence Day! 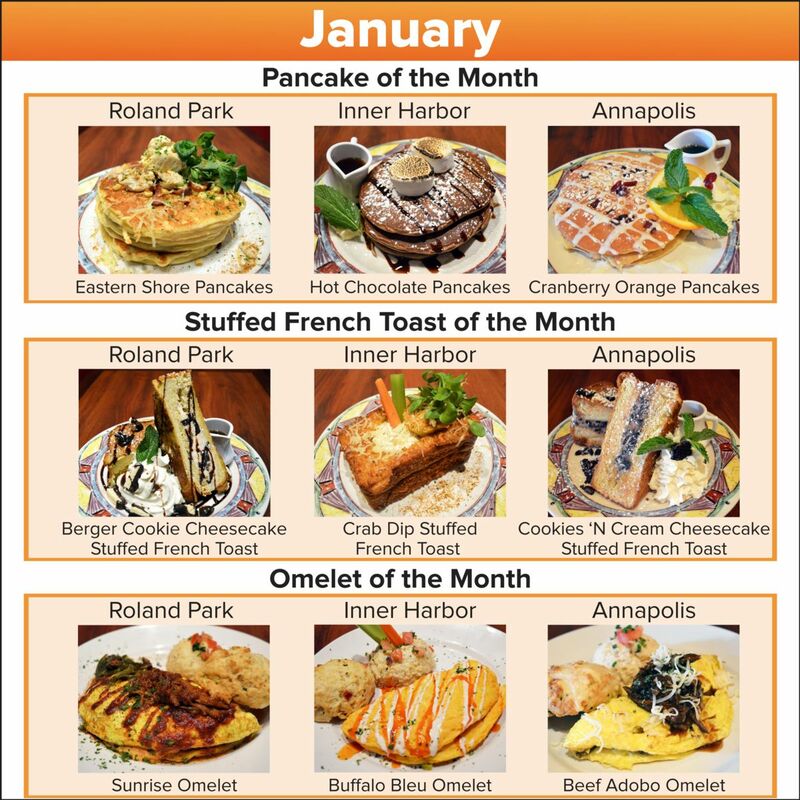 "View Entire Post" to read about all of our new Pancake, French Toast & Omelet of the Months! Are YOU Backyard BBQ Ready? With Summer Holidays on their way, we've got the perfect Side Dish for your next Family Cookout! 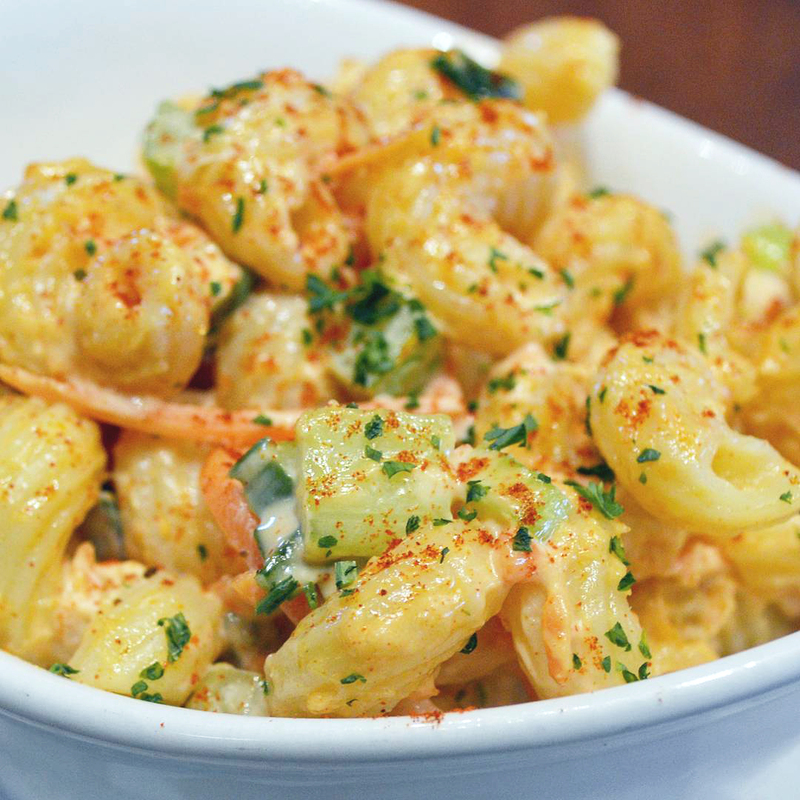 "View Entire Post" to get the Recipe for our Smokin' Summer Macaroni Salad! Miss Shirley's Cafe Supports Teach for America as part of "10 Months of Shirley's Giving"
In an effort to show appreciation to loyal guests, supporters, and the local community, Miss Shirley’s Cafe was excited to kick off “10 Months of Shirley’s Giving” campaign in May. 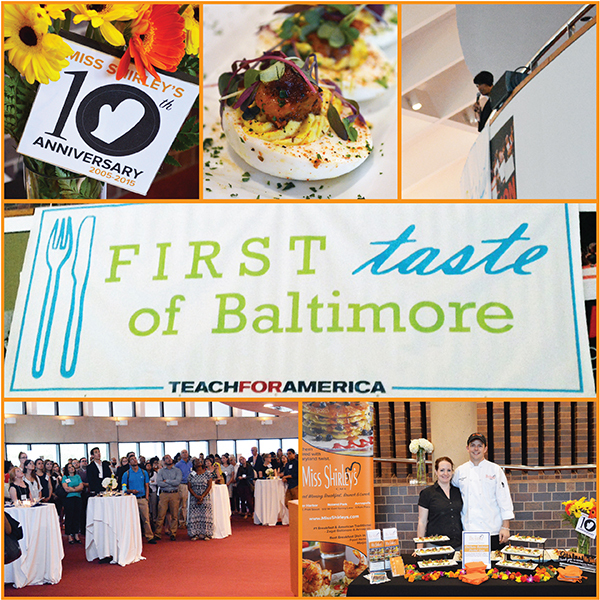 As part of this Charitable Campaign, for the month of June, Miss Shirley’s partnered with Teach For America to support their annual “First Taste of Baltimore” on Wednesday, June 17, 2015. "View Entire Post" to read more about the event! 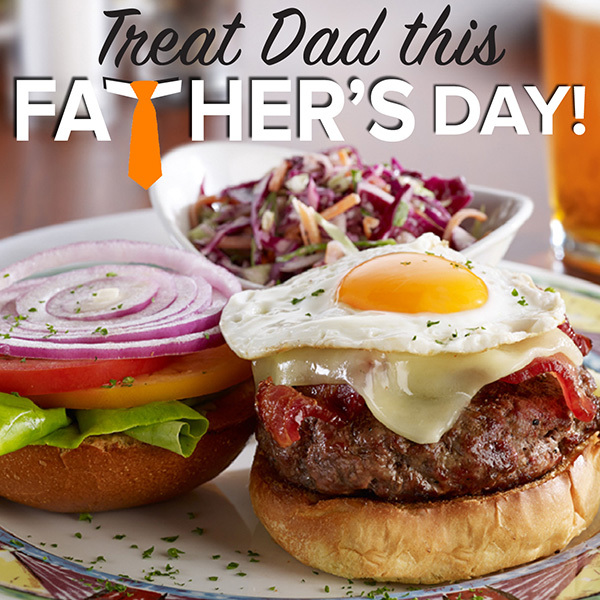 Treat Dad to Maryland's Favorite Restaurant! This Father’s Day, put down the phones and pick up a fork! There is no better way to connect and show you care than by sharing a meal together. 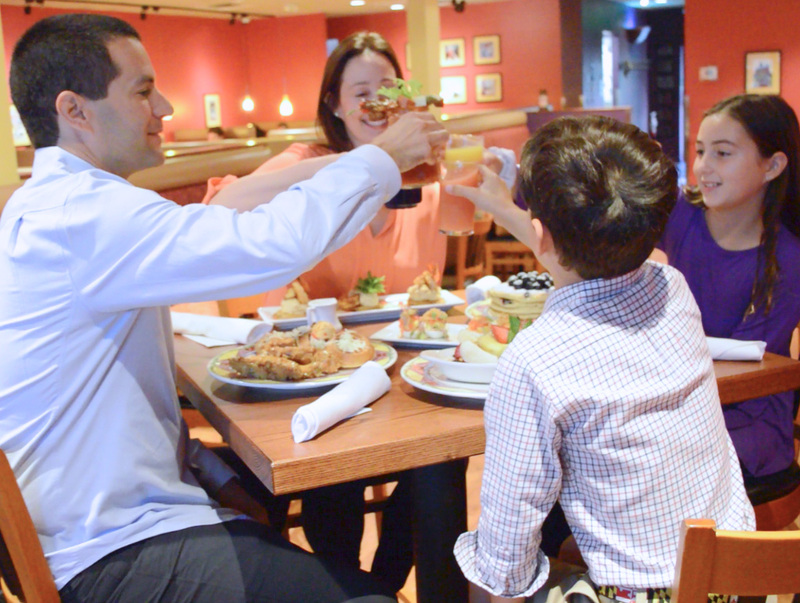 So this year, treat Dad to Maryland’s Favorite Restaurant for a family Breakfast, Brunch or Lunch! "View Entire Post" to read more about brunching for Father's Day! Introducing our NEW Fried Green Tomato Ice Cream Waffle Sandwich! Miss Shirley’s Cafe is excited to debut our newest Ice Cream Waffle Sandwich, in partnership with local Hampden Ice Cream Shop, The Charmery! Inspired by Miss Shirley's Signature Appetizer, The Charmery whipped up a unique and delicious Fried Green Tomato Ice Cream for a Savory Treat this month! "View Entire Post" to learn more. 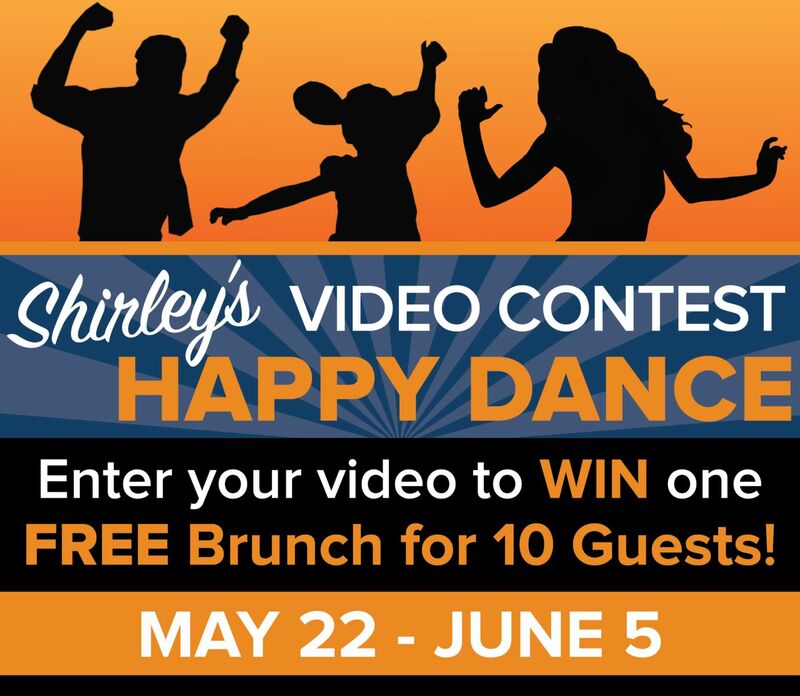 Enter Shirley's Happy Dance Video Contest! Miss Shirley’s Cafe is ecstatic that we have hit 20,000 likes on our Facebook page! 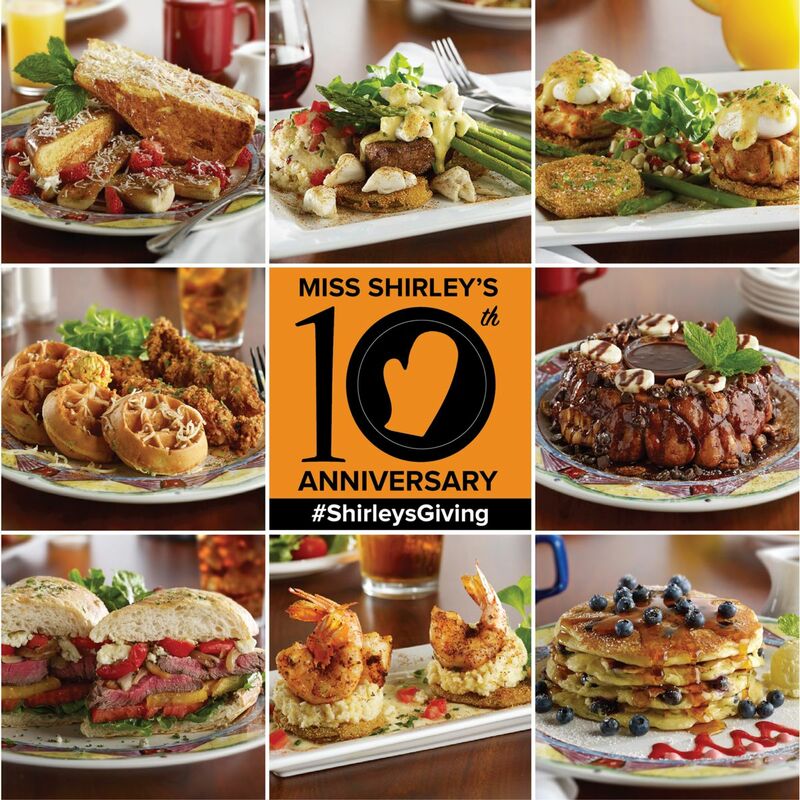 In celebration of Miss Shirley’s 10 Year Anniversary and 20,000 Facebook Fans, we are giving back some #ShirleysLove by providing Two Fans the chance to win a FREE Brunch for 10 Guests! From May 22 – June 5, Miss Shirley’s Cafe will be hosting a Shirley’s Happy Dance Video Contest on our Official Facebook Page. From a little jig to a shake or twirl, we want to see YOUR Foodie Happy Dance! Show us how excited you are to eat at Miss Shirley’s. "View Entiire Post" for Full Guidelines & Entry Details. Miss Shirley's Cafe Named Maryland's Favorite Restaurant! 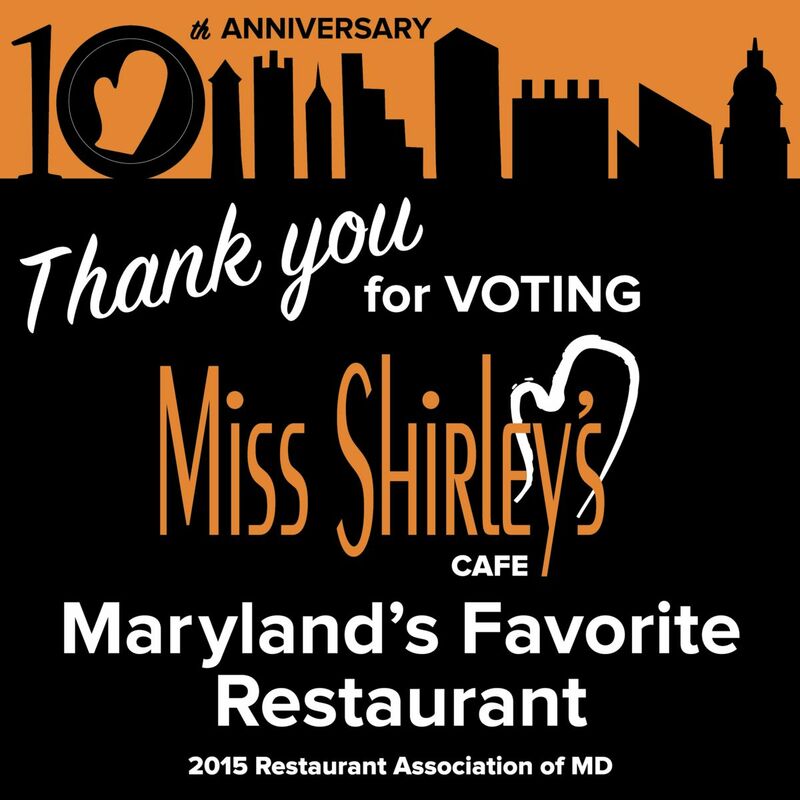 Over fifteen thousand Maryland diners voted for their favorite restaurants, and one thing was made clear...Miss Shirley's has the best fans in the world! Miss Shirley’s Cafe is excited to announce that we were recently named “Maryland’s Favorite Restaurant” at the Restaurant Association of Maryland’s Stars of the Industry Awards! "View Entire Post" to read more about the Stars of the Industry Awards Gala! 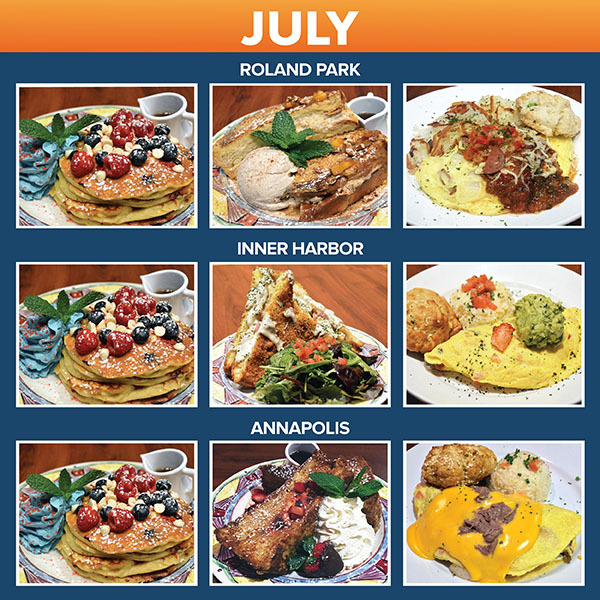 What started as a vision, of Founder Edward “Eddie” Dopkin 10 years ago, has since become a much-loved and respected landmark for Award Winning Breakfast, Brunch and Lunch in Maryland. In memory of Eddie, and to celebrate this milestone occasion for the restaurant he built, Miss Shirley's was honored to have a Ceremonial Street Sign installed by the City of Baltimore on Thursday, May 7th. "View Entire Post" to read more about our Ceremonial Street Sign Celebration! NEW Ice Cream Waffle Sandwiches Now Available! 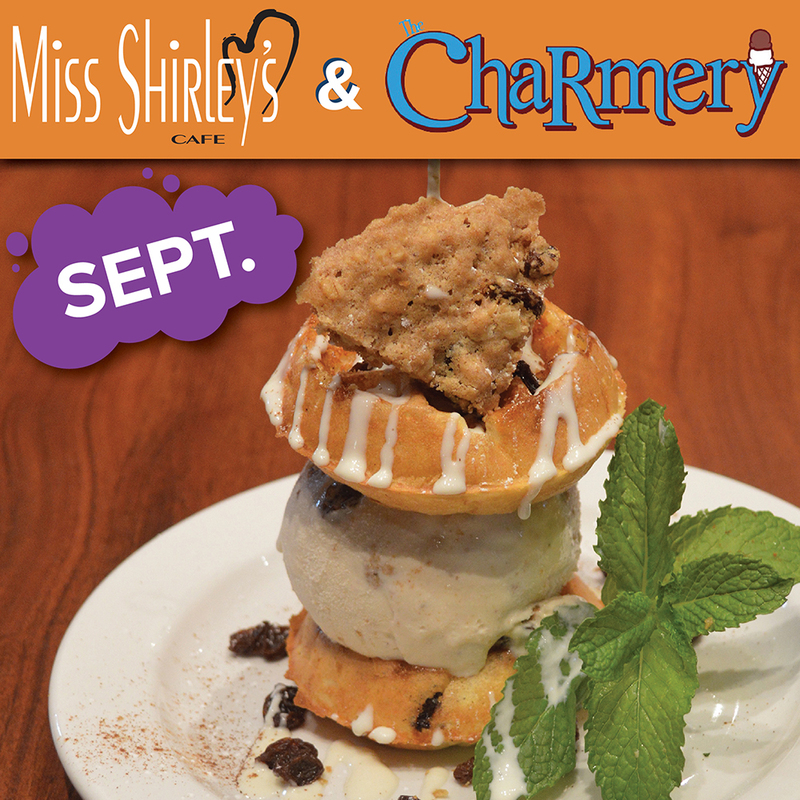 Miss Shirley’s Cafe has partnered with local Hampden Ice Cream Shop, The Charmery, to create a Sweet New Menu Item. "View Entire Post" to find out what delicious desserts we will be offering in the upcoming months! "View Entire Post" to read more about the history of Brunch! Thank you B'More - 10 Months of Shirley's Giving! We want to THANK YOU all for your continued support over the years, and give back some Shirley’s Love to 10 local Baltimore nonprofit organizations, throughout our anniversary year, starting in May and ending in February 2016. "View Entire Post" to learn more about "10 Months of Shirley's Giving!" This April, Corporate Executive Chef Brigitte Bledsoe and her culinary team are offering a wide variety of Fresh Spring Flavors, Creative New Dishes & Returning Past Favorites!? "View Entire Post" to view descriptions for all of our delicious April Monthly Specials. 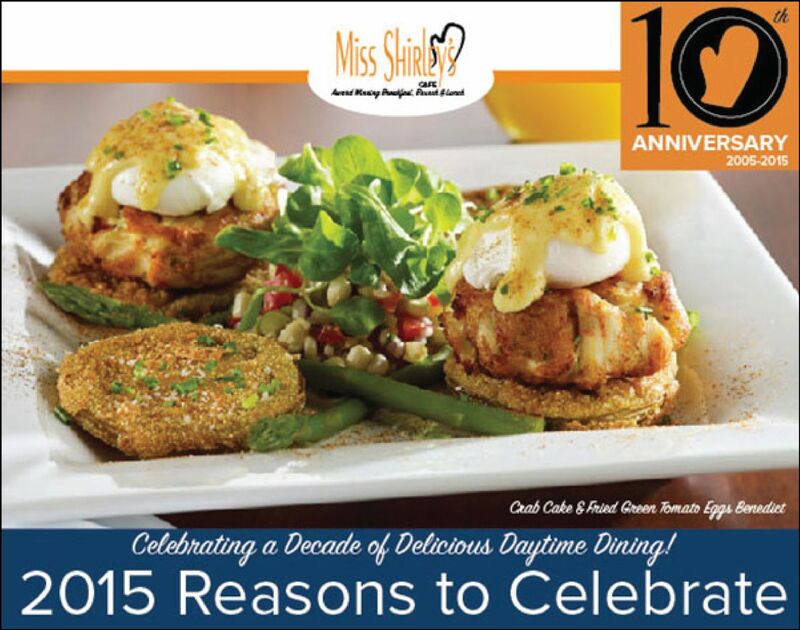 Miss Shirley's 2015 NEW Spring Menu! With warmer weather on the horizon, we are happy to leave the snow behind and replace our cold weather dishes for fresh flavors. 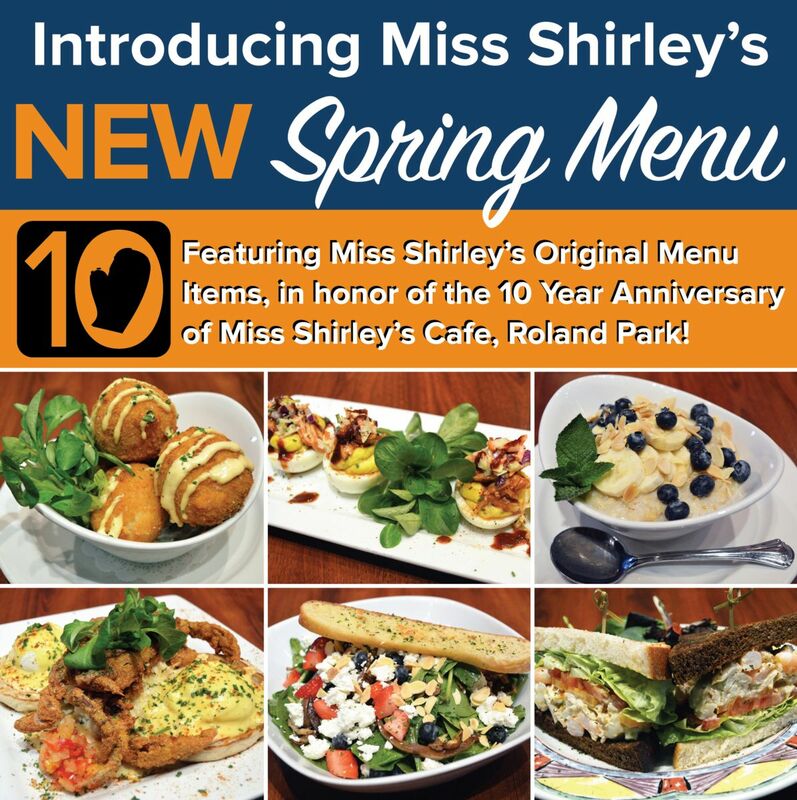 With the debut of our Spring Menu on Wednesday, March 18th, we will not only introduce new Spring & Summer dishes, but also bring back past favorites from Miss Shirley's original menu, in celebration of the 10 Year Anniversary of our original Roland Park location! "View Entire Post" to read about all of our new selections! This month, Miss Shirley's Corporate Executive Chef Brigitte Bledsoe and her culinary team are featuring specialty Pancakes, French Toasts, and Omelets inspired by St. Patrick's Day! "View Entire Post" to read about our festive March Monthly Specials! 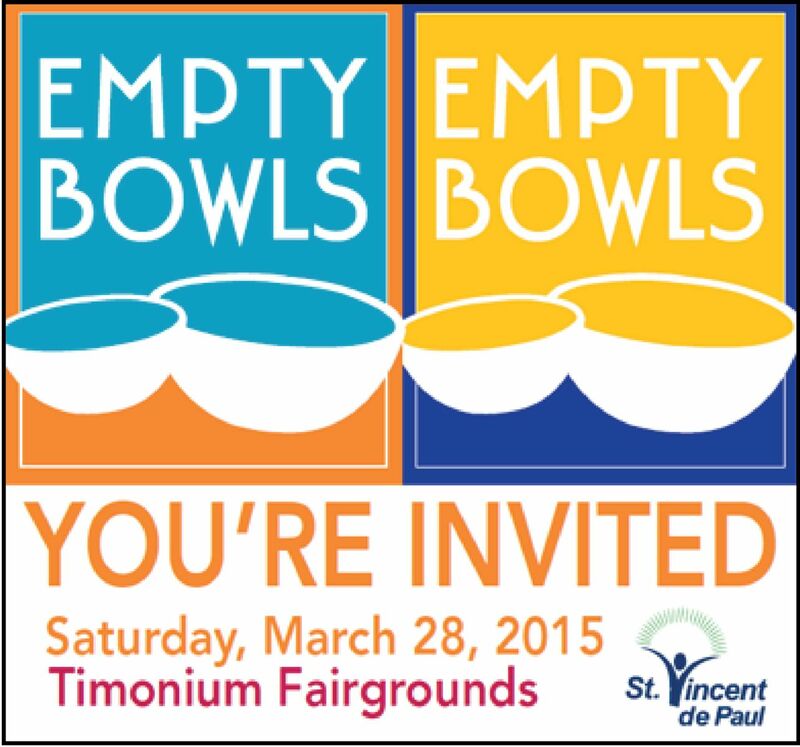 Helping the Community, One Bowl at a Time! Miss Shirley's Cafe is excited to be participating in St. Vincent de Paul of Baltimore's Empty Bowls event for the 5th year in a row! This year, on March 28th, we will be donating 60 gallons of our Smoked Tomato Bisque, garnished with Shredded Cheddar Cheese, to be served at the event. "View Entire Post" to read more about the upcoming event! NEW Spring Menu Coming March 18th! With warmer weather on the horizon, we are glad to leave the snow behind and trade out our signature cold weather dishes for fresh Spring and Summer flavors, with the debut of our Spring Menu on March 18th at all locations! In honor of the 10-year anniversary of Miss Shirley's Cafe, Roland Park, coming up in May, all locations will also be bringing back select signature items from Miss Shirley's original menu, including favorites like the Sweet Corn Cake Benedict, Breakfast Kabobs and Shrimp & Crab Salad Sandwich. "View Entire Post" to read more about our Spring offerings! 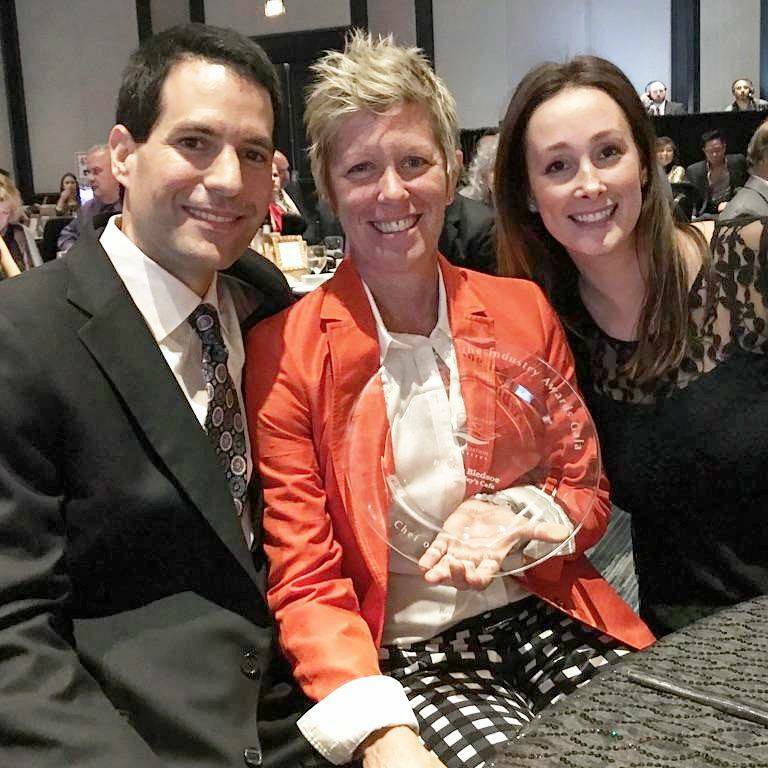 Jennifer McIllwain receives SmartCEO Executive Management Award! 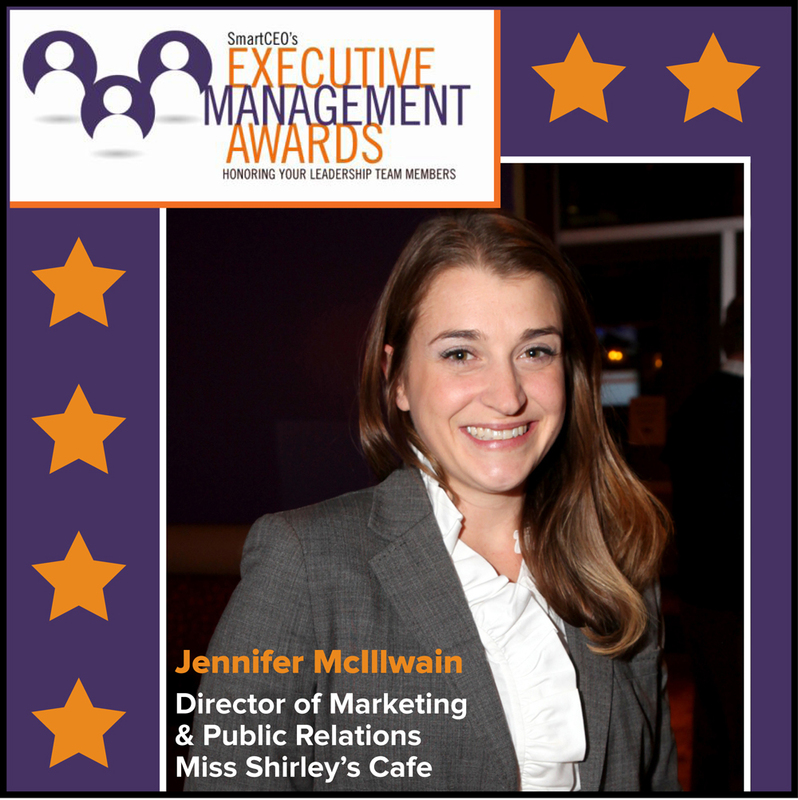 Miss Shirley's Cafe is pleased to announce that our Director of Marketing & Public Relations, Jennifer McIllwain, has been selected to receive a SmartCEO's Executive Management Award! Want to surprise your Sweetie with a Special Homemade Valentine's Breakfast or Brunch this year? "View Entire Post" to get the recipe for Miss Shirley's decadent Red Velvet Cheesecake Stuffed French Toast! Share a Special Valentine's Brunch! 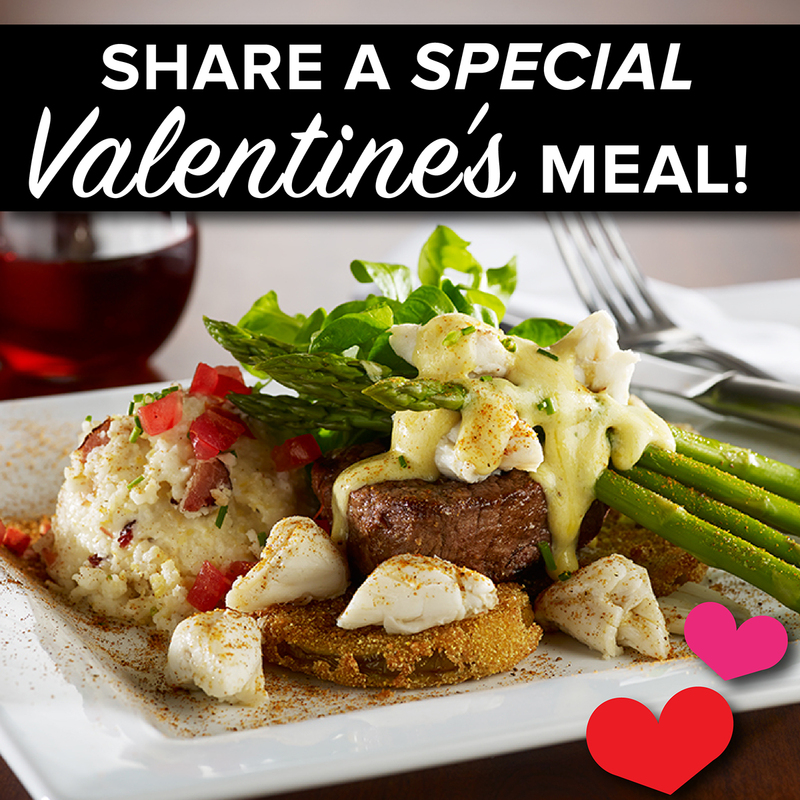 February is the month of love, and you know what they say - the way to someone's heart is through their stomach! But why let dinner have all the fun? Make this holiday special for your sweetheart, friends or family all week long with a Valentine’s Breakfast, Brunch or Lunch at Miss Shirley’s! "View Entire Post" for more information. 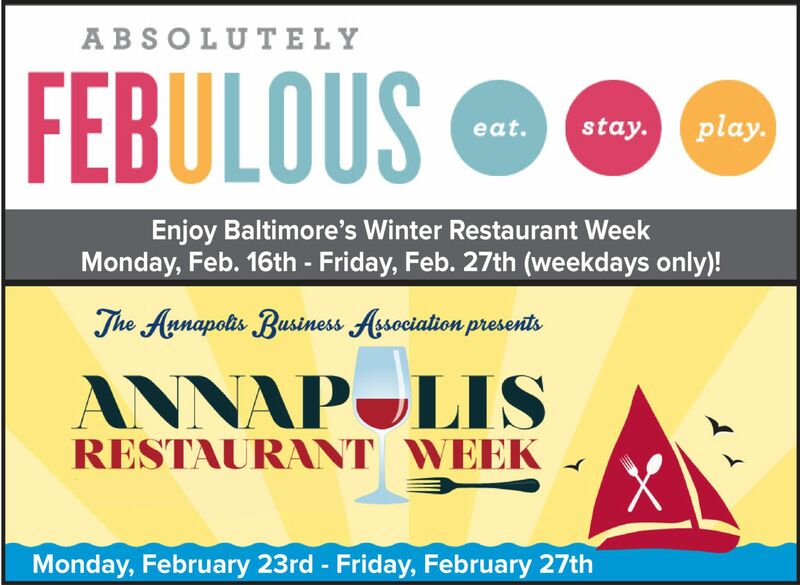 Join Us for Baltimore & Annapolis Restaurant Weeks! Miss Shirleys is excited to once again be participating in both the Baltimore & Annapolis Winter Restaurant Weeks! "View Entire Post" for more information & how to view our Restaurant Week Menus. February is the month of love, and you know what they say - the way to someone's heart is through their stomach! This month, Miss Shirley's is featuring Sweet & Savory Pancakes, French Toasts, and Omelets that are sure to satisfy your sweetie. "View Entire Post" to read all about the specialty selections we're offering this month! The New Year calls for all new Monthly Specials, and we're dishing up a delicious array of savory and sweet options at all 3 locations this month! 2014 Year in Review - Celebrating Another Great Year! Before we embark on new adventures in 2015, we pause and take a moment to reflect on all of the rewarding experiences we have had in the past year. In 2014, we had many accomplishments, including launching our first Loyalty Program, the construction of our Fresh Vegetable & Herb Garden in Roland Park, celebrations with our Miss Shirley's Team Members, countless events for local organizations & charities, and so much more. 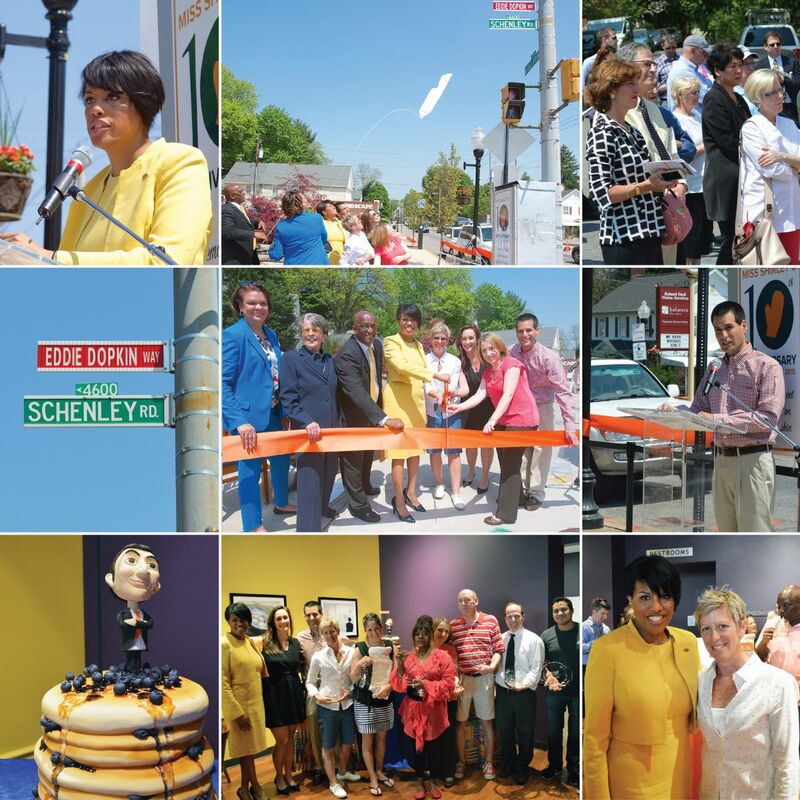 "View Entire Post" to view our Year in Review Timeline, which includes our favorite Miss Shirley's moments of 2014! Start the Year Off Right with Shirley's Lighter Side! It’s a New Year and anything is possible! Looking to start the year a little lighter? Check out some of our Shirley’s Lighter Side Options! "View Entire Post" to read about all of our Light & Healthy Breakfast & Lunch Options. Thanksgiving has passed, marking the beginning of the Holiday Season! This year, Miss Shirley’s Café will be celebrating the winter weather with all-new Flavorful & Festive Monthly Specials. "View Entire Post" to read more about the Holiday-Inspired Selections we are offering this month! When we think of the Holiday Season, several Festive Foods come to mind, and one of them is Gingerbread! 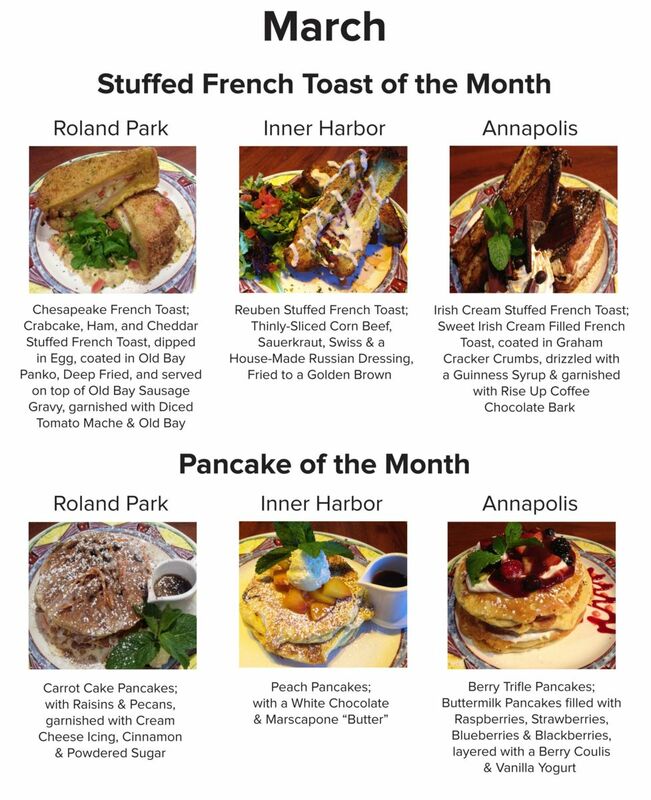 At Miss Shirley’s, we try our best to incorporate Fun Festive Dishes as our Monthly Specials during the Holiday Season, and that’s why we are offering our delicious Gingerbread Cheesecake Stuffed French Toast at our Roland Park location during the month of December. Is your mouth watering over this cookie-crumbling concept? "View Entire Post" to get Corporate Executive Chef Brigitte Bledsoe’s Recipe and surprise your loved ones with a Homemade Holiday Brunch this year! Roland Park's 2014 Shop & Dine Event! 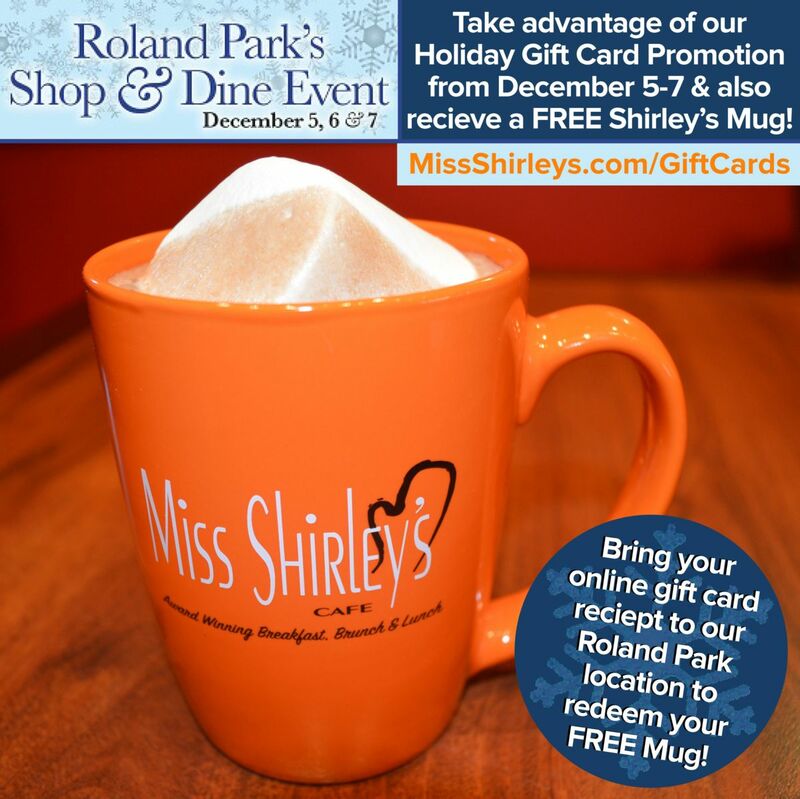 Miss Shirley’s Café is proud to have been part of the Roland Park Community for nearly a decade now! That's why we are so excited to give back and join in on the Roland Park’s Shop & Dine Event, taking place December 5th-7th! "View Entire Post" to learn about our special "Think Local First" promotion during the event! Happy November! Thanksgiving is right around the corner, and we’ve got ALL NEW Festive Fall Flavors at all 3 Miss Shirley’s Café locations this month! “View Entire Post” to read all about what's in our November selections! Looking for the Perfect Holiday Venue? With the Holidays approaching, there are countless reasons to celebrate! Treating your staff, clients, or colleagues to a special Breakfast or Lunch, celebrating Birthdays, Weddings, or Personal Successes with a comforting meal, or bringing your family and friends closer together with a Holiday meal are just a few of the possibilities. If you’re looking for the perfect place to book your private Holiday event this year, look no further! All 3 Miss Shirley’s Café locations offer Semi-Private or Private dining Areas Monday-Friday from 7 a.m. – 3 p.m. for groups of 11 or more! "View Entire Post" to learn more about Private Holiday Dining! When we think of Fall comfort foods, one delicious ingredient comes to mind – Sweet Potatoes! 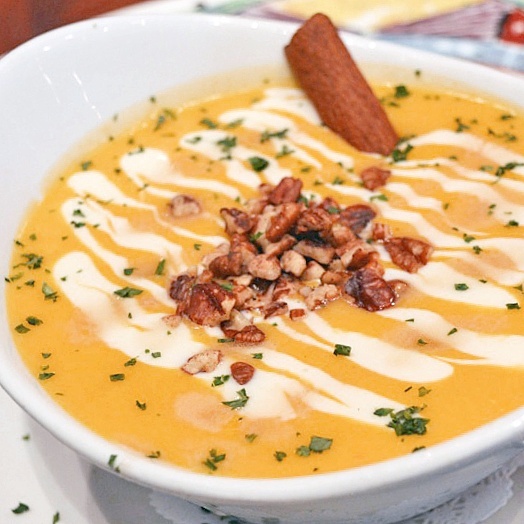 If you love Miss Shirley’s Signature Sweet Potato Bisque, then you’re in for a treat. "View Entire Post" to check out Corporate Executive Chef Brigitte Bledsoe’s Recipe and cozy up to your own delicious bowl of Sweet Potato Bisque today! B'more Giving with Miss Shirley's Gift Cards! It’s already November, and you know what that means – the Holidays are right around the corner! It's a time for giving, sharing and celebrating with your family and friends! Our team at Miss Shirley's loves serving you our comforting, homey and creative dishes all year long, but especially during this joyous season! That's why we've decided to - B’more Giving this season with Miss Shirley’s Holiday Gift Card Promotion! “View Entire Post” to learn more! Introducing Wacko for Flacco Pancakes! Let's hear it for the purple and black! 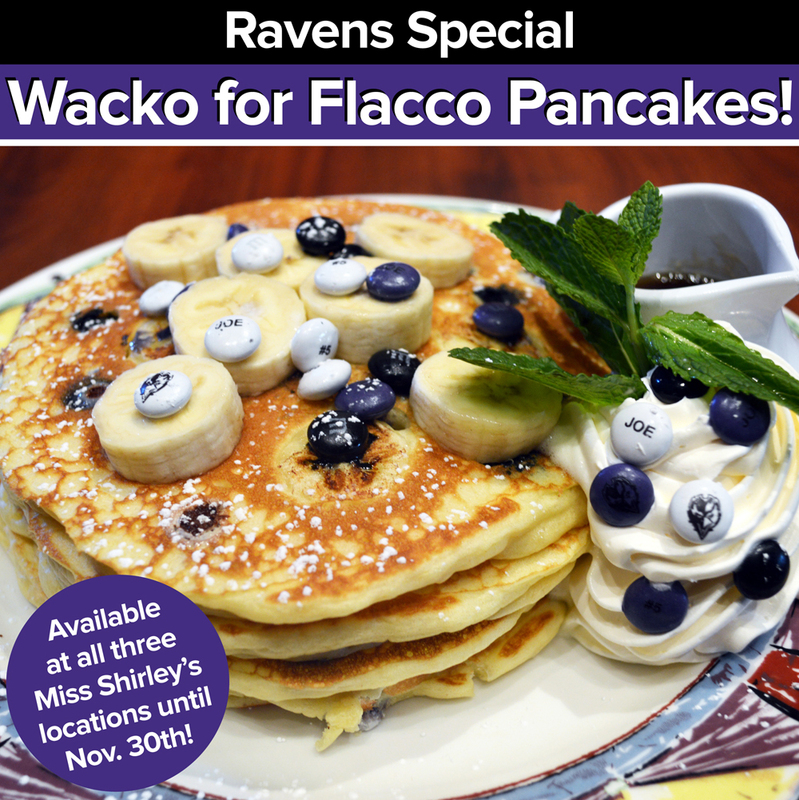 At Miss Shirley’s, we are proud to be a part of the Ravens Nation! "View Entire Post" to read about our New Ravens Special! We Wont Stop Supporting Our Guys! At Miss Shirley’s, we are proud of our City and of our Guys, the America League East & American League Division Series Champions! Last month we featured our popular Double Play A.J. 's Cinnamon Crunch Cheesecake Stuffed French Toast, and that's why we decided that We Won't Stop supporting the Baltimore Orioles again this month, as we enter the American League Championship Series! Book Your Private Holiday Event Now! The Holidays are approaching faster than you think! 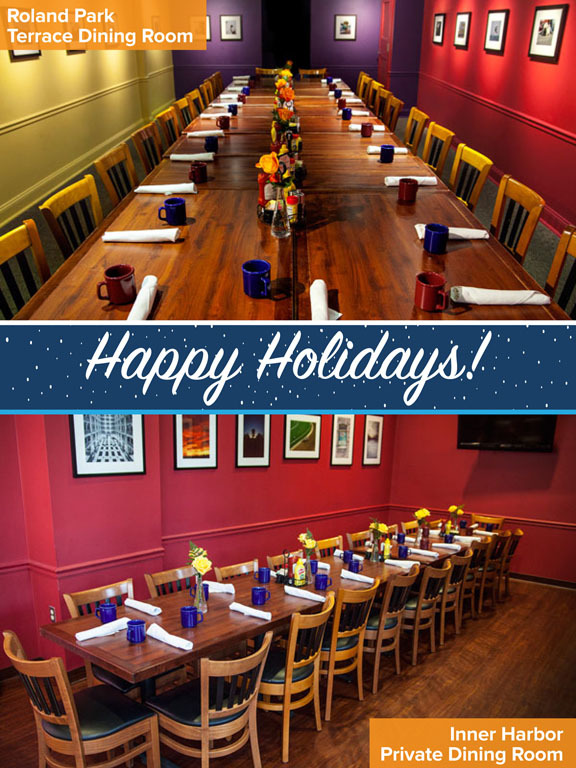 Looking for the perfect place to book your private Holiday event this year? 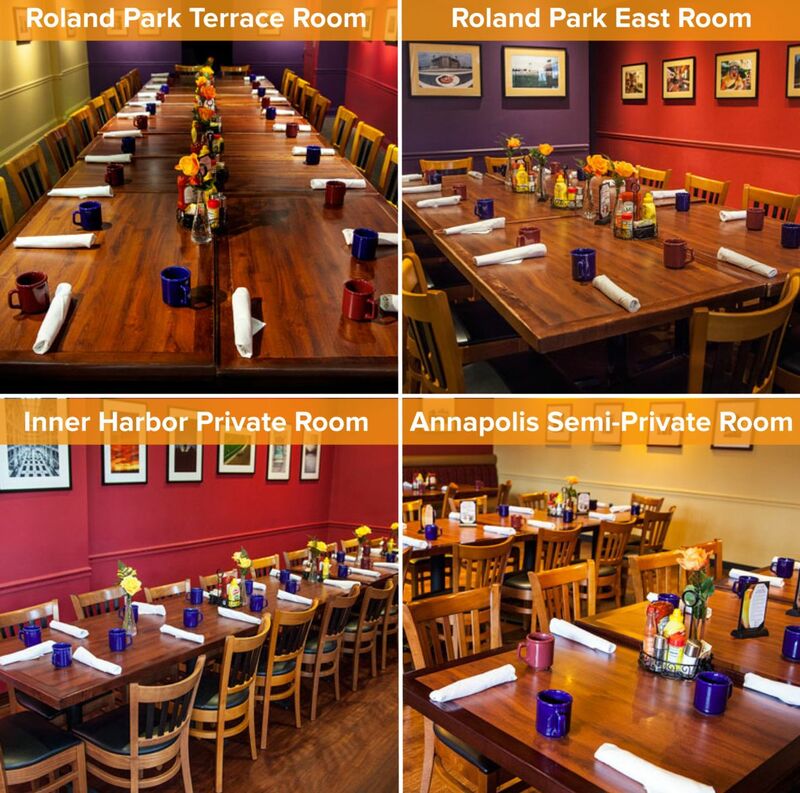 All 3 of our Miss Shirley’s Café locations, Roland Park, Inner Harbor, and Annapolis offer Semi-Private or Private Dining Areas Monday through Friday from 7 a.m. - 3 p.m. for groups of 11 or more! NEW Fall Flavors at Miss Shirley's! With the weather cooling down, Fall is in the air! 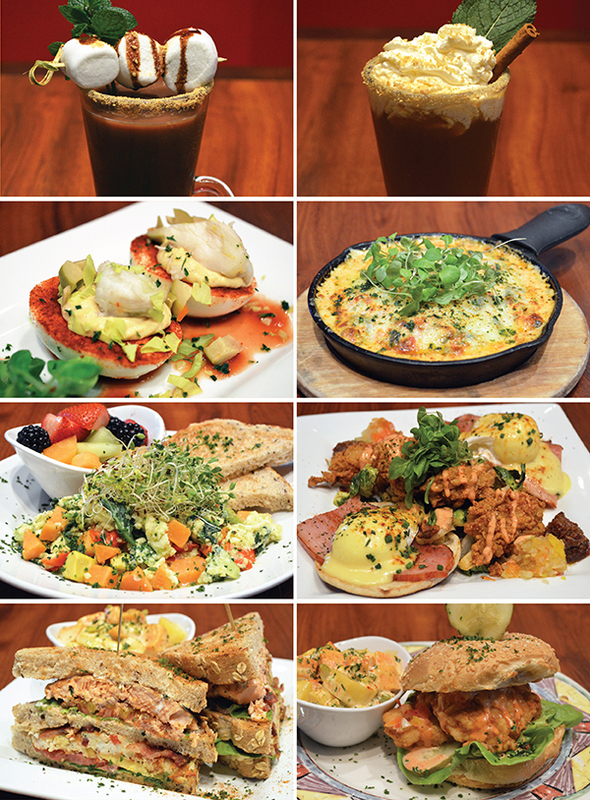 Miss Shirley’s Café is celebrating the season with our NEW Fall menu, now available at all 3 locations. Delicious, imaginative new dishes and returning favorites join House Specialties for a fresh offering of seasonal flavors. "View Entire Post" to read about all of our new offerings! Miss Shirley's Vegetable & Herb Garden! 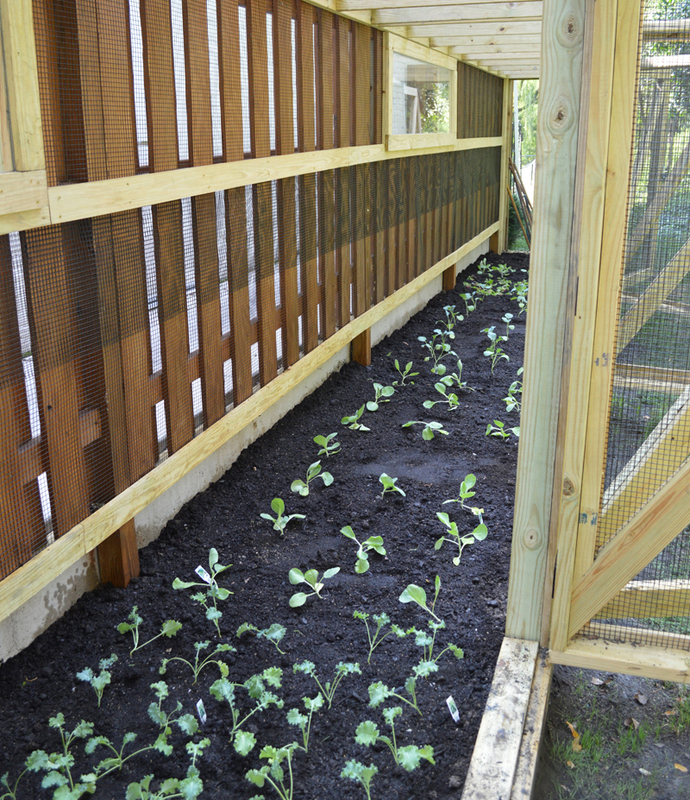 Miss Shirley’s, Roland Park is proud to now have our very own Vegetable & Herb Garden! Corporate Executive Chef Brigitte Bledsoe’s vision has become a reality, with the assistance of Executive Chef Eric Blass and his father, as well as Sous Chef Zuri Coles! "View Entire Post" to read more about our Garden in the City! NEW Fall Menu Coming September 24th! We will be kicking off Fall with a NEW menu, which will debut on Wednesday, September 24th! Delicious, innovative new dishes and returning fan favorites join house specialties for a fresh offering of seasonal flavors. "View Entire Post" for a sneak peek into our new Fall menu options! 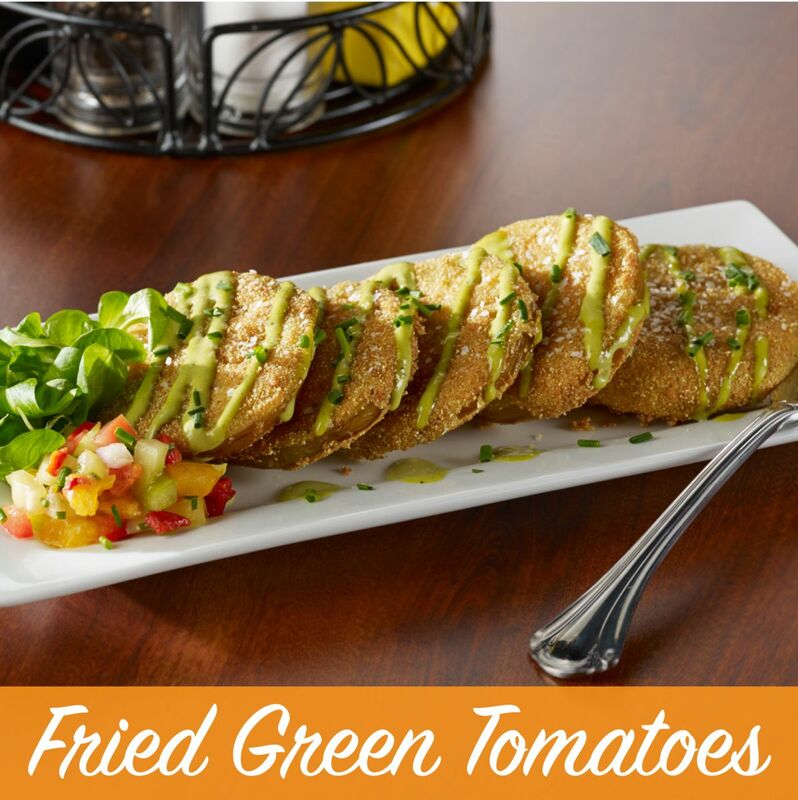 When it comes to Southern Specialties, Fried Green Tomatoes are at the top of the list – which is why our Signature Fried Green Tomatoes with Lemon-Herb Aioli & Chow Chow are a staple on our seasonal menu. “View Entire Post” to check out Corporate Executive Chef Brigitte Bledsoe’s Recipe! When Miss Shirley’s Café was first founded, Corporate Executive Chef Brigitte Bledsoe answered an ad calling for the “Best Breakfast Chef in the World,” and even while on crutches, she prepared Coconut Cream Stuffed French Toast, for founder, Eddie Dopkin. 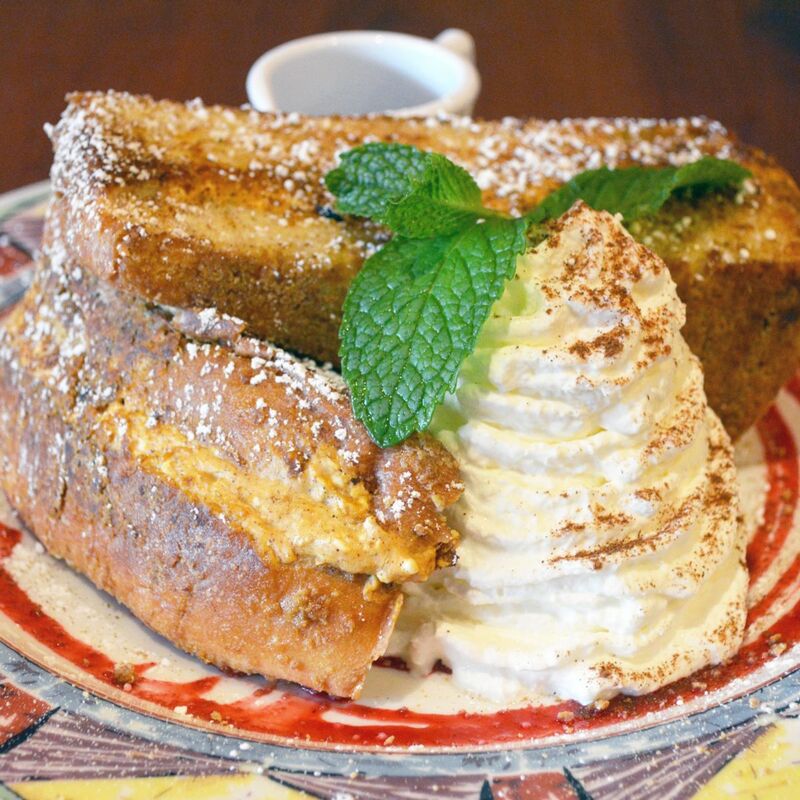 Chef Brigitte was hired on the spot, and her Coconut Cream Stuffed French Toast has remained a favorite on our menu since Miss Shirley’s Café first opened on Cold Spring Lane in 2005. 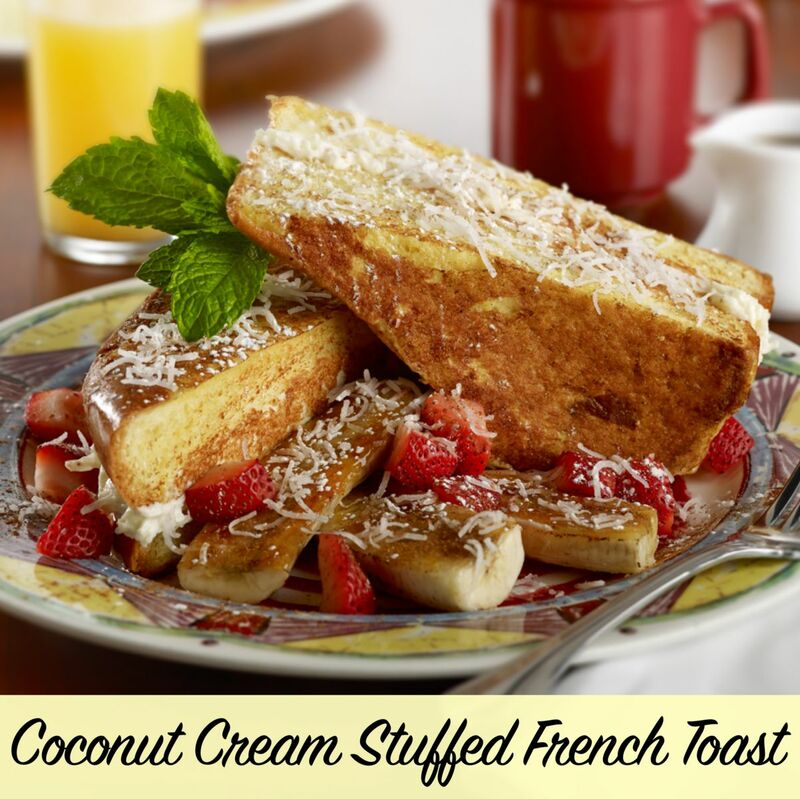 If our signature Coconut Cream Stuffed French Toast is one of YOUR favorite Miss Shirley’s Signature dishes, you’re in luck! Miss Shirley's Team Visits Roseda Farm! 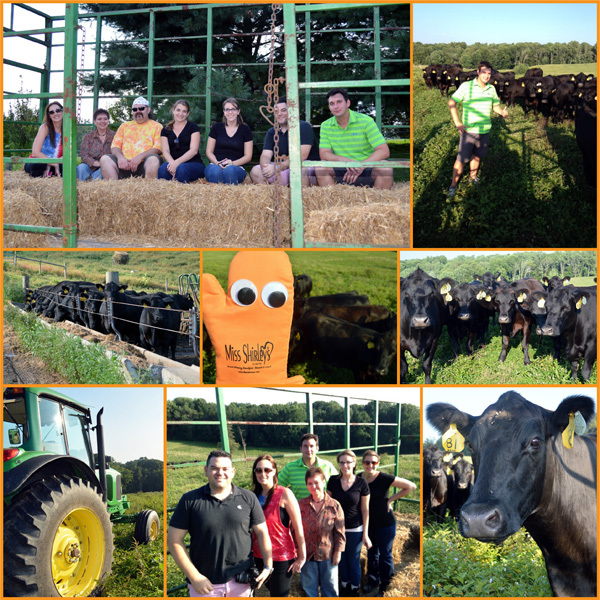 On Wednesday, August 13, 2014, a few of our Miss Shirley’s team members took a trip to the Roseda Black Angus Farm! "View Entire Post" to read about our experience! 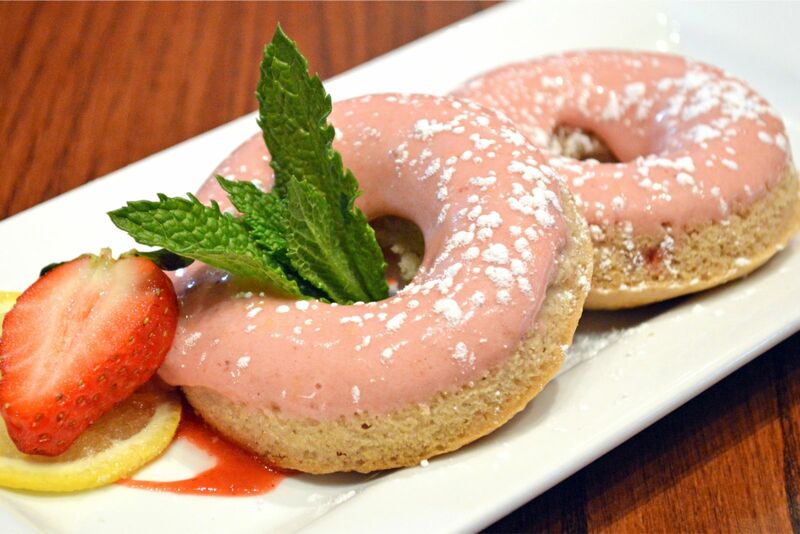 If you’ve got a sweet tooth, you’re in luck! 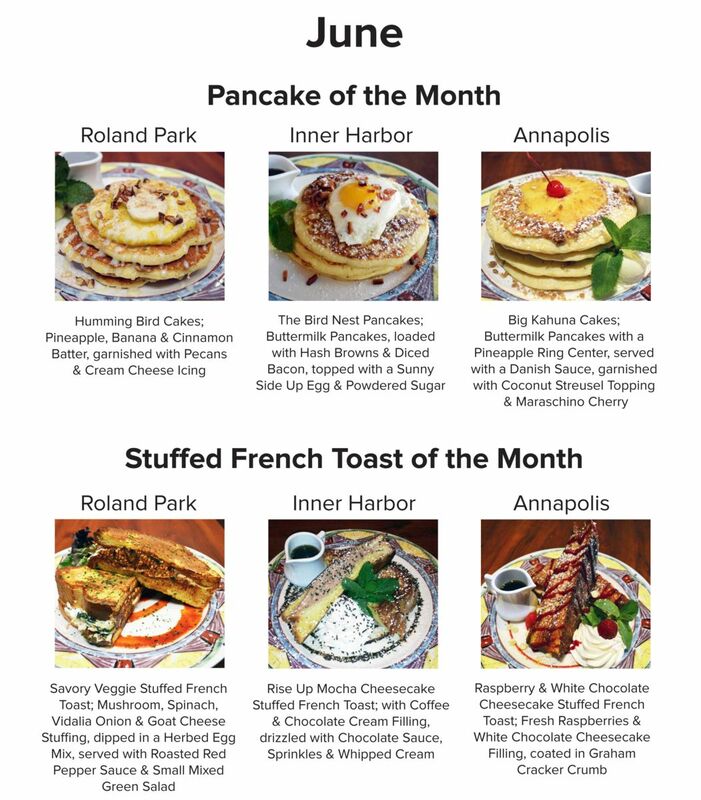 All 3 Miss Shirley’s locations are offering all new August Pancake and French Toast of the Month options that are sure to satisfy! 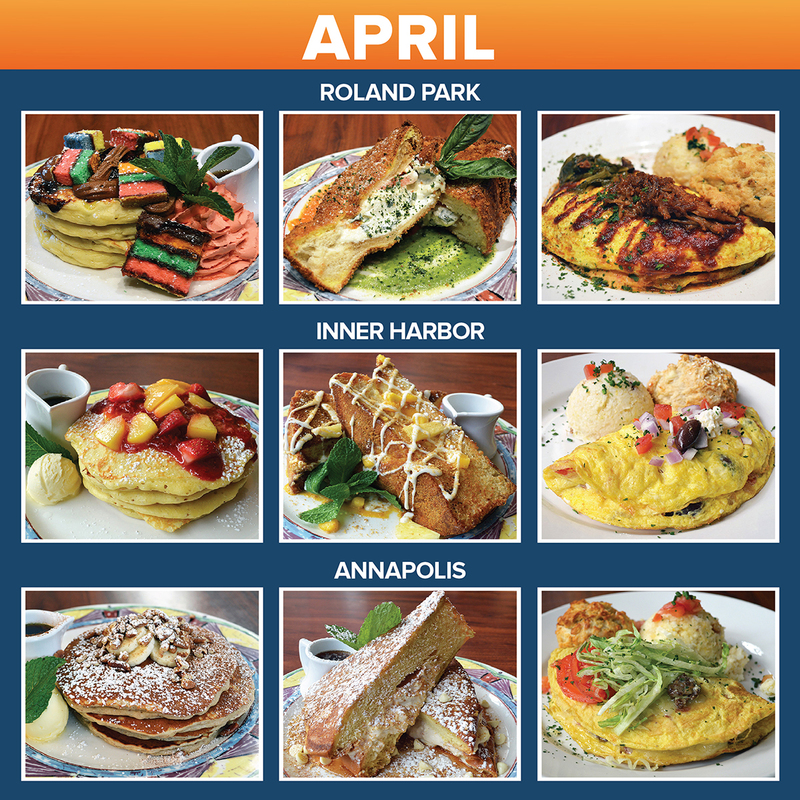 This month, we’ve got it all – from Fresh & Fruity Options and Decadent Dessert Dishes to Savory & Saucy Pancakes! "View Entire Post" to read about all of our August selections! 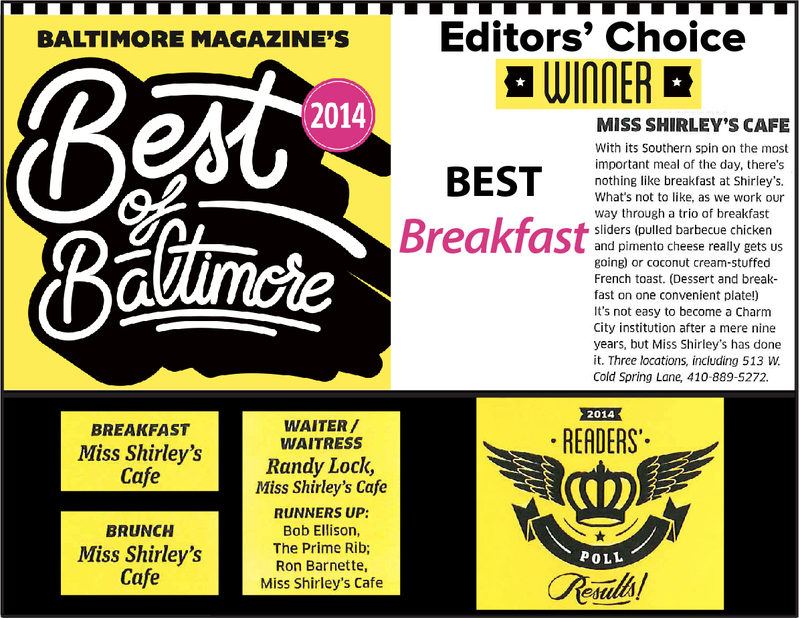 We are excited to announce that Miss Shirley’s Café was named the 2014 Best of Baltimore Winner for “Best Breakfast” in Baltimore Magazine’s August issue! Miss Shirley’s was also awarded 2014 Best of Baltimore Readers’ Poll Winners for “Best Breakfast” and “Best Brunch,” and Miss Shirley’s server, Randy Lock, was named “Best Waiter!” Miss Shirley’s server, Ron Barnette, was also a runner up in the “Best Waiter” category! 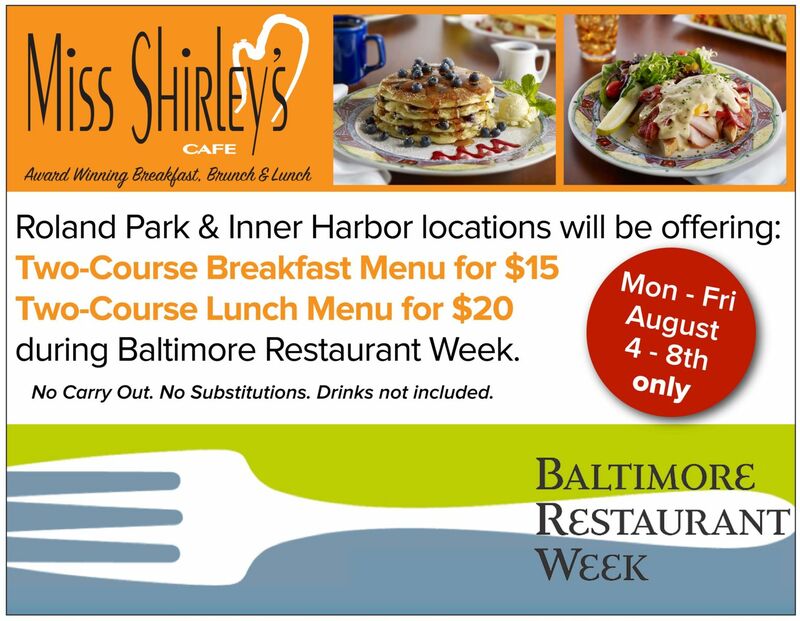 Miss Shirley’s Café will be participating in the tastiest week of summer - Baltimore’s Summer Restaurant Week! We are excited to offer new guests the opportunity to experience Miss Shirley’s in this fun and unique dining experience! "View Entire Post" to see our Baltimore Summer Restaurant Week Menu! Introducing Miss Shirley's "Where's Mitty?" Scavenger Hunt Contest! How well do you know your city? 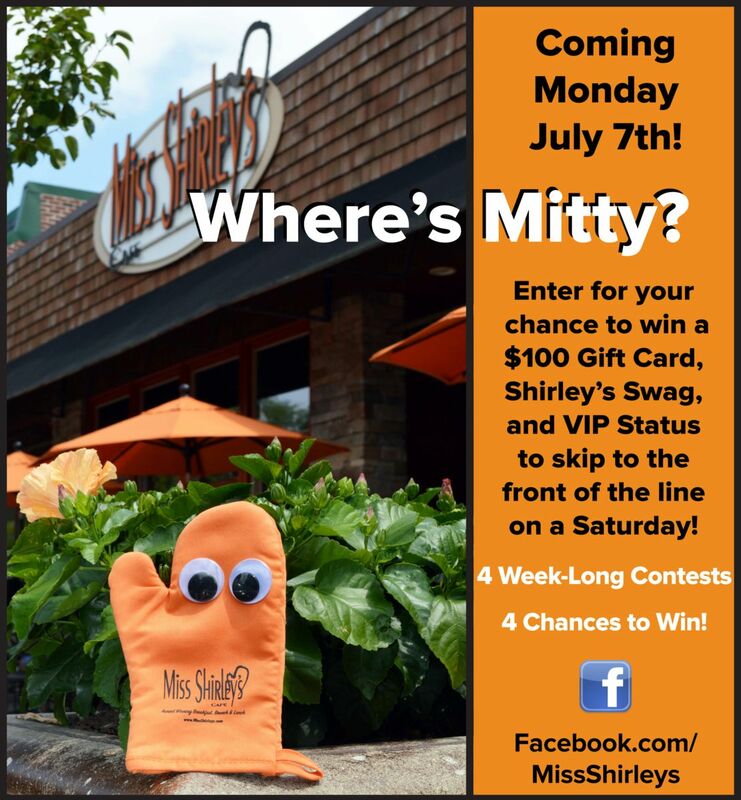 This month, Miss Shirley’s will host a “Where’s Mitty?” Scavenger Hunt Contest, where fans will have a chance to WIN A $100 MISS SHIRLEY’S GIFT CARD, SHIRLEY’S SWAG, & VIP STATUS to skip to the front of the line on a Saturday! We will post photos of our Miss Shirley’s Oven Mitt, “Mitty,” at various locations throughout Baltimore & Annapolis, and YOU guess the locations. "View Entire Post" for contest rules and guidelines! Bite Into Some Delicious Rewards! Do you dine with us daily, weekly, or monthly? Then you deserve to be rewarded! 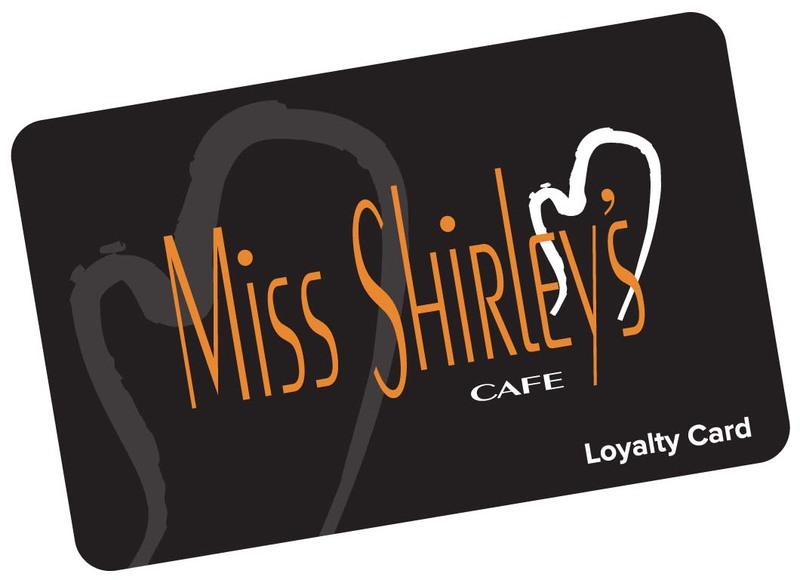 Miss Shirley's is excited to now offer a Brunch Club Loyalty Program for our frequent guests! By joining the Brunch Club, members have the opportunity to earn 1 point for every $1 spent at any of our 3 locations, which can be redeemed for exclusive offers and Restaurant Credits! Who says you can only eat breakfast before noon? 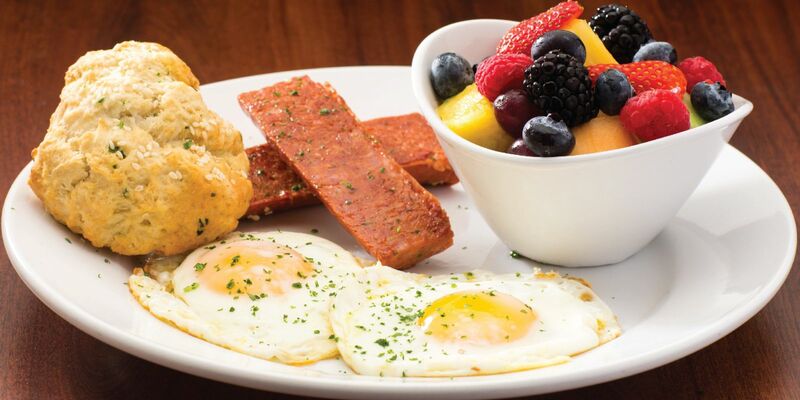 We can satisfy your breakfast craving, even on your lunch break. We have a ton of delicious breakfast items that will wake up your taste buds midday and help to power you through your afternoon schedule! 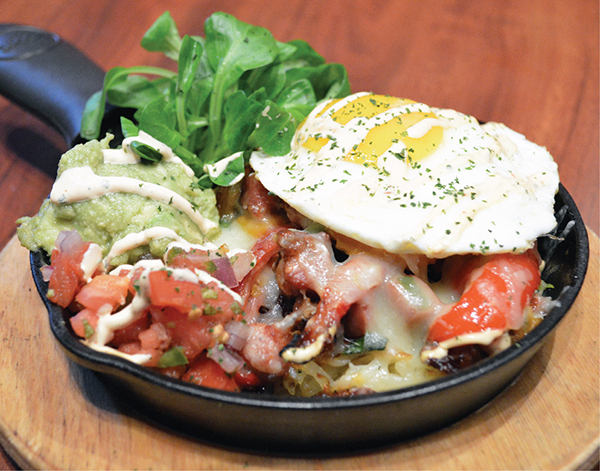 "View Entire Post" to read about our delicious Breakfast for Lunch selections! Cast Your Vote for Miss Shirley's! 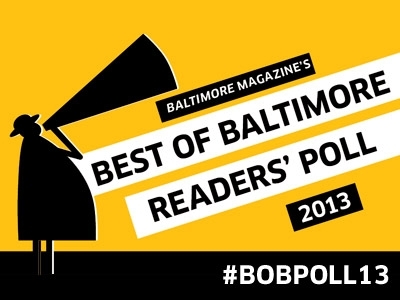 Baltimore Magazine's 2014 Best of Baltimore Readers' Poll is going on now and it's time to make your voice heard! A Blast to the Past: The History of Miss Shirley's Cafe! Daily, our Miss Shirley’s team members get asked questions like, “Who is Miss Shirley?” or “Is Miss Shirley cooking back there? Can I meet her?” So, in honor of her birthday today, we thought we would tell our guests all about the fascinating story of Miss Shirley McDowell and the history of the Café, which was named in her memory. "View Entire Post" to read the entire story! Happy June! We’re serving up all new Pancakes and French Toasts of the Month, starting today! “View Entire Post” to read about all of our new selections! This month, Miss Shirley’s is serving up all new Pancakes and French Toasts of the Month that are sure to satisfy your sweet tooth! And don’t we all deserve to indulge occasionally? 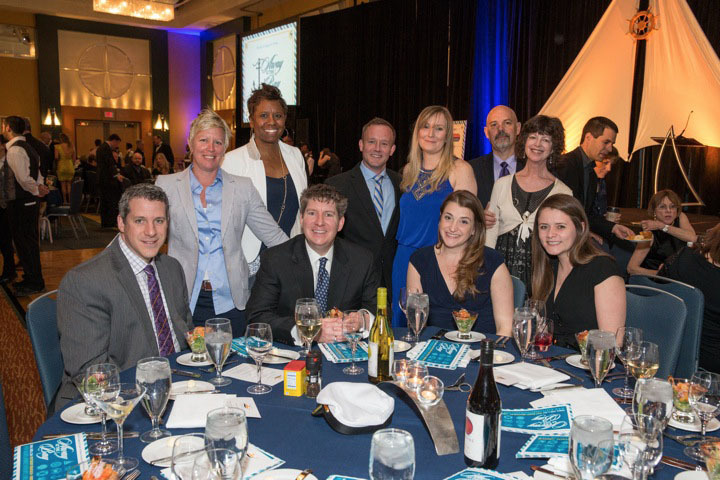 On April, 6th 2014, members of the Miss Shirley’s Café team were fortunate to attend the Restaurant Association of Maryland (RAM) Away at the Bay Annual Awards Gala. Although Miss Shirley’s has attended the RAM Gala for the past several years, this year was particularly special for our team. 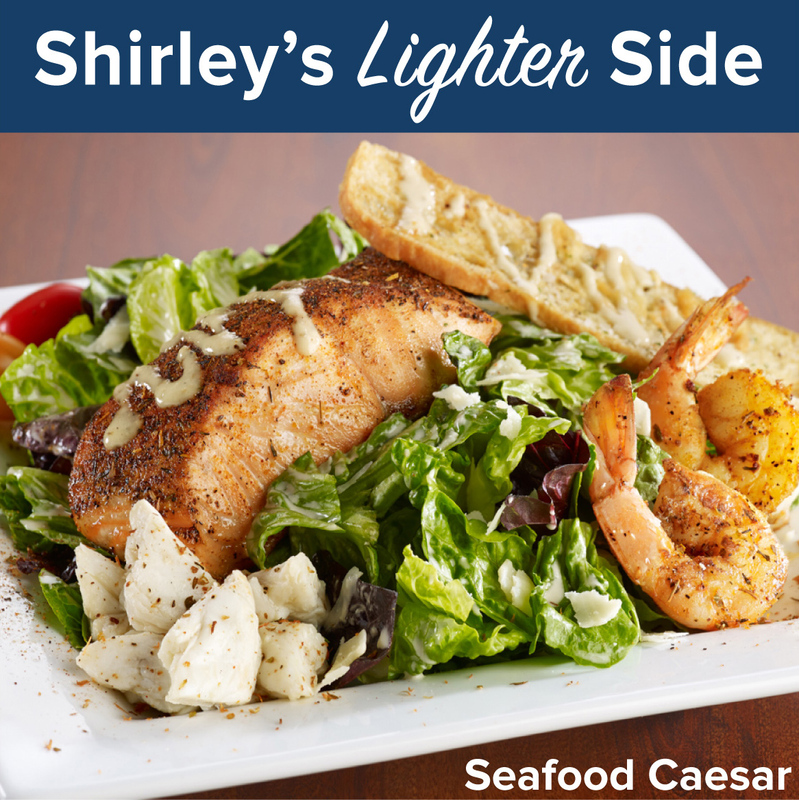 Shirley's Lighter Side Menu Options! 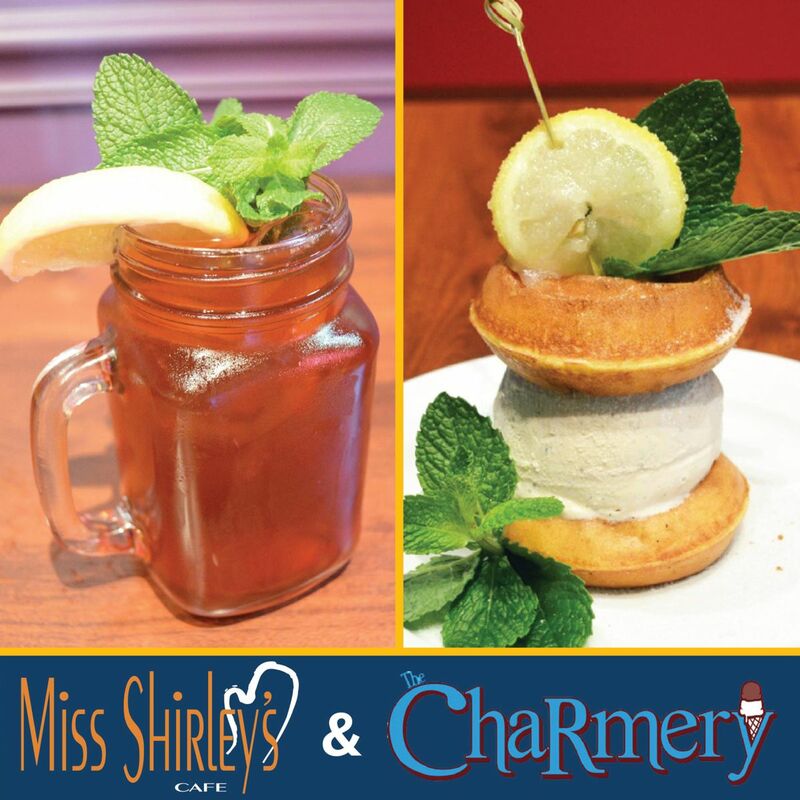 Warmer weather calls for fresh flavors, so get a taste of all things refreshing and light at Miss Shirley’s this season! Our Spring Menu showcases delicious new ways to use seasonal fresh fruits and veggies to add color and flavor to our Shirley’s Lighter Side Menu options. Treat Your Mom To Baltimore’s Best The Week Of May 5th-11th! Once a year we gather to celebrate our first love, Mom. So mark your calendars because Sunday, May 11th is Mother’s Day! If you’re scrambling to find the perfect place to treat your mother to a fabulous breakfast, brunch, or lunch this year, look no further. 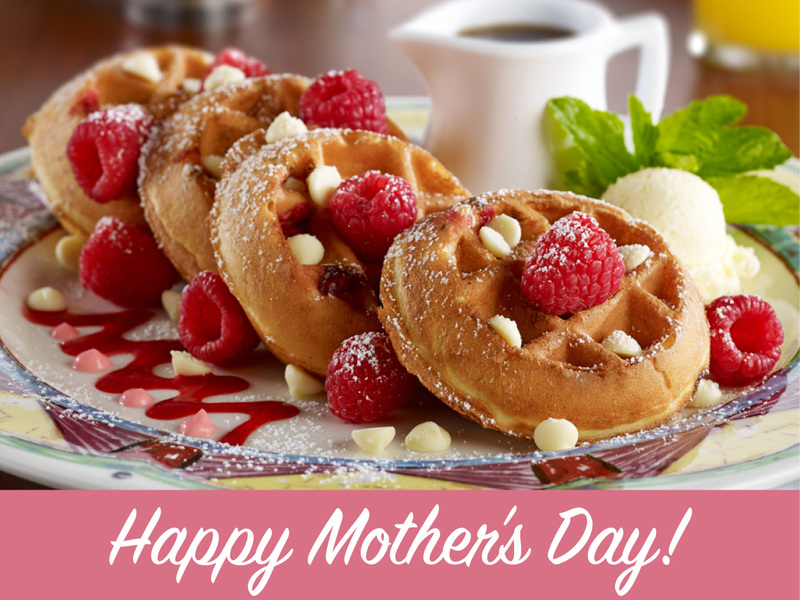 Miss Shirley’s Café offers a wide variety of options that are sure to satisfy Dear Mom. But why only celebrate one day when Mom is there for you every day of the year? 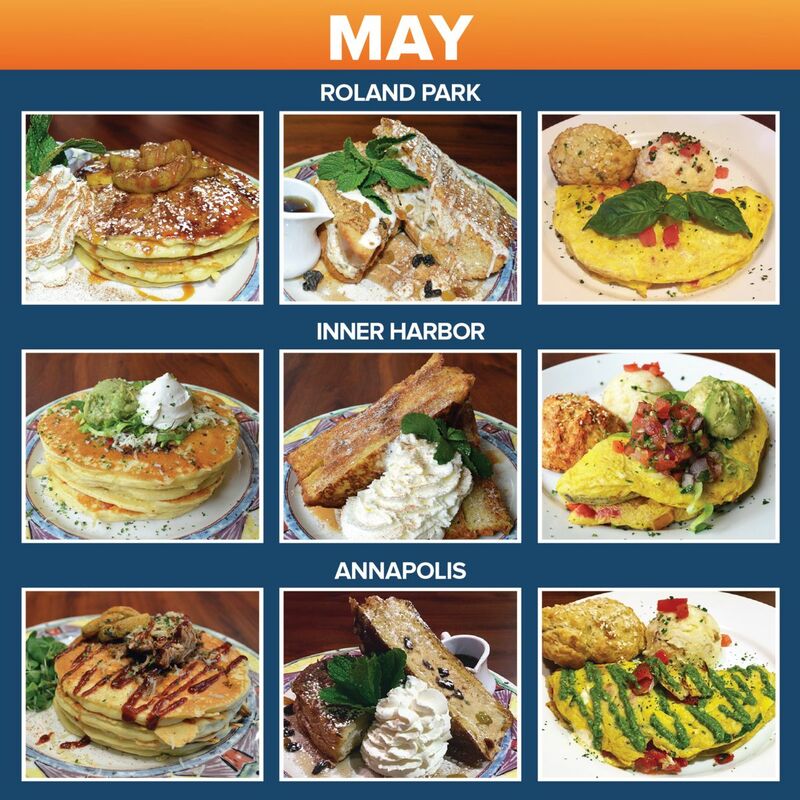 Make Mother’s Day a weeklong event by treating your mother to Baltimore’s Best Breakfast, Brunch, and Lunch the week of May 5th-11th! When in meetings with his Classic partners or restaurant team, the “first course” of business on Eddie Dopkin’s agenda was always donation requests and team member based initiatives. From gift cards and turkey dinners to the circus, ball games and milestone celebrations, the “first course” was always based in giving; which is why David Dopkin and family have created a Culinary Scholarship to honor and celebrate the life and memory of Eddie Dopkin. "View Entire Post" to read the full story. 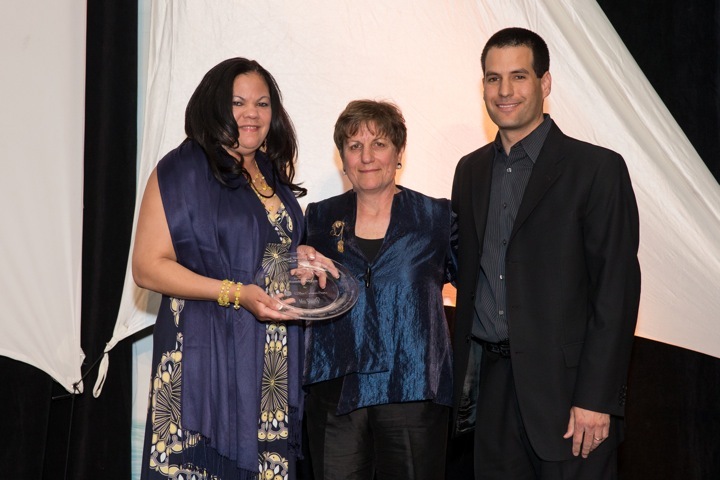 David Dopkin of Miss Shirley’s Café and Harriet Dopkin of The Classic Catering People presenting the “Eddie Dopkin First Course Award, Honoring Entrepreneurship in Hospitality” scholarship at the Restaurant Association of Maryland’s Away at the Bay Gala on April 6th. Happy Earth Day! 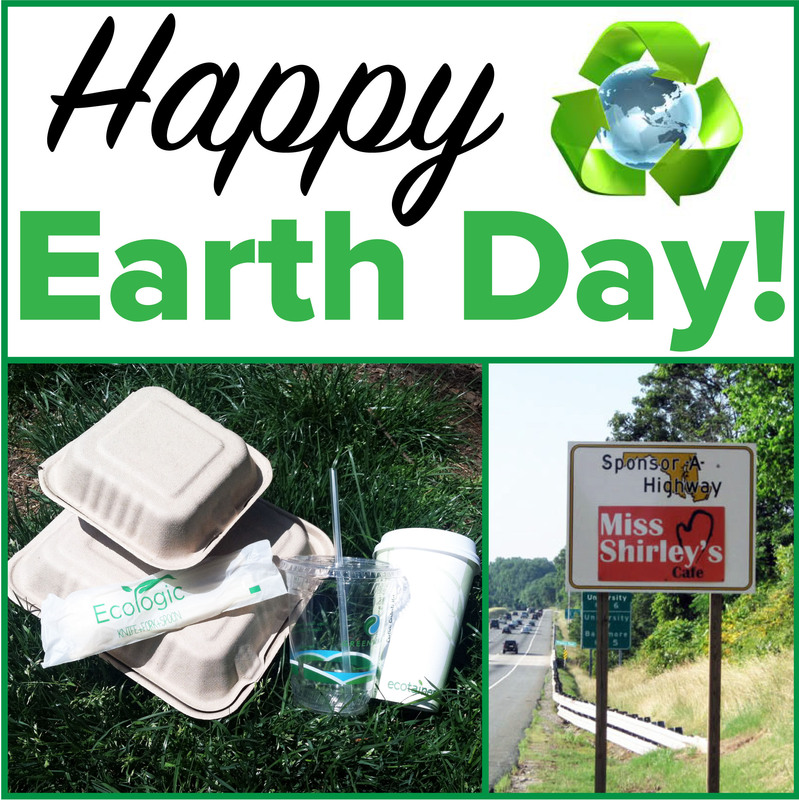 In honor of the holiday, Miss Shirley’s would like to let our guests know what we do daily to help keep our planet clean and green! 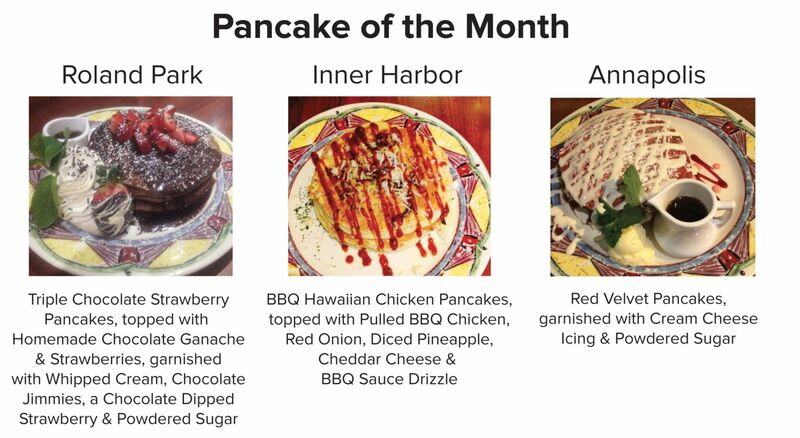 This month, our chefs have outdone themselves with all-new Southern inspired Pancakes and French Toasts of the Month featuring fresh fruits, veggies, and even seafood! “View Entire Post” to read about all of our delicious new offerings this month! 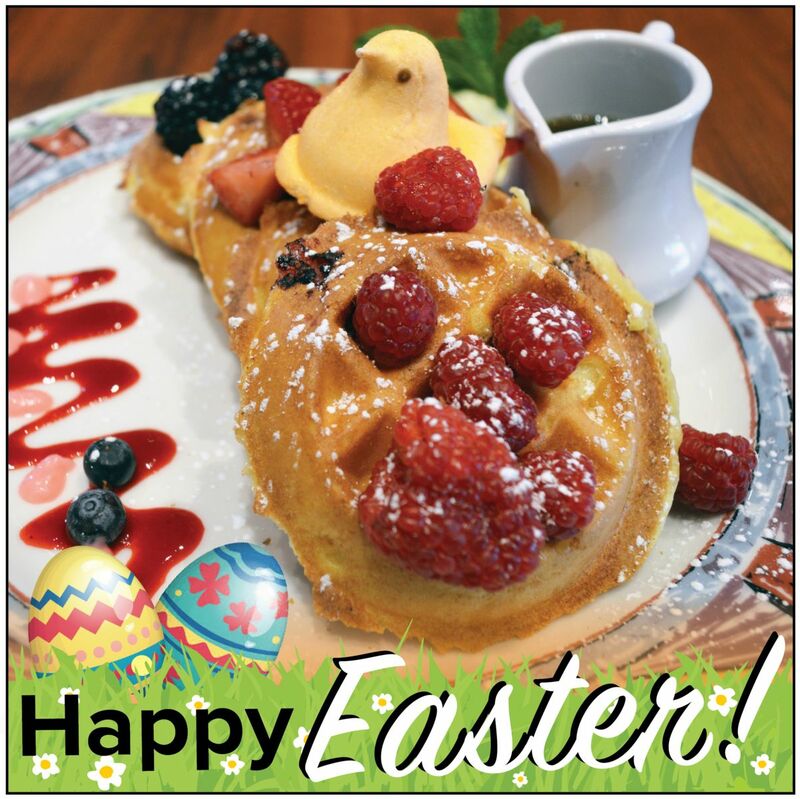 Easter is on its way, and if you’re looking for the perfect spot for your holiday breakfast, brunch, or lunch, we’ve got you covered! Make it an Easter feast to remember with Miss Shirley’s twist on real home Southern cooking. Know us for breakfast? You should know us for lunch too! Miss Shirley’s has added over 10 all-new lunch selections to our Spring Menu, including fresh soups, salads, and sandwiches! Spring into Miss Shirley’s NEW Menu! It's the first day of Spring, and we’re excited to kick off the season with a NEW Spring menu! Delicious innovative new dishes and returning fan favorites join our house specialties for a fresh offering of seasonal flavors. “View Entire Post” to see all of our new Spring offerings! 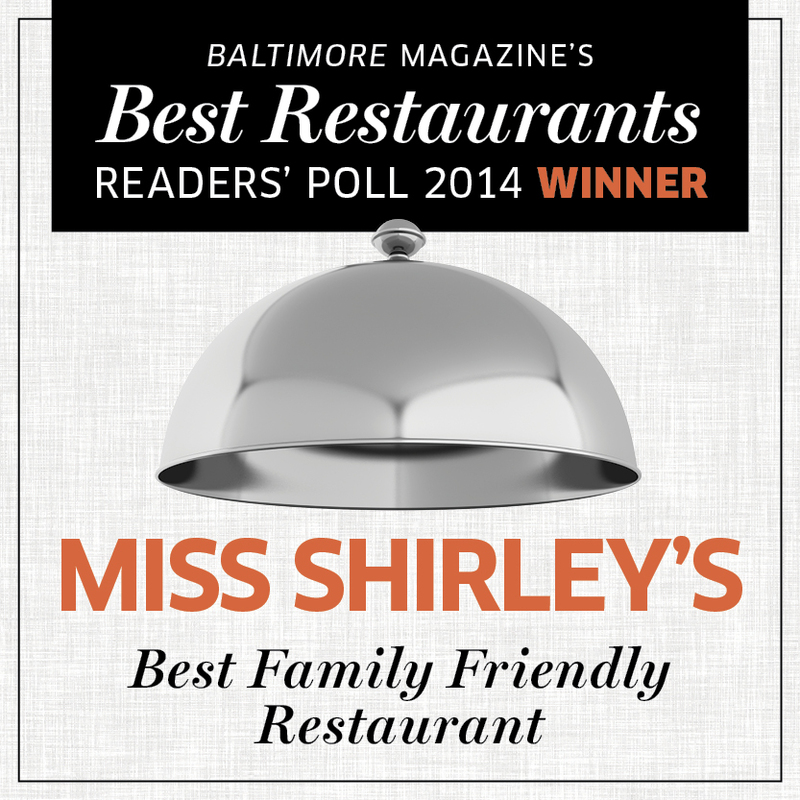 Miss Shirley's Awarded "Best Family Friendly Restaurant"
We are excited to announce that Miss Shirley’s Café has recently been named “Best Family Friendly Restaurant” in Baltimore Magazine’s 2014 Best Restaurants Readers’ Poll!! “View Entire Post” for more information! 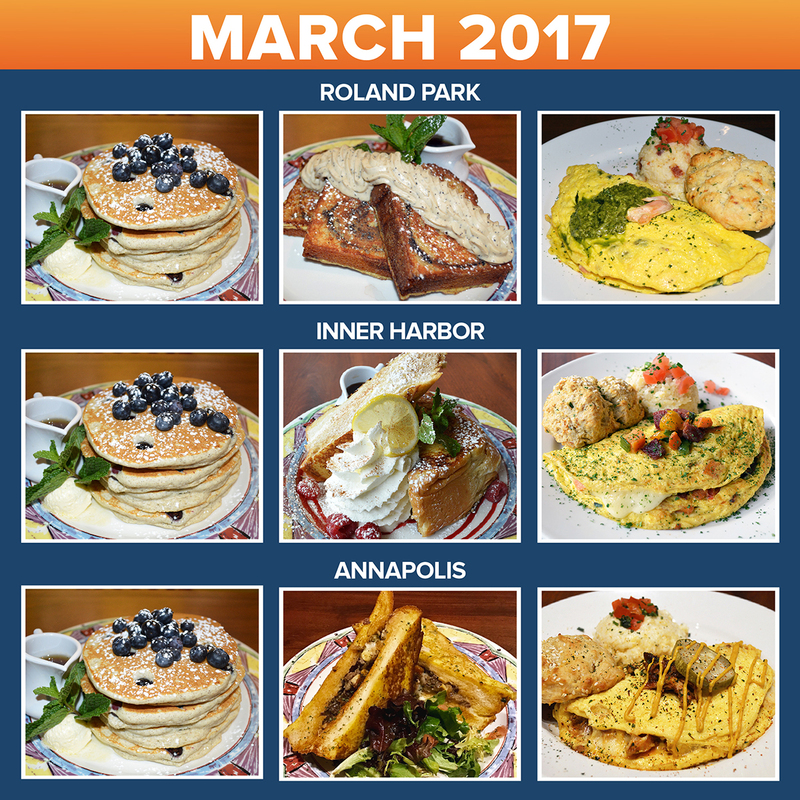 Spring is finally on its way, and our chefs are celebrating with fresh ingredients in our all-new Pancakes and French Toasts for March! 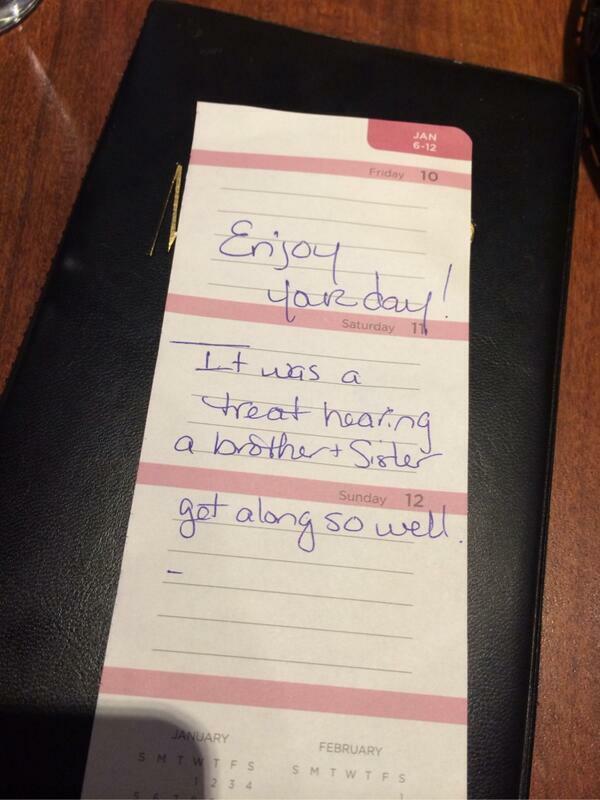 A Random Act of Kindness at Miss Shirley's! On February 20th, one of our Miss Shirley’s team members, Ron Barnette, witnessed something remarkable – a truly random act of kindness from one of our guests! "View Entire Post" to read the whole story! 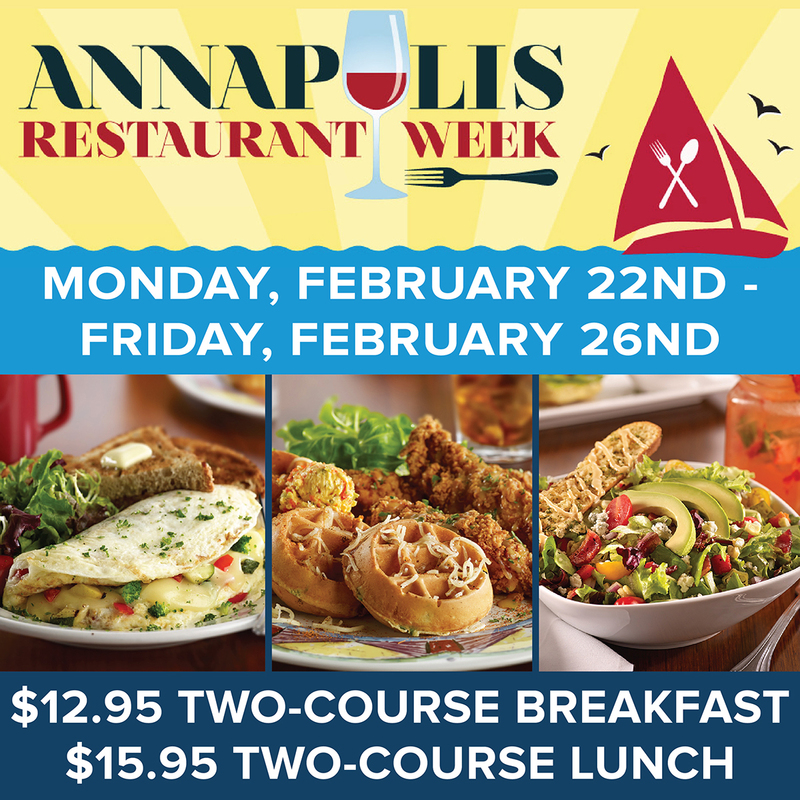 Join us for Annapolis Restaurant Week! 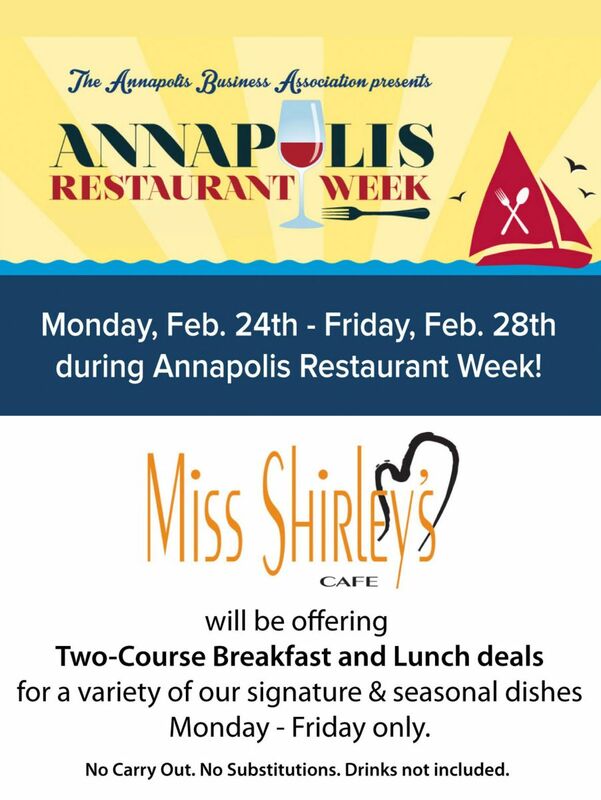 Miss Shirley's is excited to be participating in Annapolis Restaurant Week! “View entire post” for more information and to see our Restaurant Week Menu! Visit Miss Shirley's for Baltimore's Winter Restaurant Week! 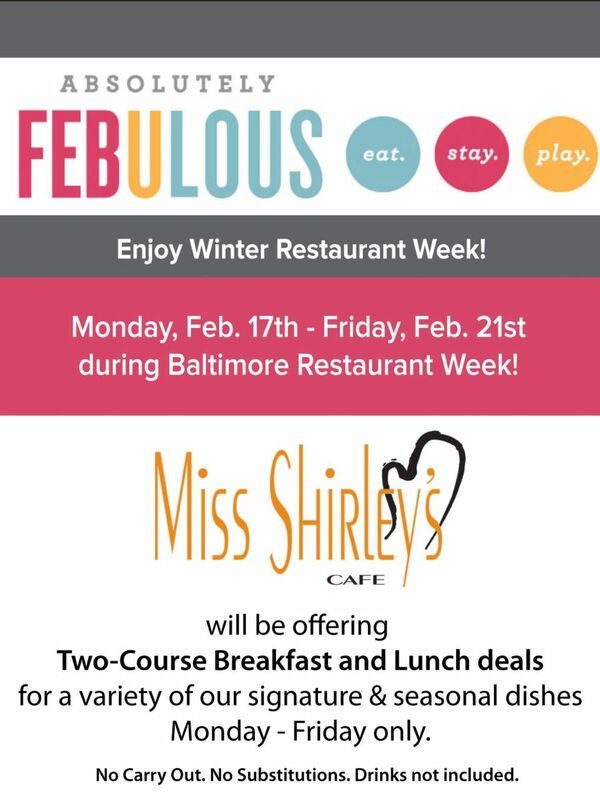 Miss Shirley's is excited to be participating in Baltimore's Winter Restaurant Week, "Absolutely Febulous," for the first time ever! 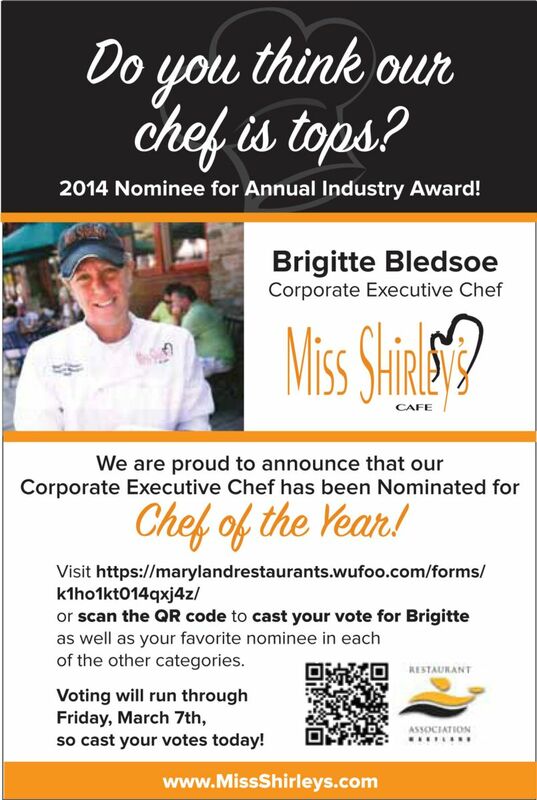 Vote Corporate Executive Chef Brigitte Bledsoe for Chef of the Year! We are excited to announce that our Corporate Executive Chef, Brigitte Bledsoe, has been nominated for the Restaurant Association of Maryland’s Chef of the Year Award! "View Entire Post" to read about Chef Brigitte! February is the month of love, and you know what they say? The way to someone's heart is through their stomach! This month, Miss Shirley's is featuring some sweet treats that are sure to satisfy your sweetie this Valentine's Day. Vote for Us in Baltimore Magazine's 2014 Best Restaurants Readers' Poll! Baltimore Magazine's 2014 Restaurant Readers' Poll asks "What are the best places to eat in Baltimore?" If you think that Miss Shirley's Cafe is one of them, then we need YOUR help! 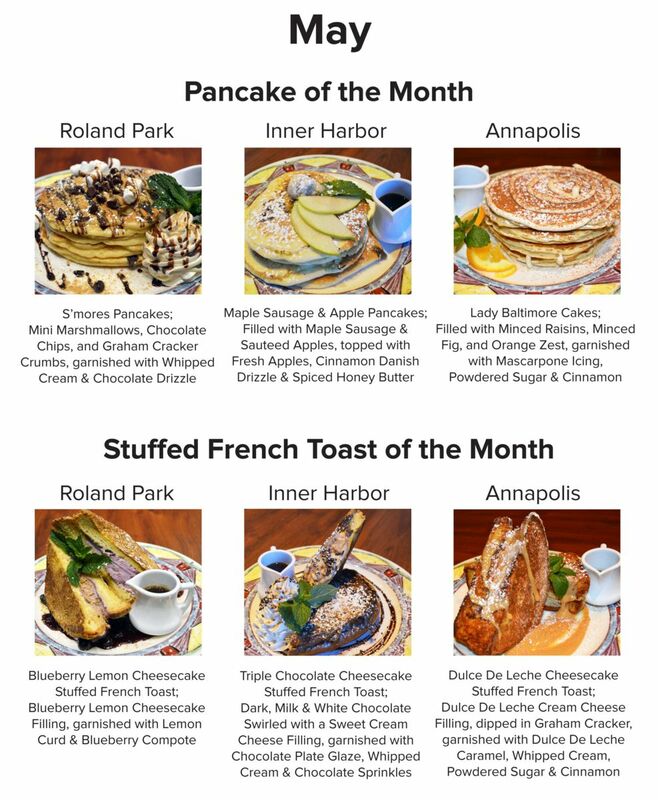 This month, Miss Shirley’s will be serving up the savory alongside the sweet, with our new Pancakes and French Toasts of the Month. 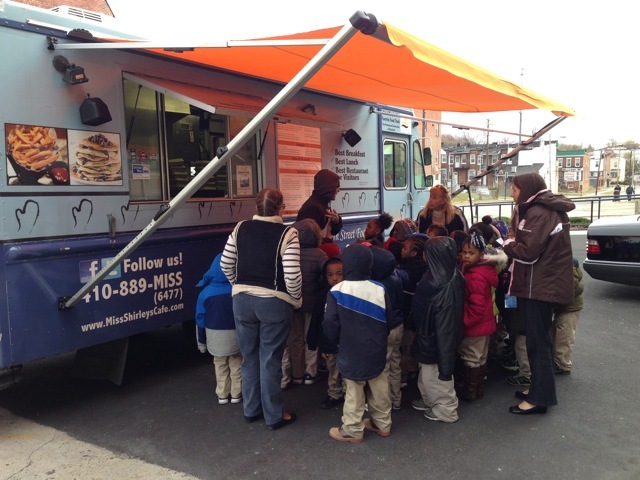 On November 21, 2013, Miss Shirley’s Food Truck had the opportunity to take a trip to Monarch Academy and share our knowledge of restaurant operations with a few of Monarch’s Kindergarten classes. As a part of the school’s project-based learning curriculum, the Kindergarteners were completing a unit on Restaurants, and we were able to give them a first-hand look at how our food truck operates. "View Entire Post" to read the whole story. Thanksgiving has passed, marking the start of the holiday season for Miss Shirley’s. 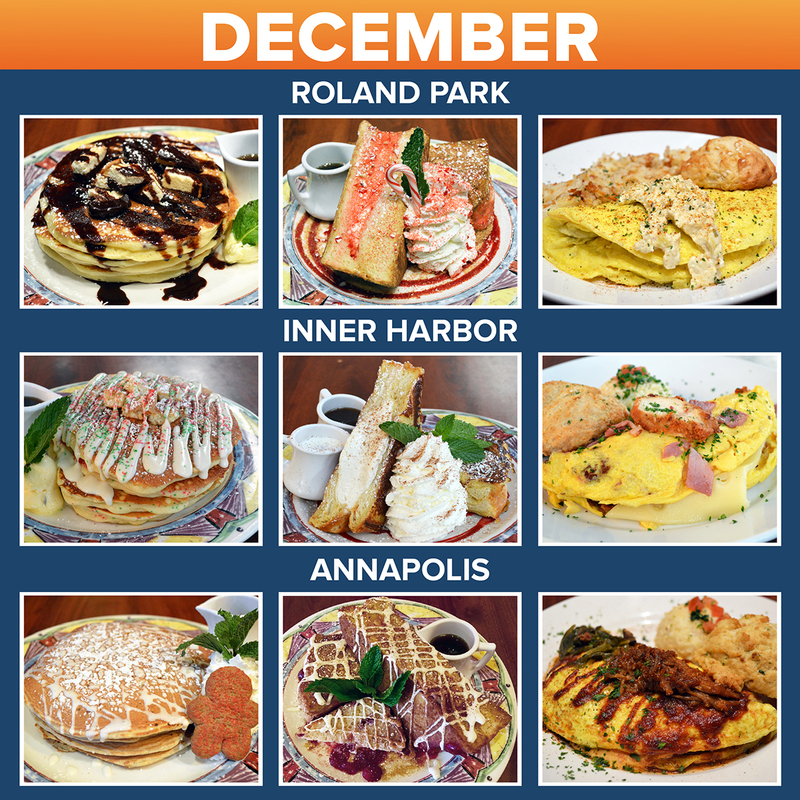 If Black Friday shopping and family time has left you feeling festive, our December Pancake and French Toast of the Months are just what you’re looking for. 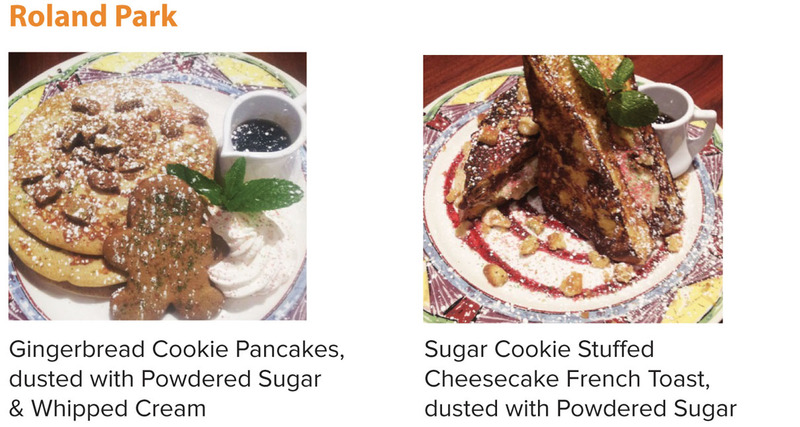 What better way to satisfy your sweet tooth this season than indulging in one of our delicious holiday-themed Pancake or French Toast dishes? We’re excited to announce that Miss Shirley’s Café was recently chosen for “Best Kids’ Menu” in Baltimore Magazine’s August 2013 “Best of Baltimore” issue. Summertime is in full swing. For us this means it’s time for Old Bay Waffles, Mardi Gras Muffulettas and delicious Orangesicle Cream Crushes! Our emphasis on fresh ingredients and our unique Baltimore twist on ‘southern eclectic’ cuisine has continued to have guests coming back time and time again. Kicking off the Season with a NEW Spring Menu! New Spring/Summer items include a Chicken Fried Pork Chop, the Born on the Bay-O Eggs Benedict and Old Bay Waffles. 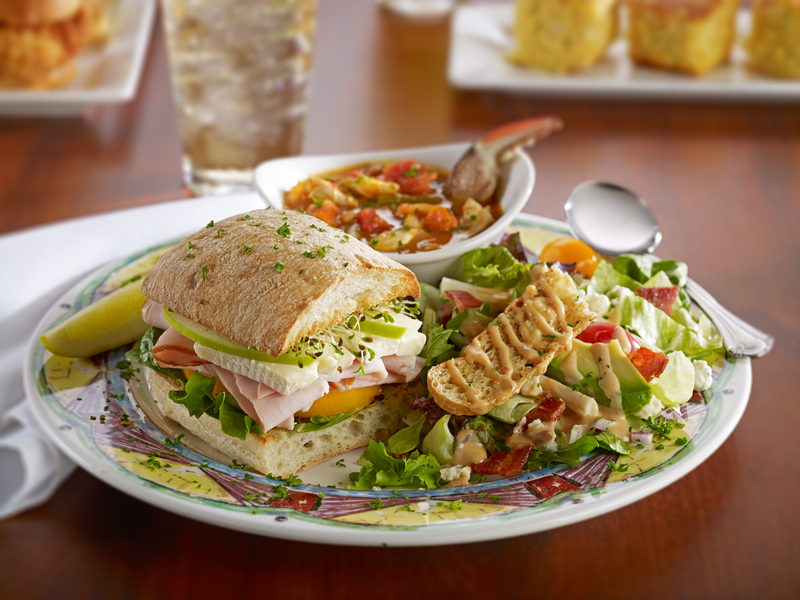 Shirley's Power Greens Salad, the Savannah Salad and a Big Easy Muffuletta Chef Salad freshen up the selection of greens. New Sandwiches include the North Meets South Melt, Mardi Gras Muffuletta, Upstream Salmon Salad Club, Crabby Deviled Egg Salad and Low Country Chop. 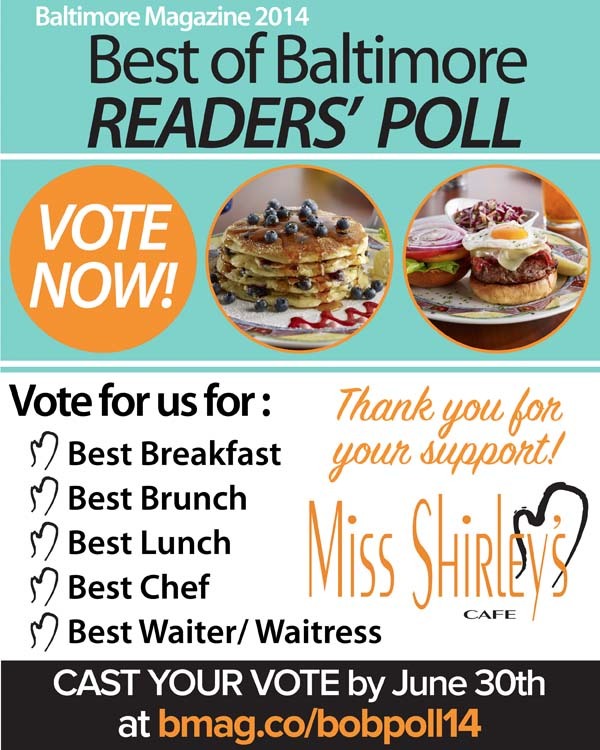 Miss Shirley’s Café would like to give a big ‘Thank You!’ to all of our loyal guests and friends who voted for us in Baltimore Magazine’s 2013 Best of Baltimore Readers’ Poll.